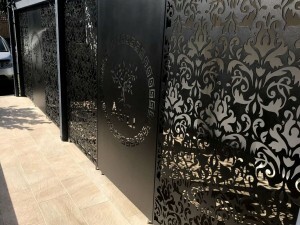 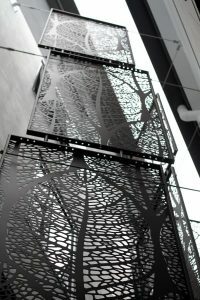 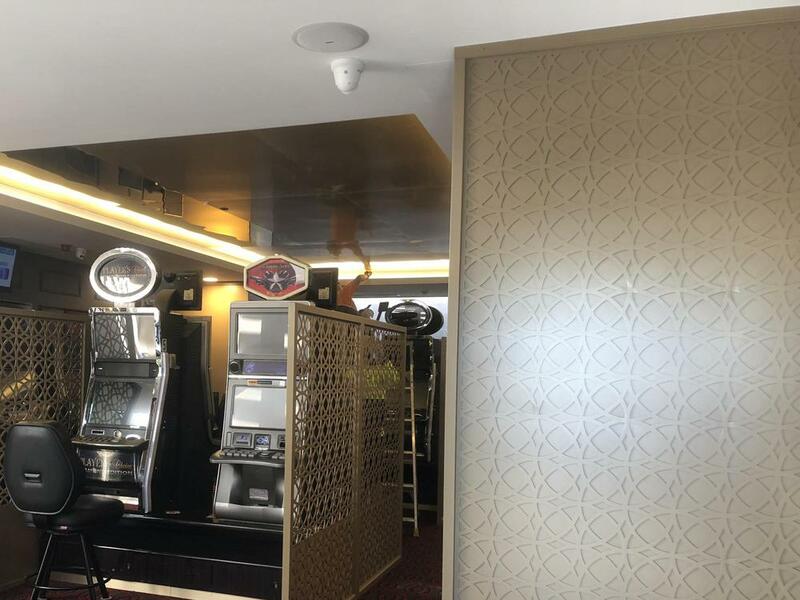 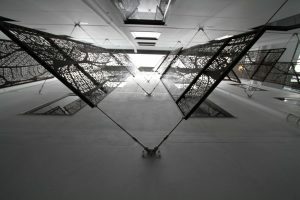 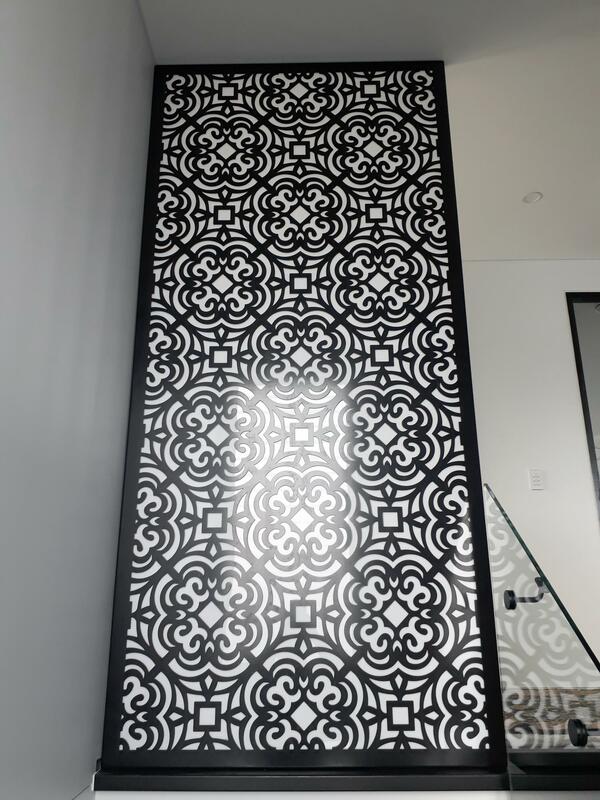 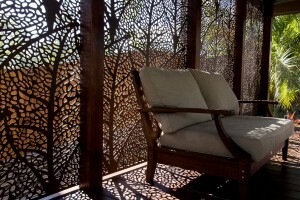 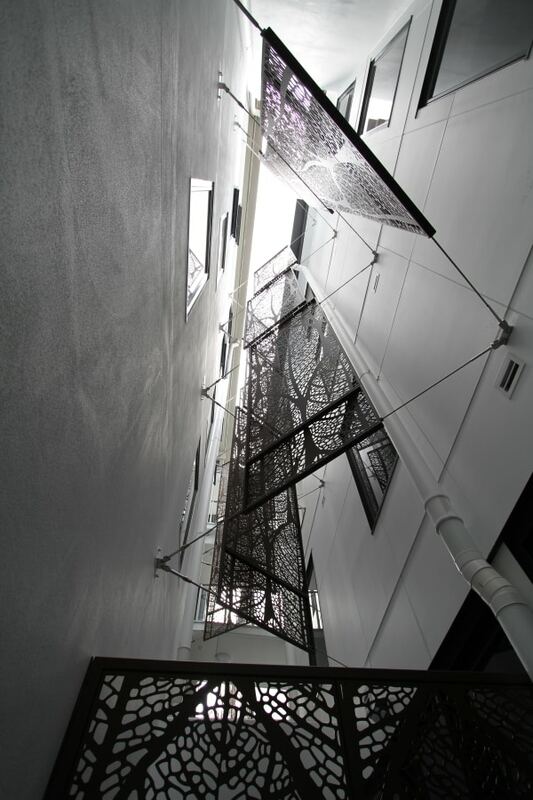 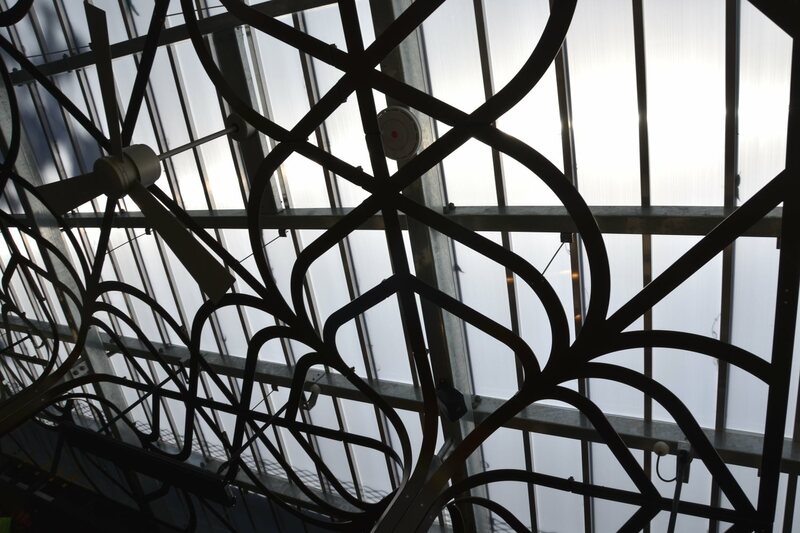 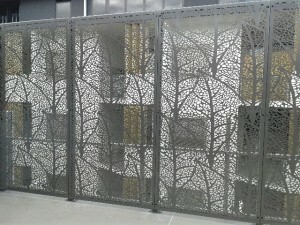 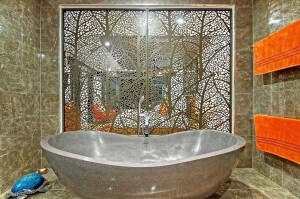 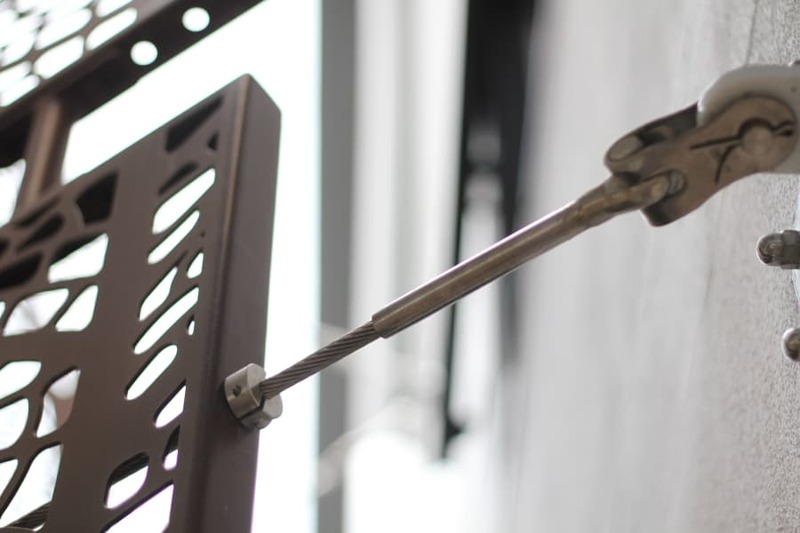 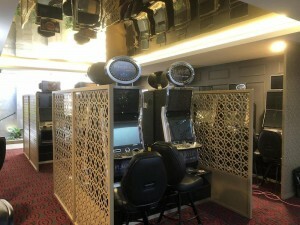 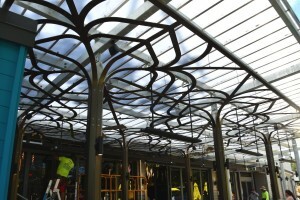 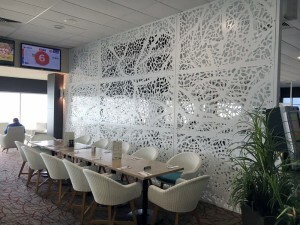 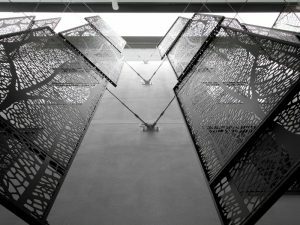 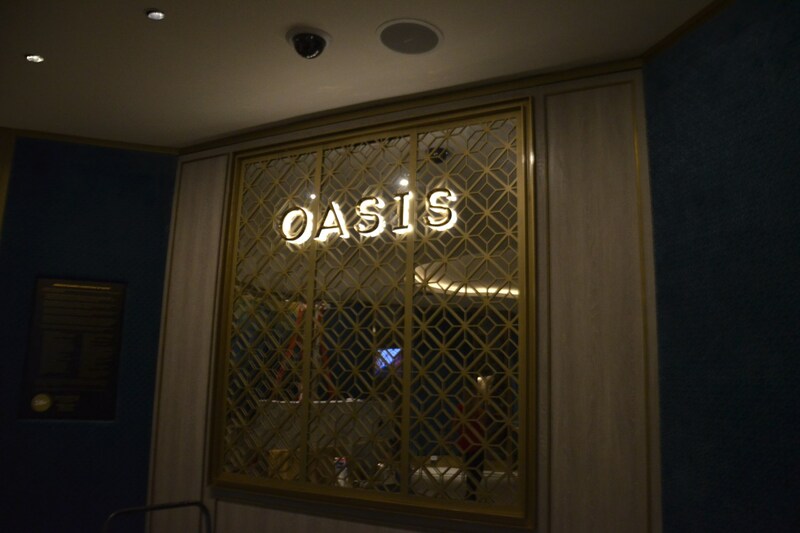 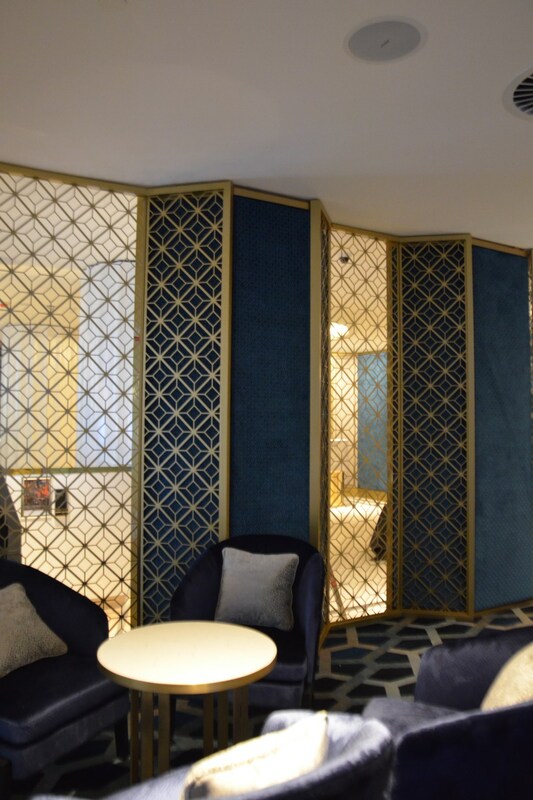 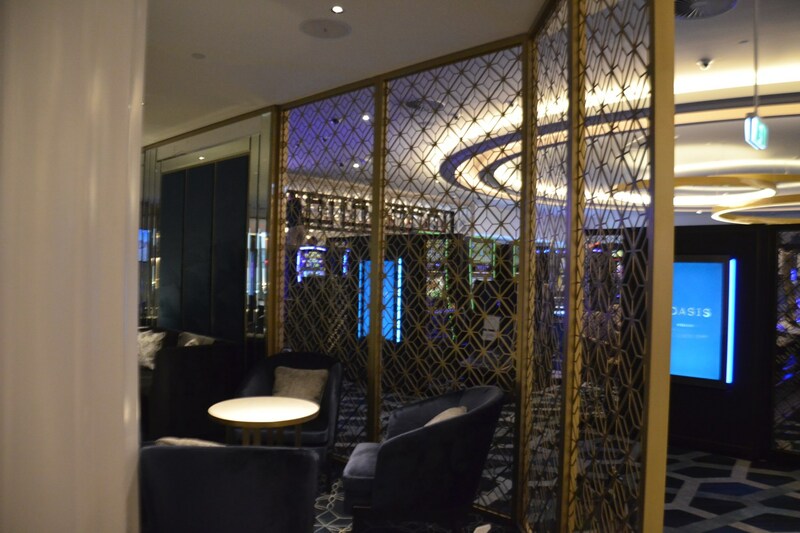 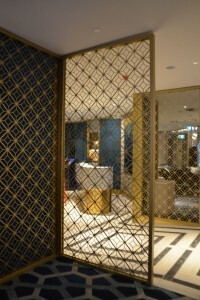 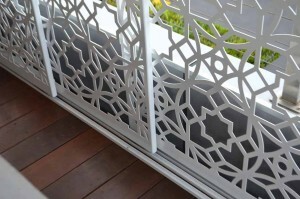 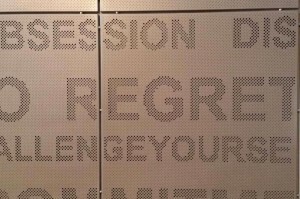 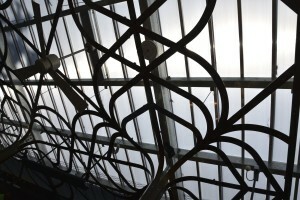 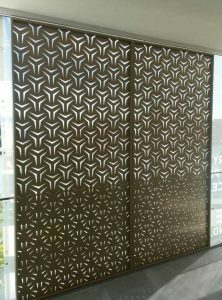 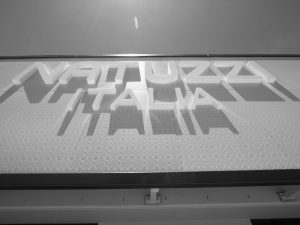 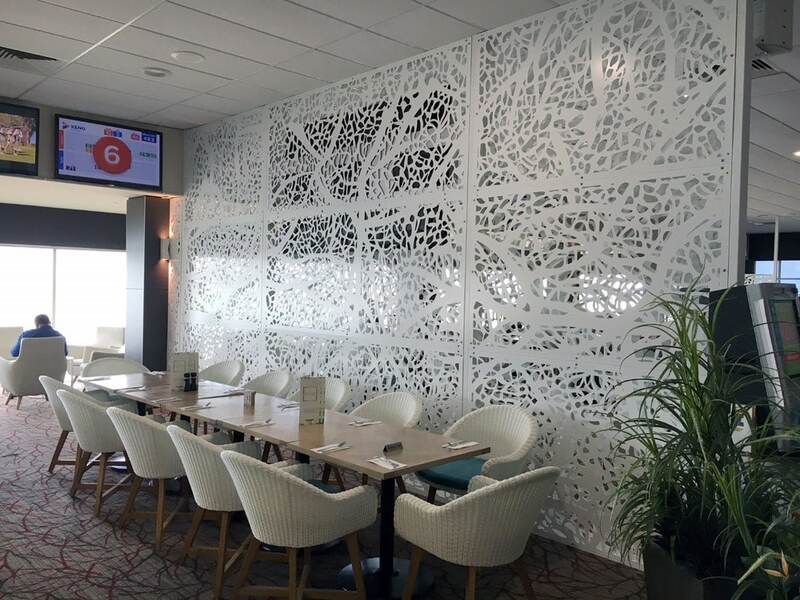 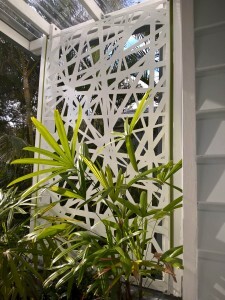 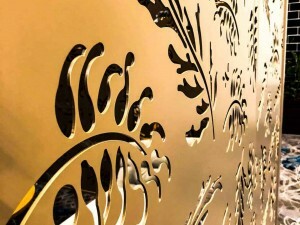 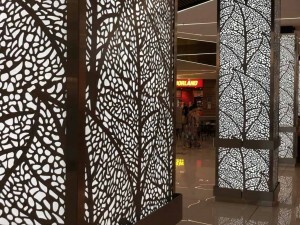 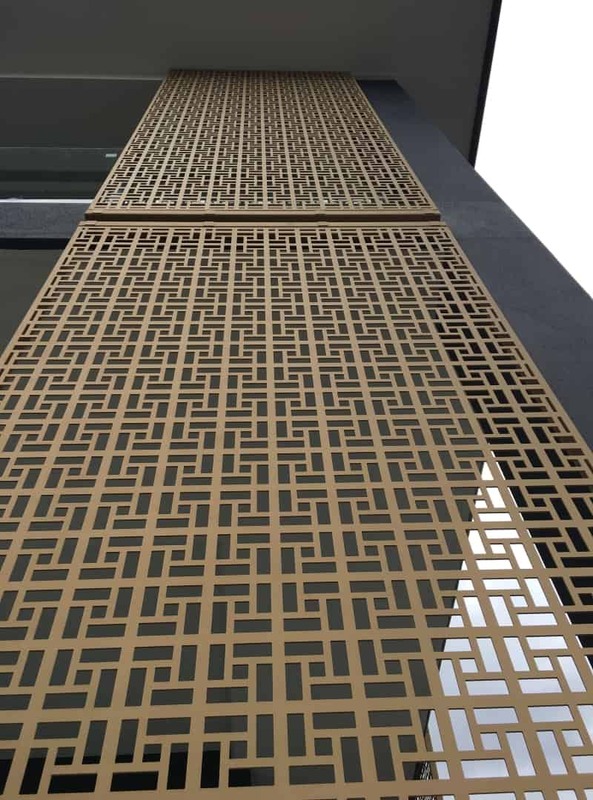 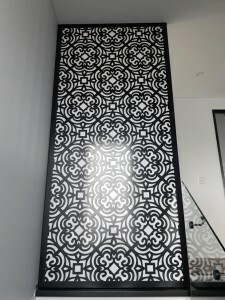 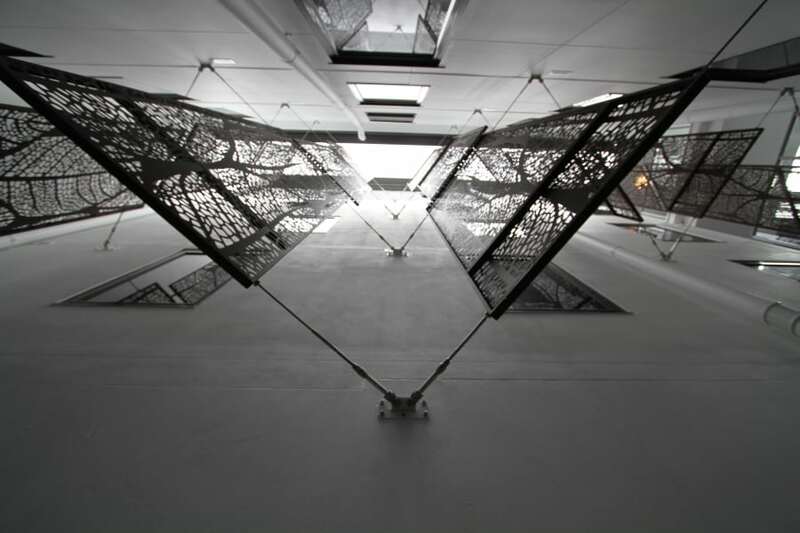 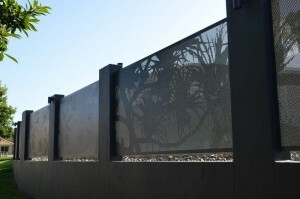 All our Commercial Laser Cut Decorative Screen Projects are managed from start to finish by DSD’s projects team. 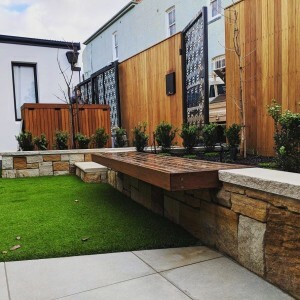 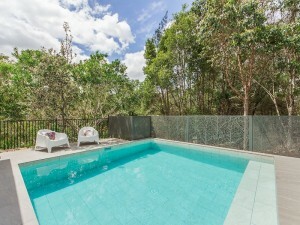 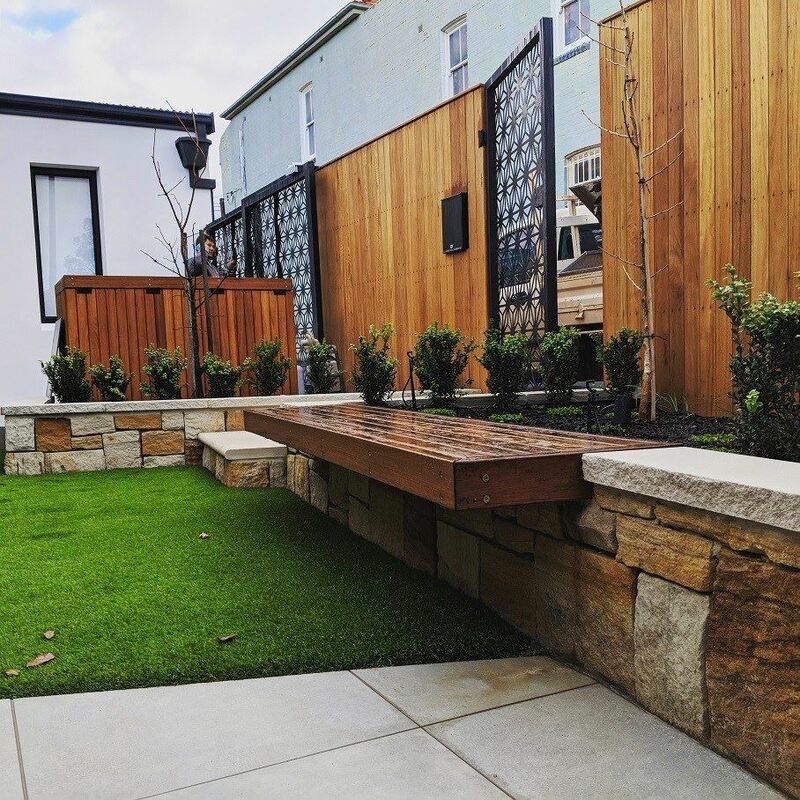 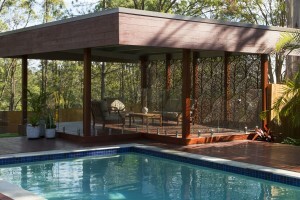 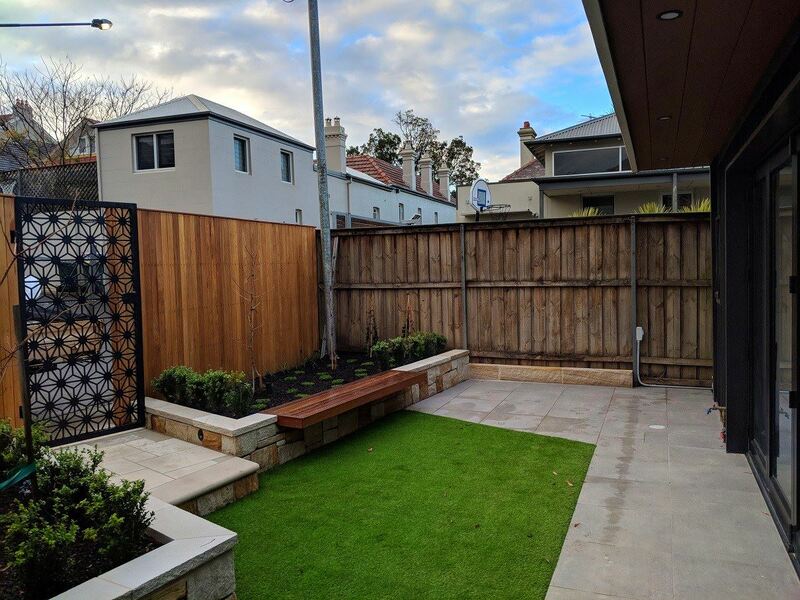 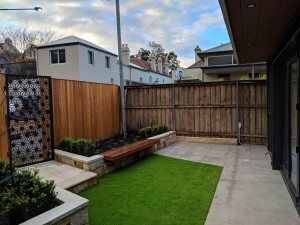 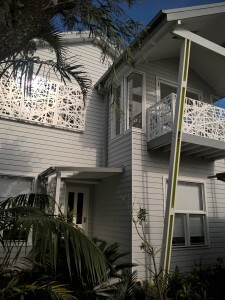 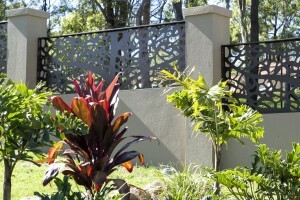 We pride ourselves in offering a complete solution to architects, landscapers and builders alike. 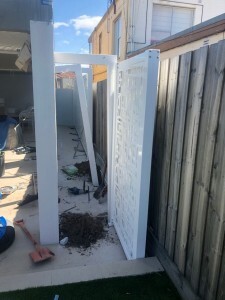 Contact Us today to see how we can help you. 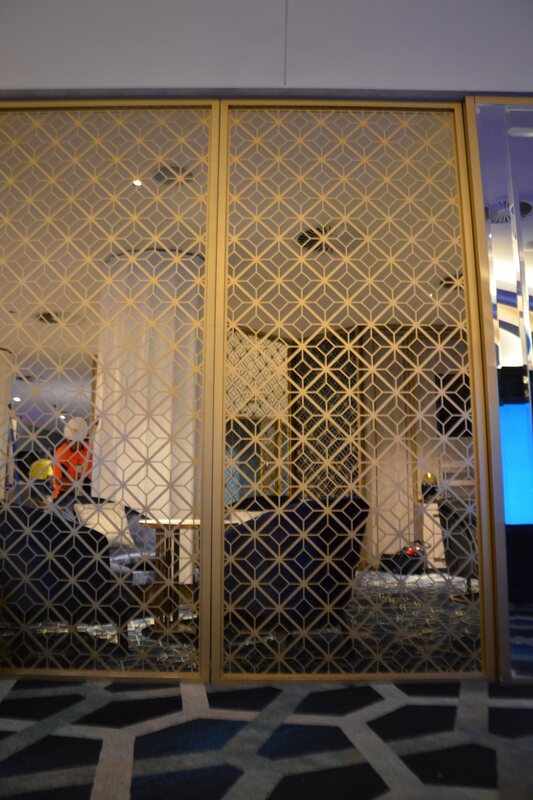 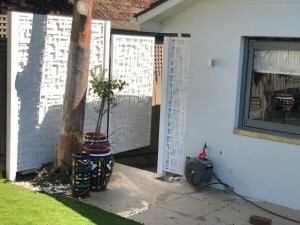 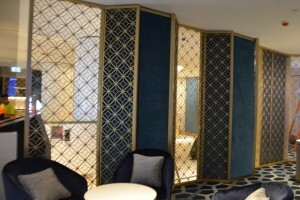 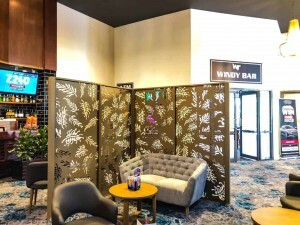 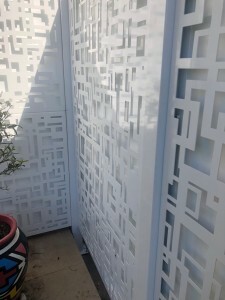 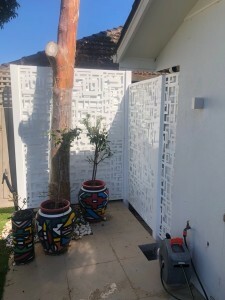 Custom decorative room divider and privacy screen panels. 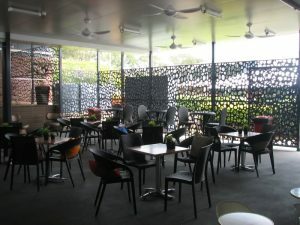 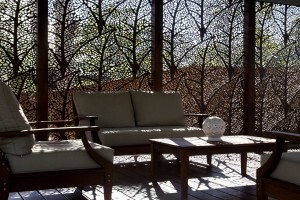 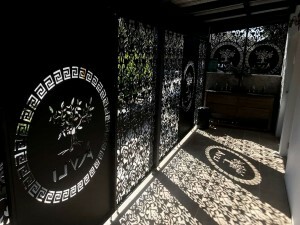 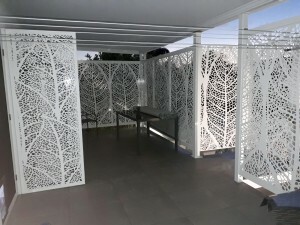 Lace Circles decorative room divider and privacy screen panels. 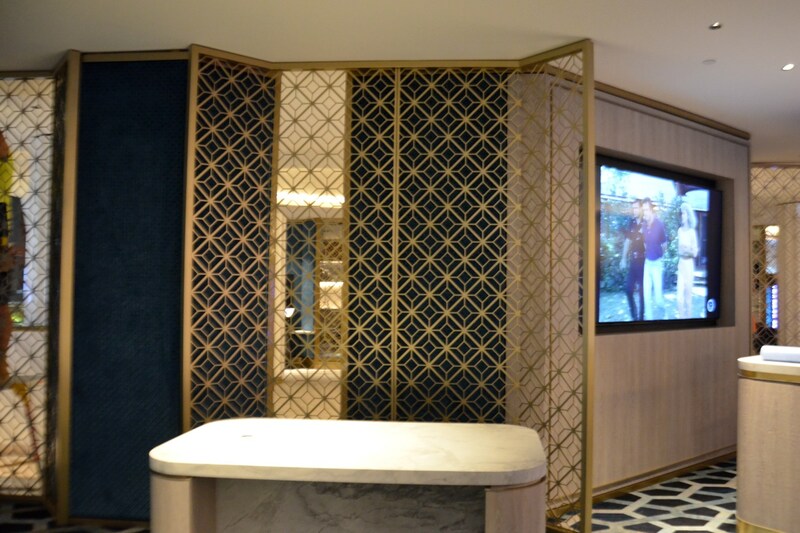 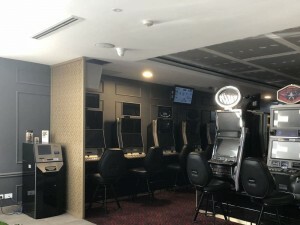 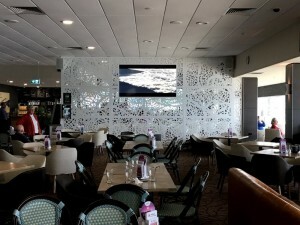 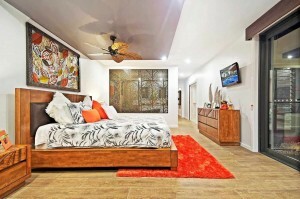 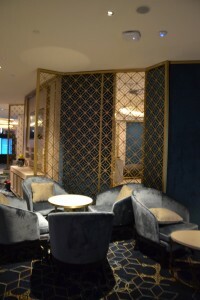 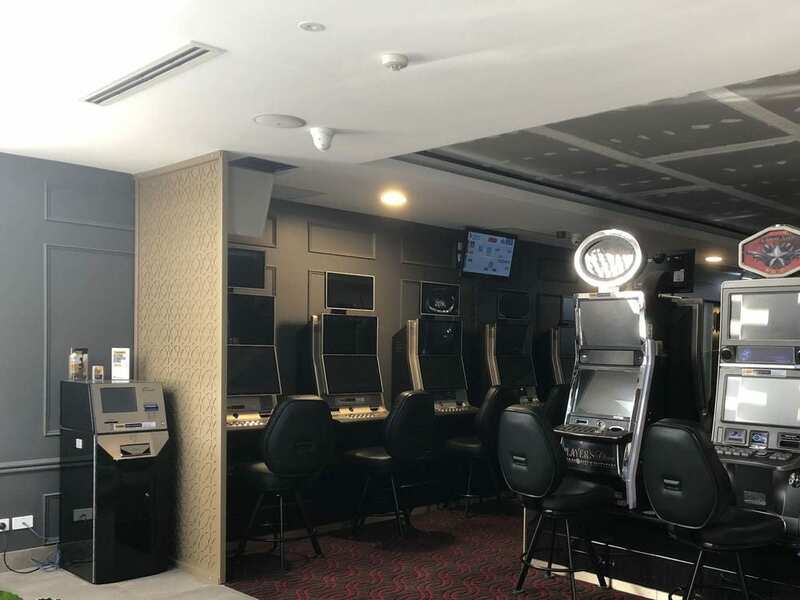 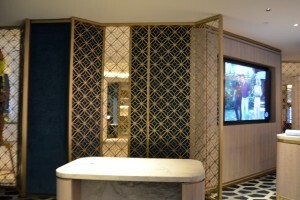 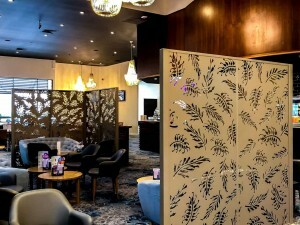 Mollymook Golf Club Custom Room Divider with custom in-built TV unit and frame. 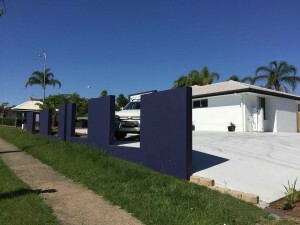 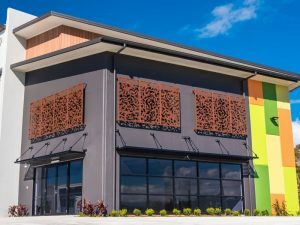 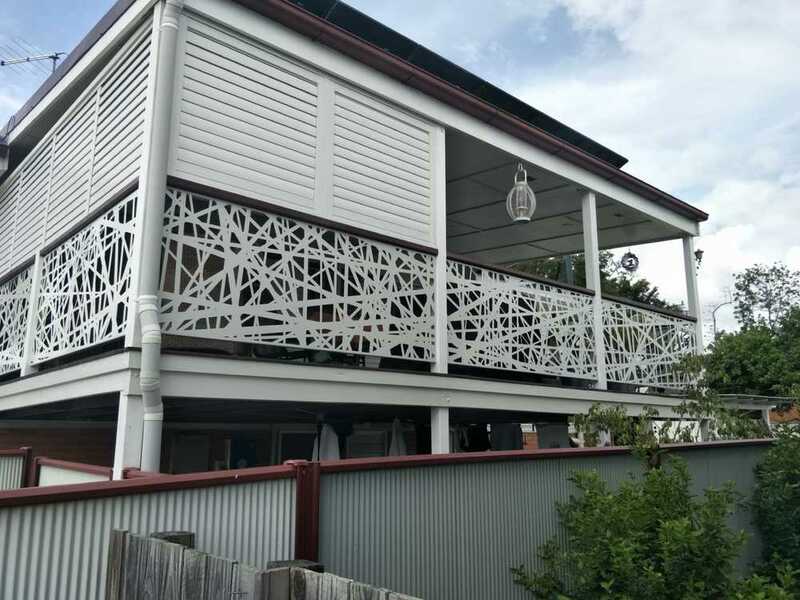 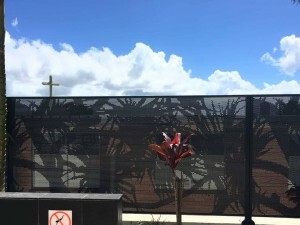 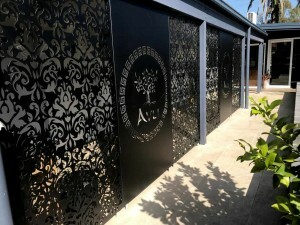 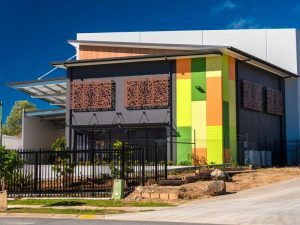 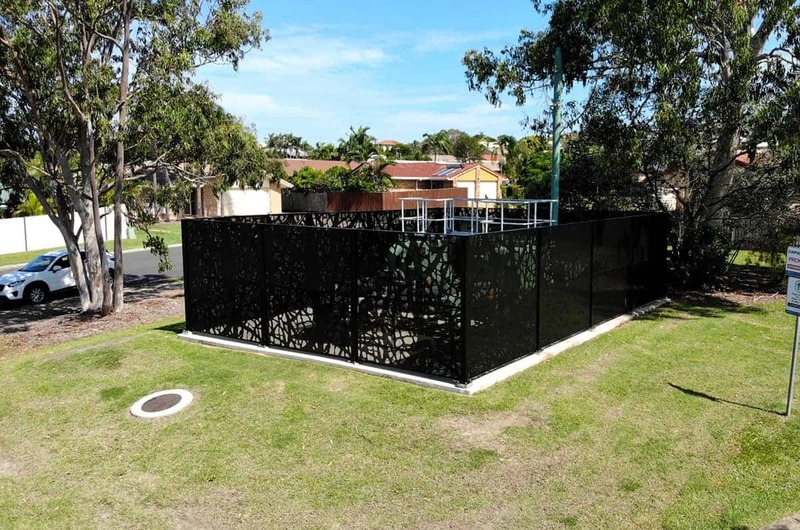 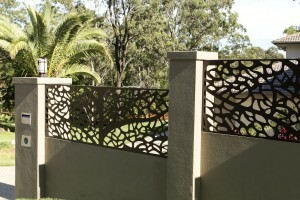 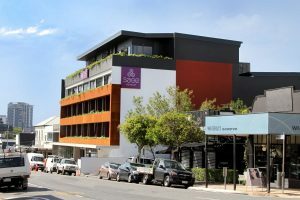 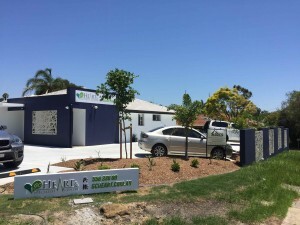 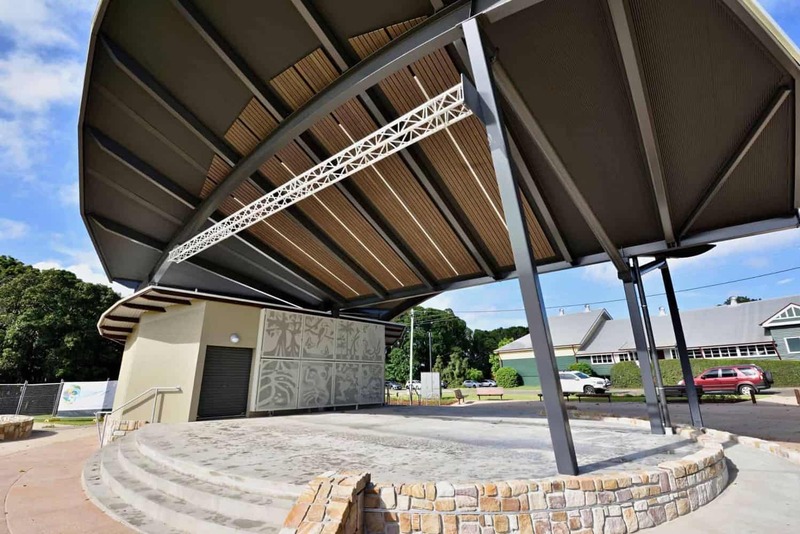 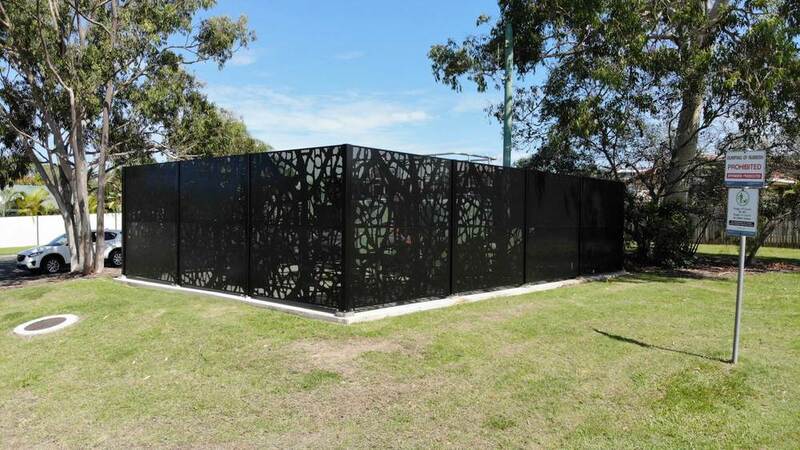 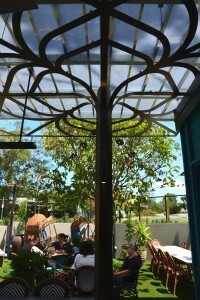 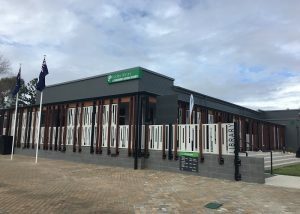 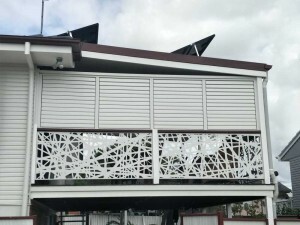 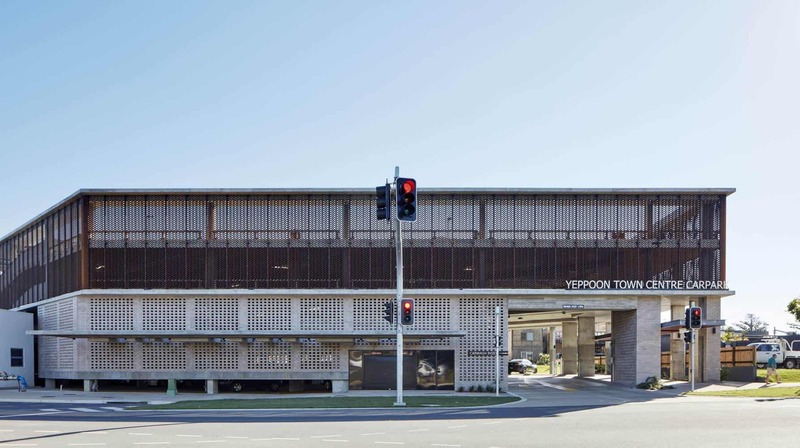 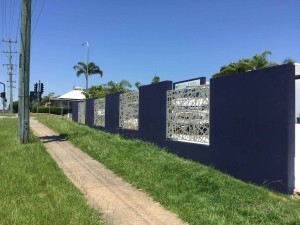 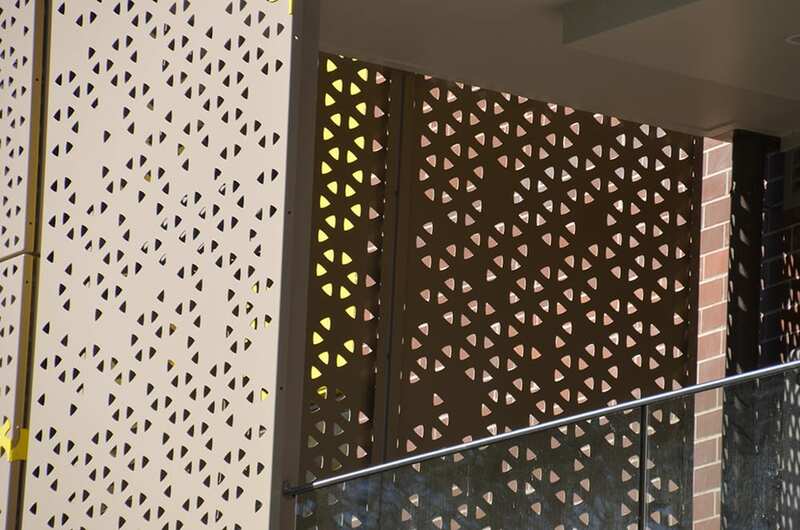 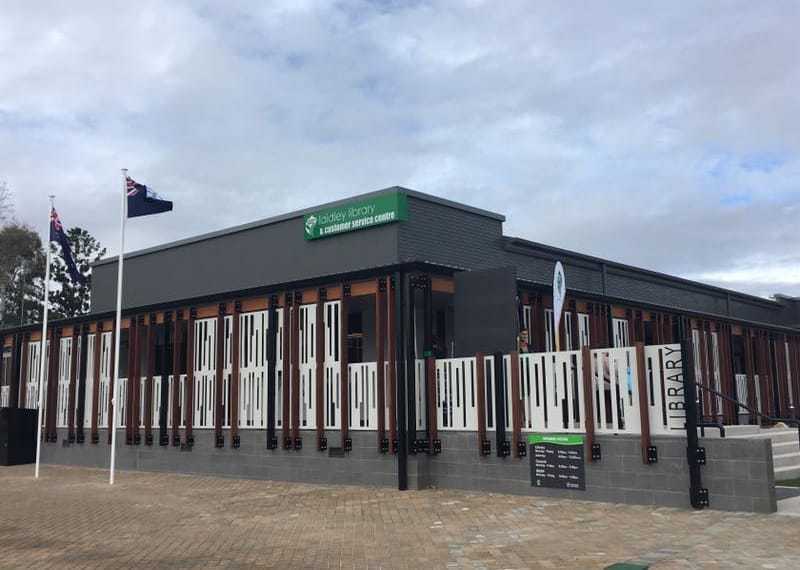 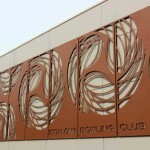 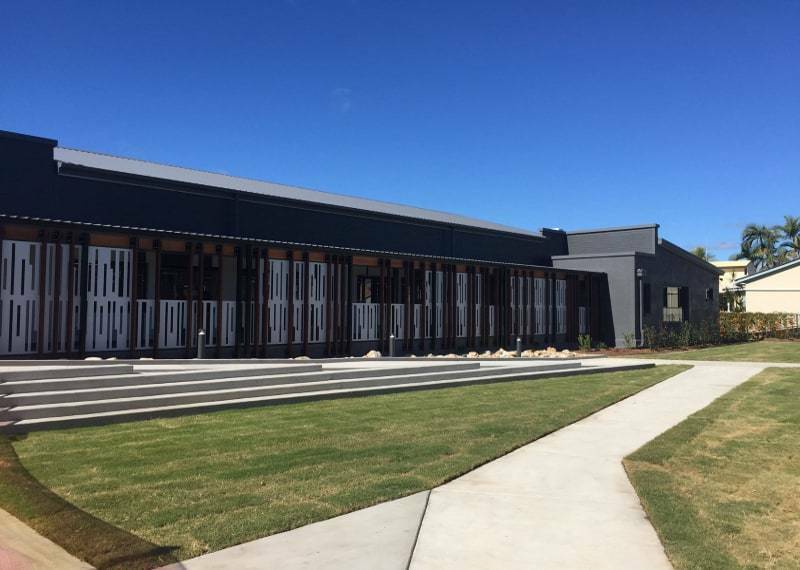 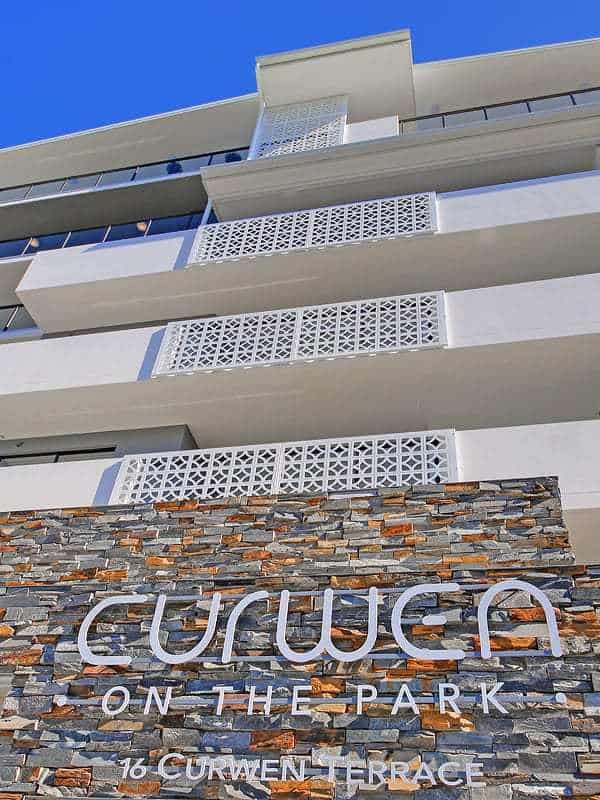 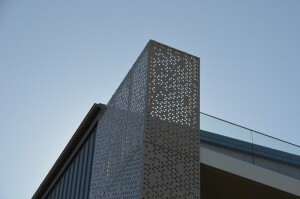 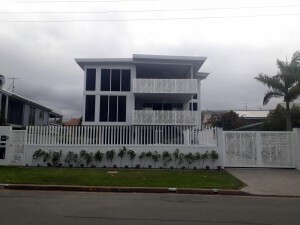 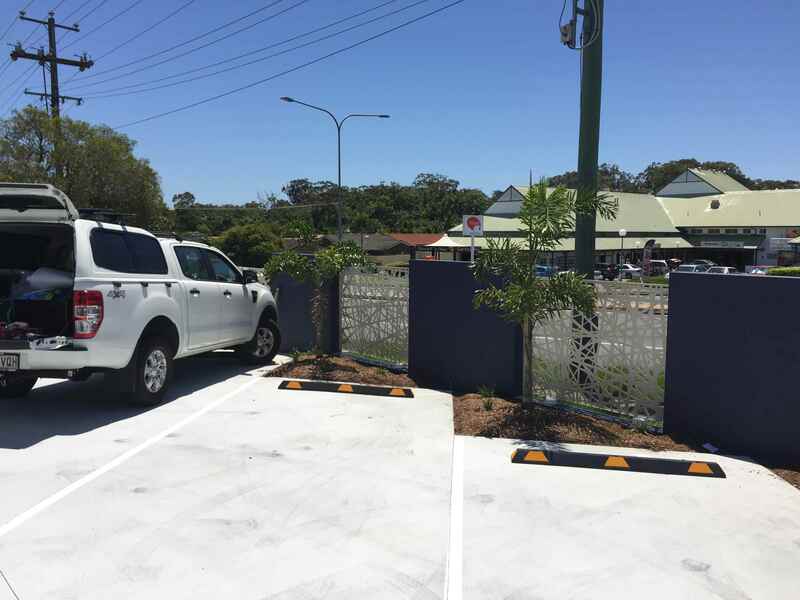 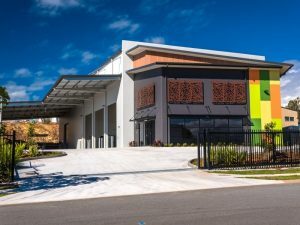 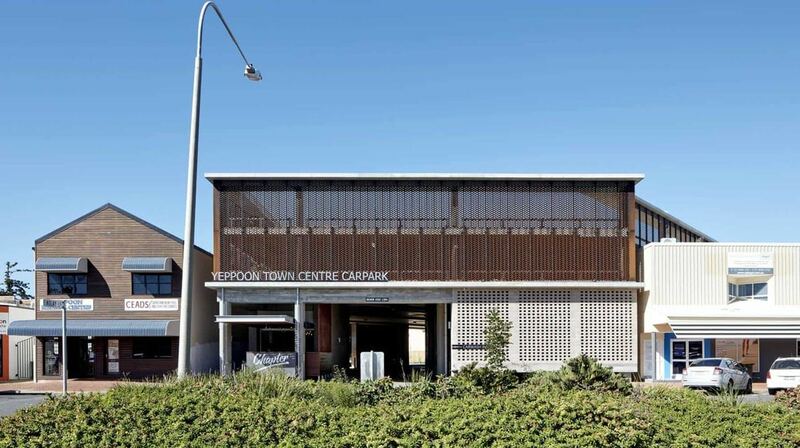 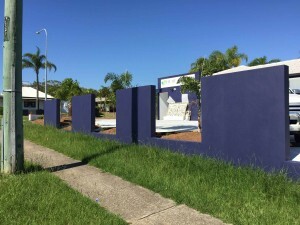 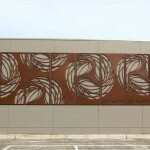 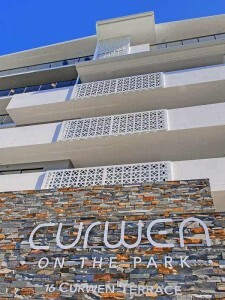 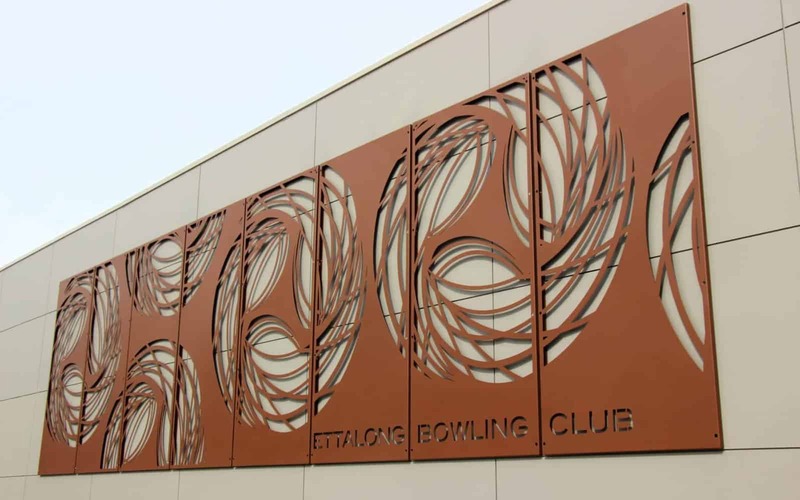 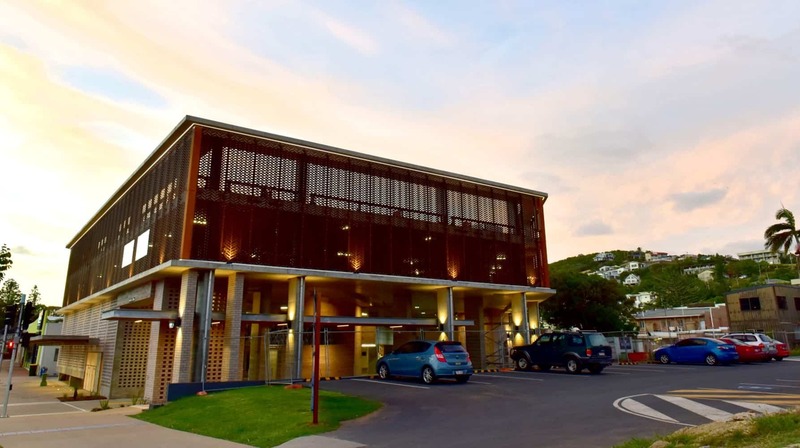 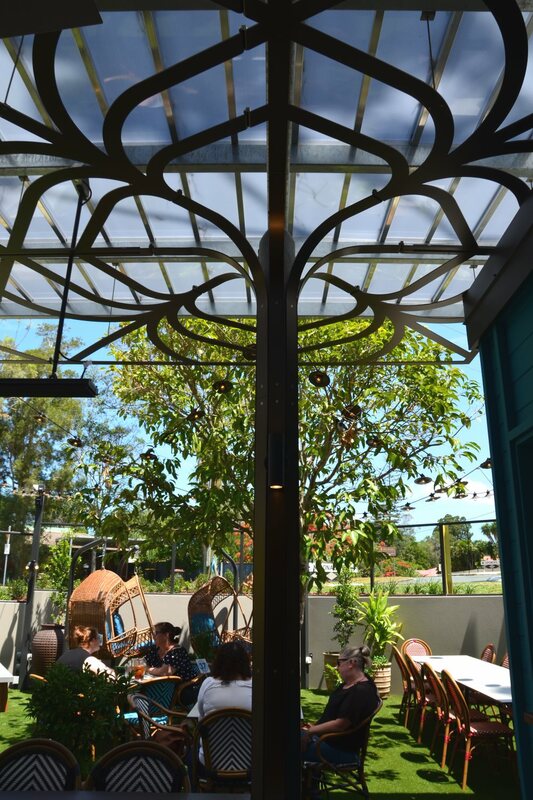 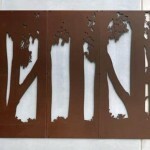 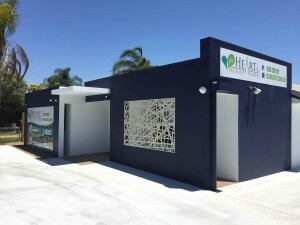 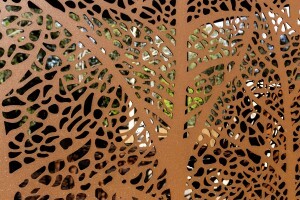 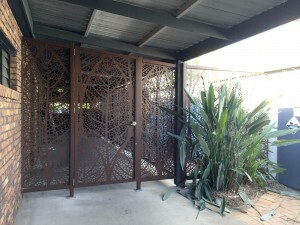 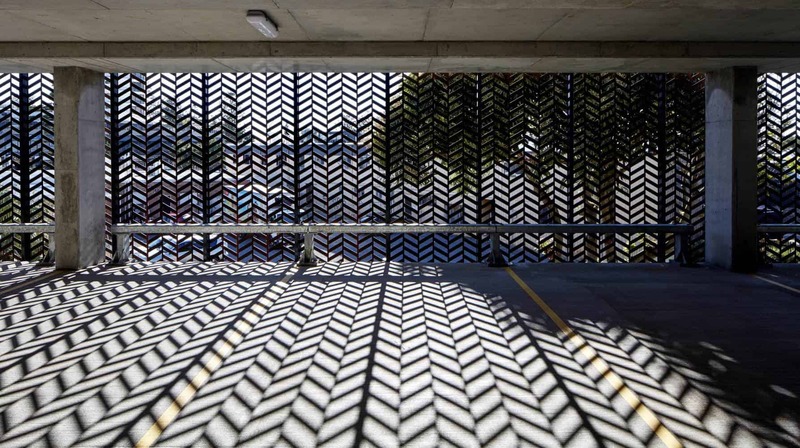 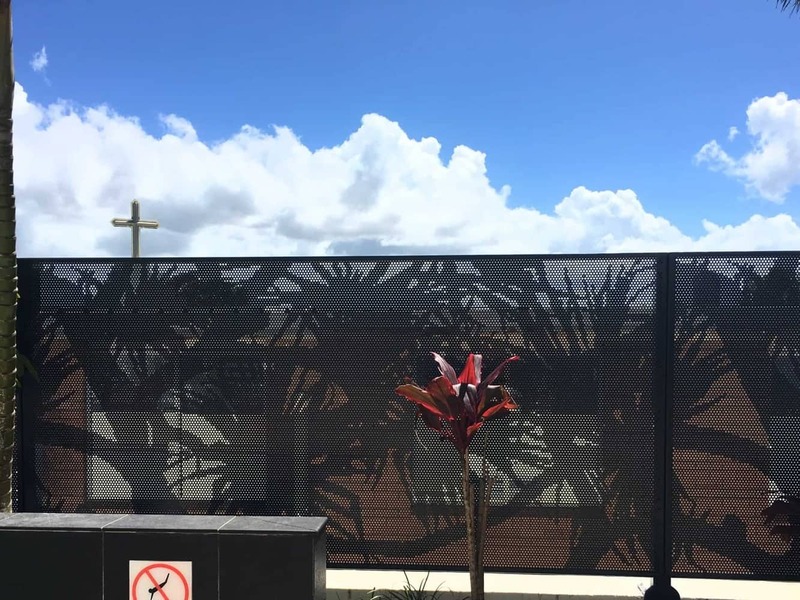 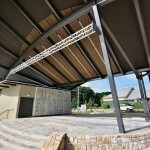 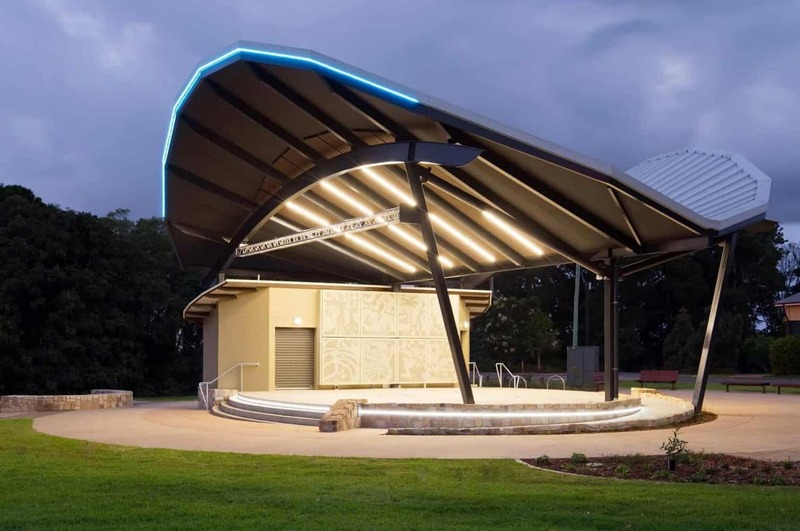 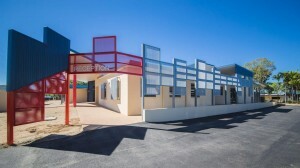 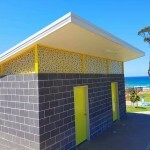 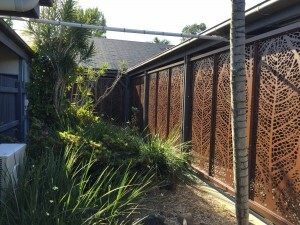 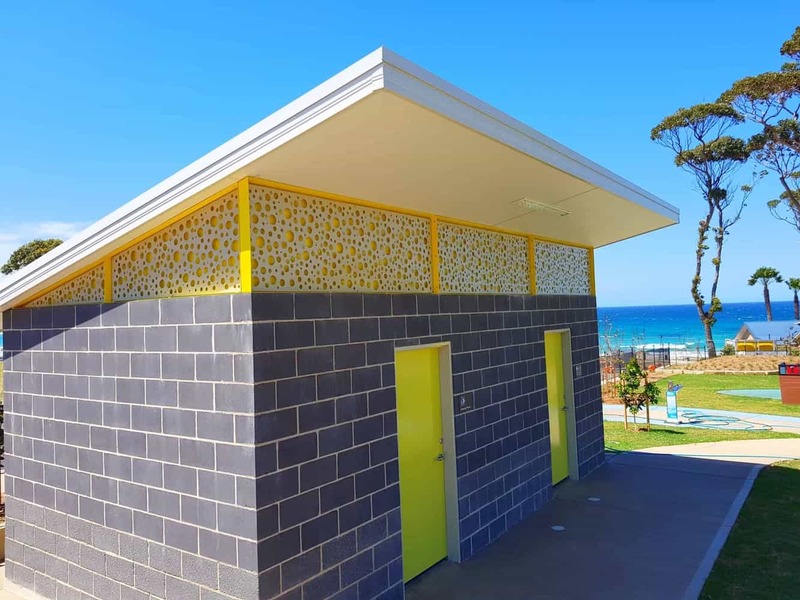 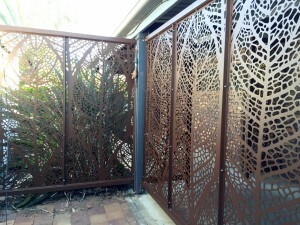 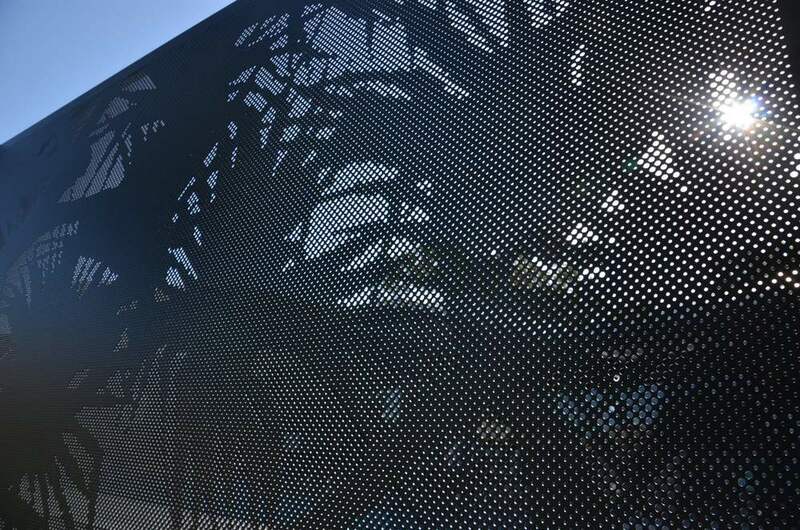 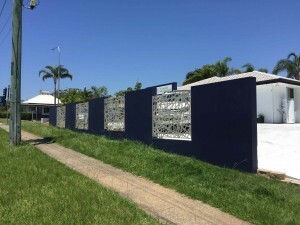 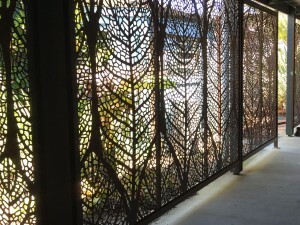 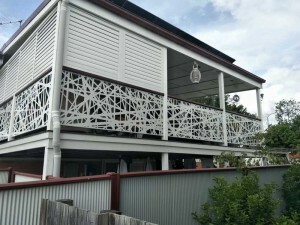 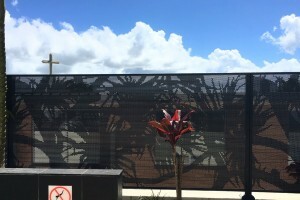 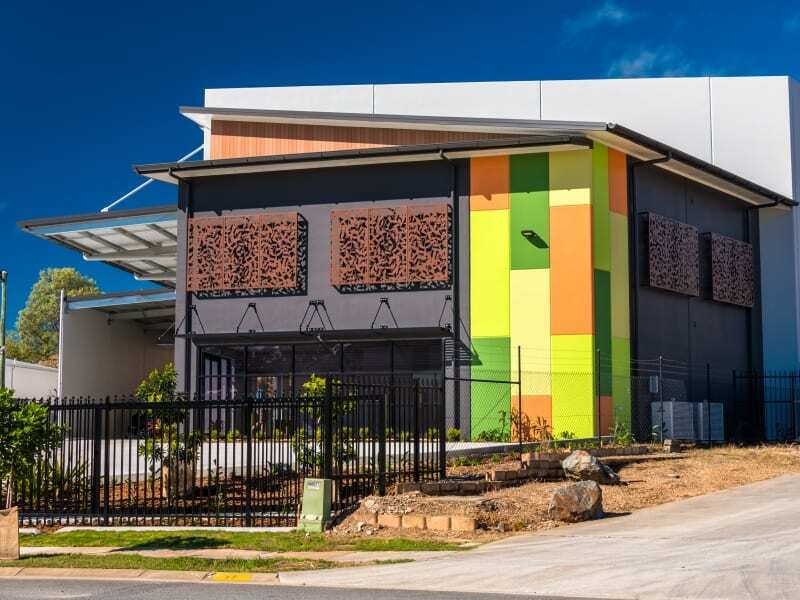 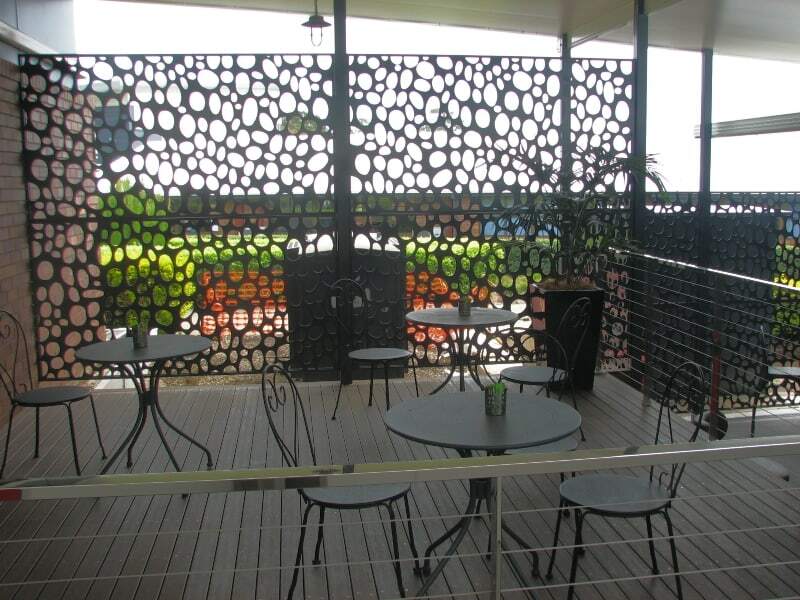 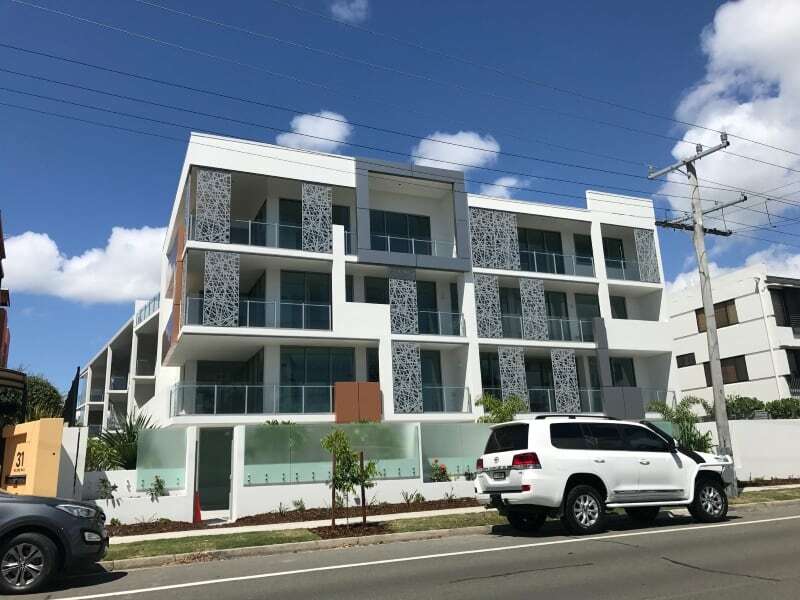 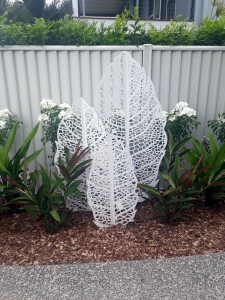 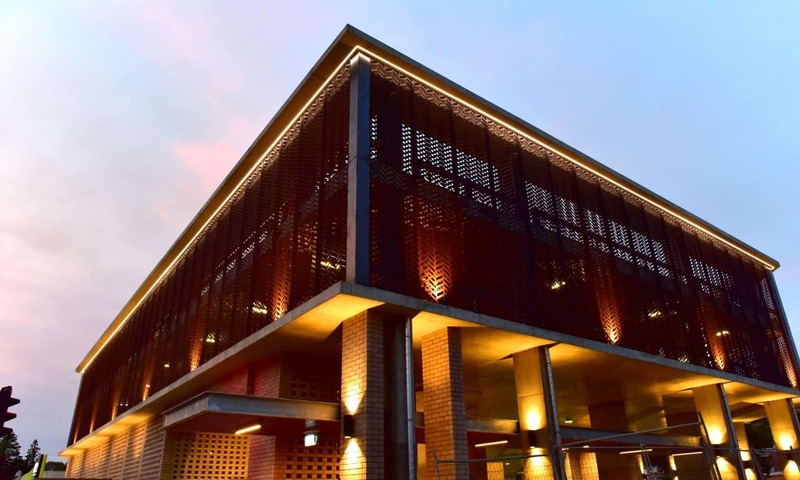 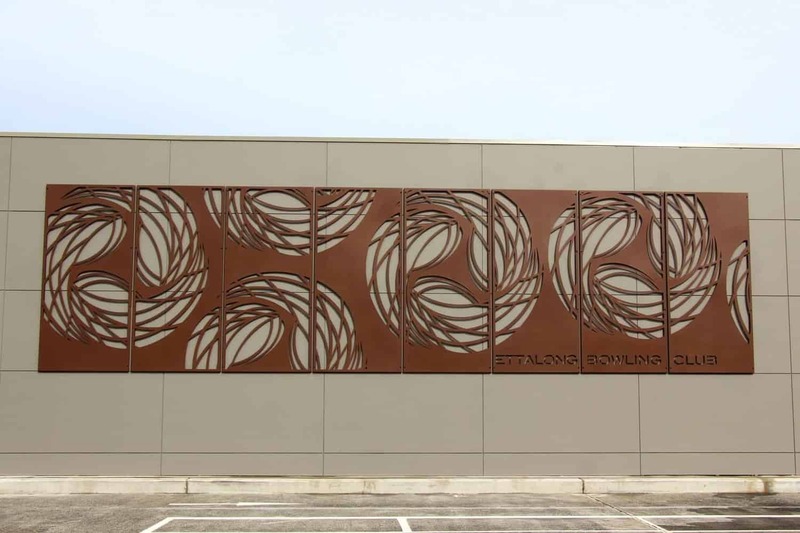 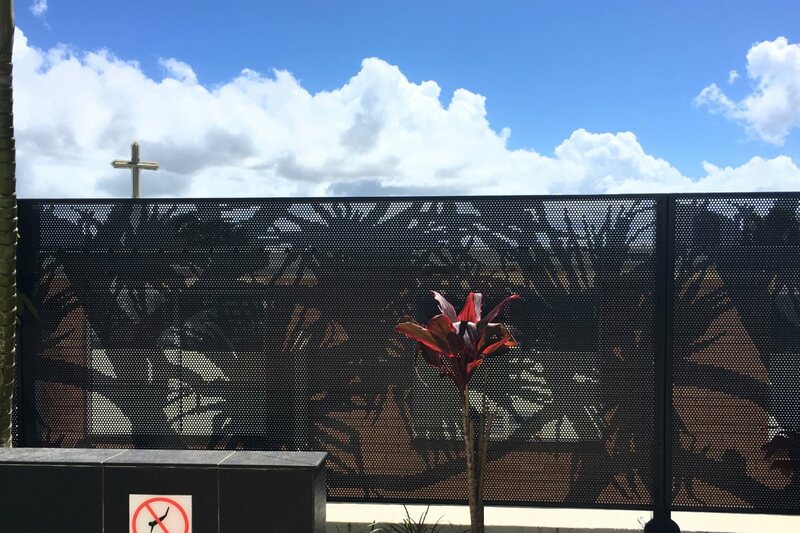 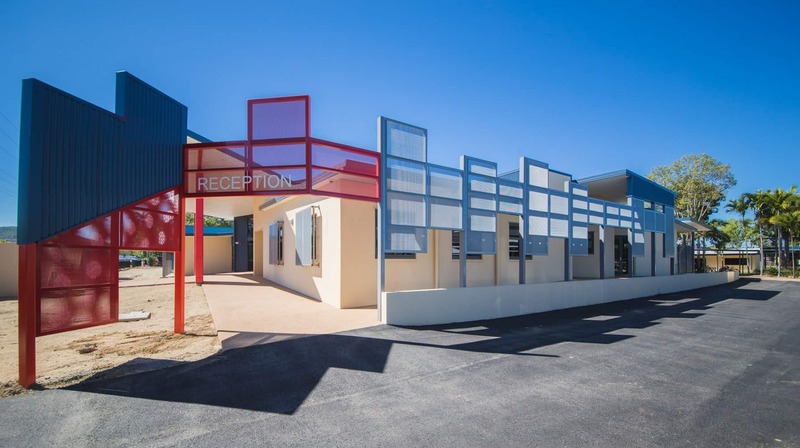 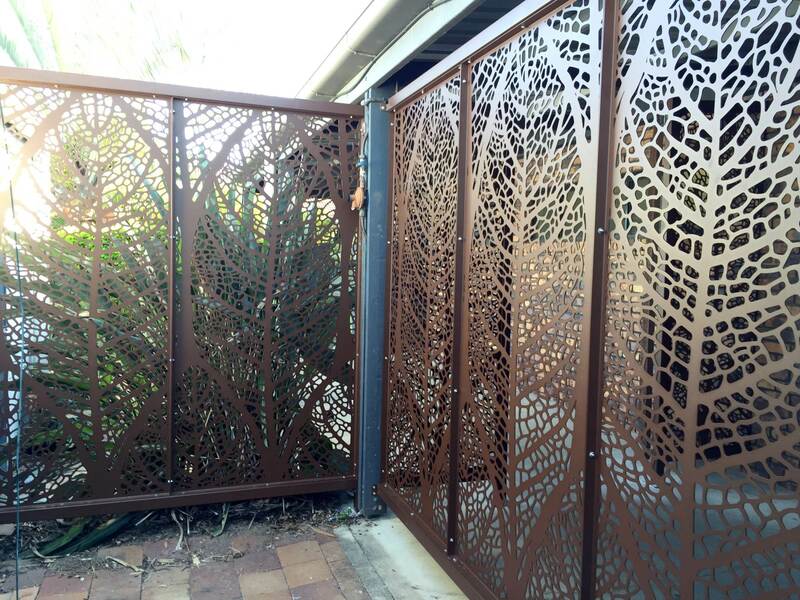 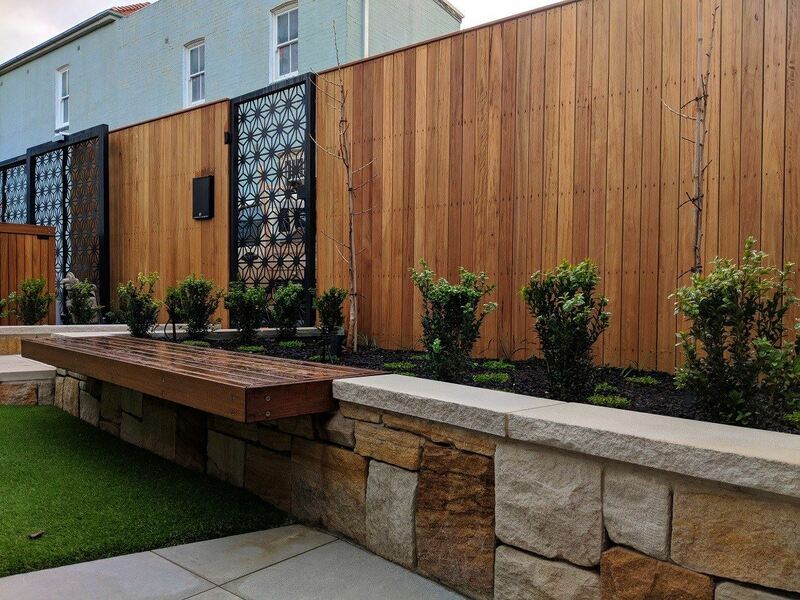 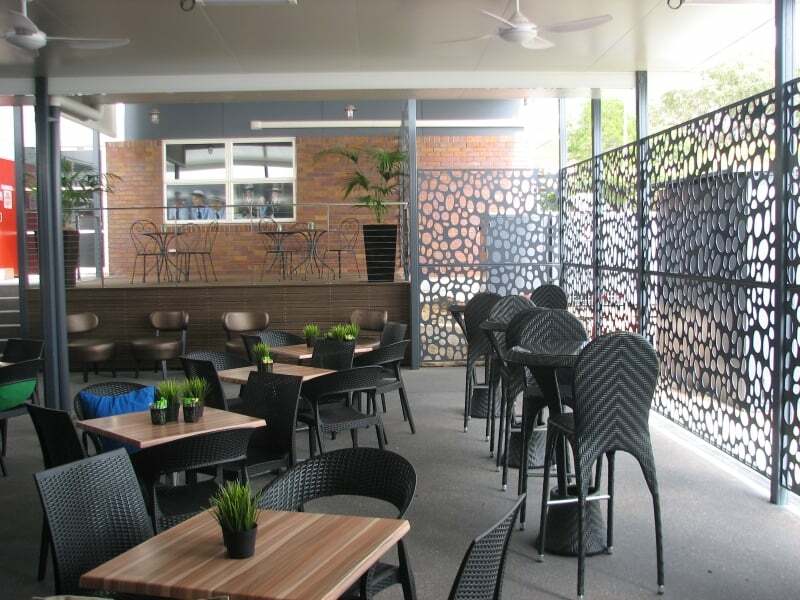 Griffin Builders – Yeppoon Town Centre Carpark Custom design laser cut decorative Corten building facade. 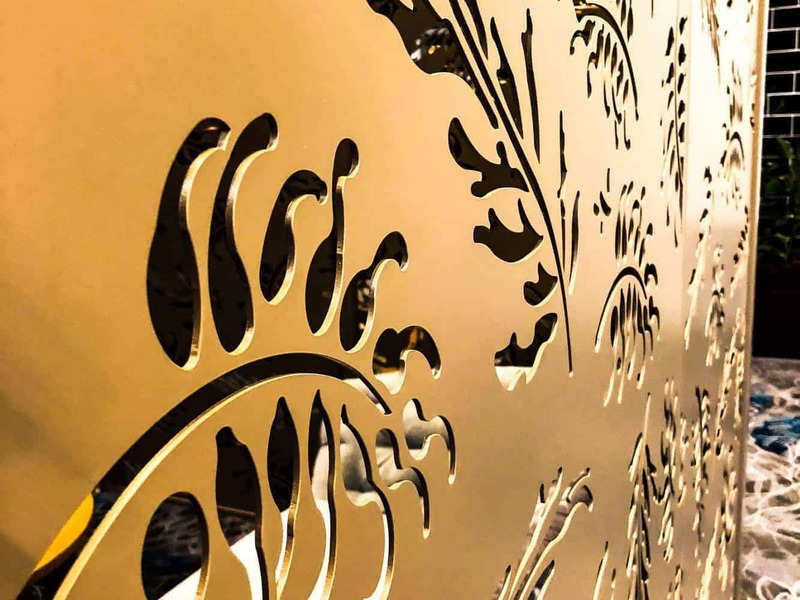 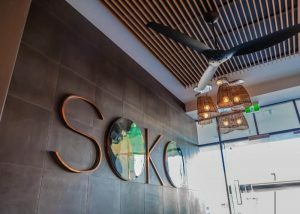 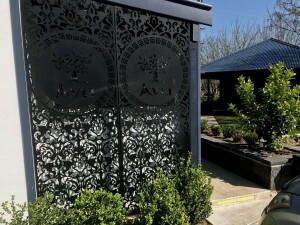 The Damask design used for this restaurant gives a stylish and subtle connection to Greek mythology and culture. 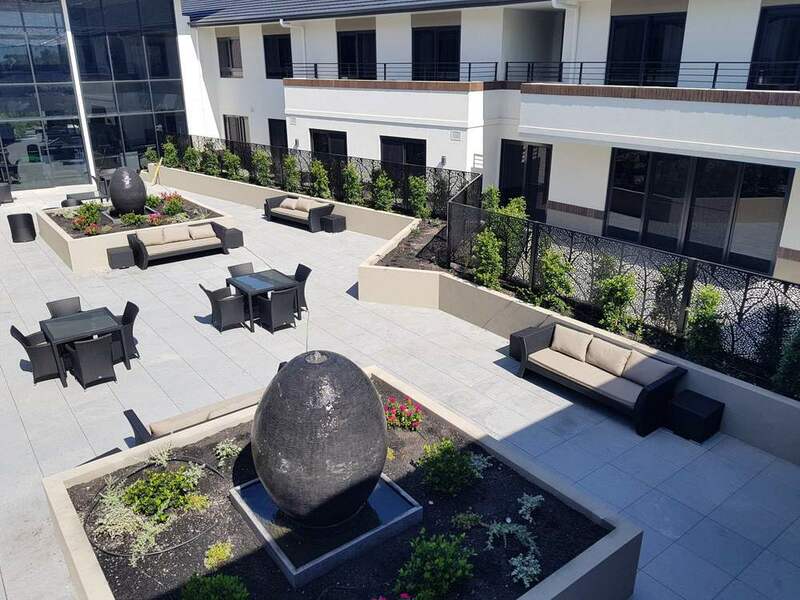 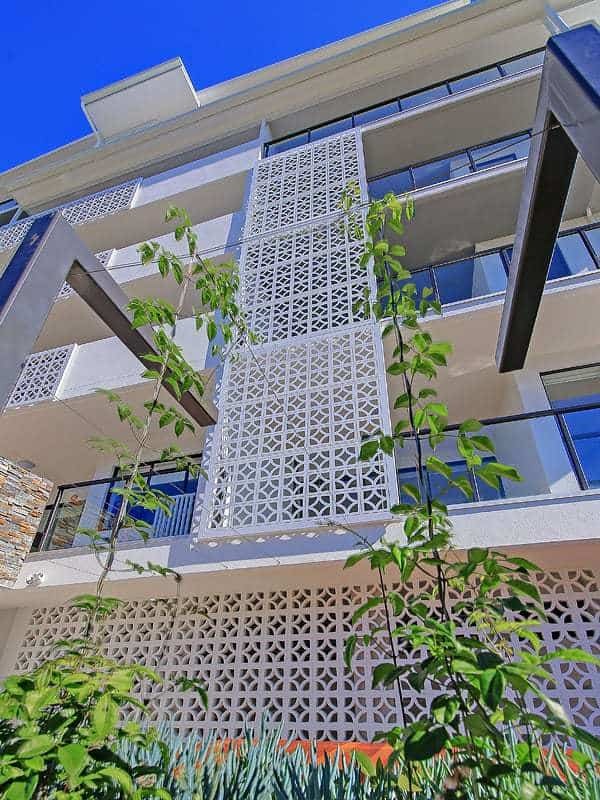 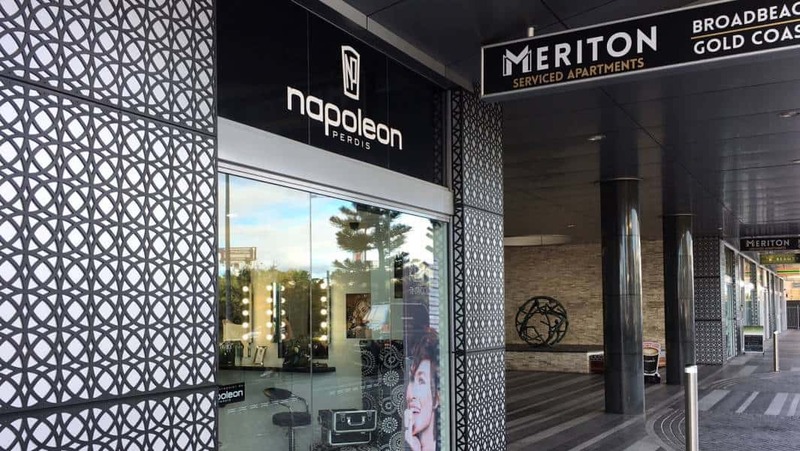 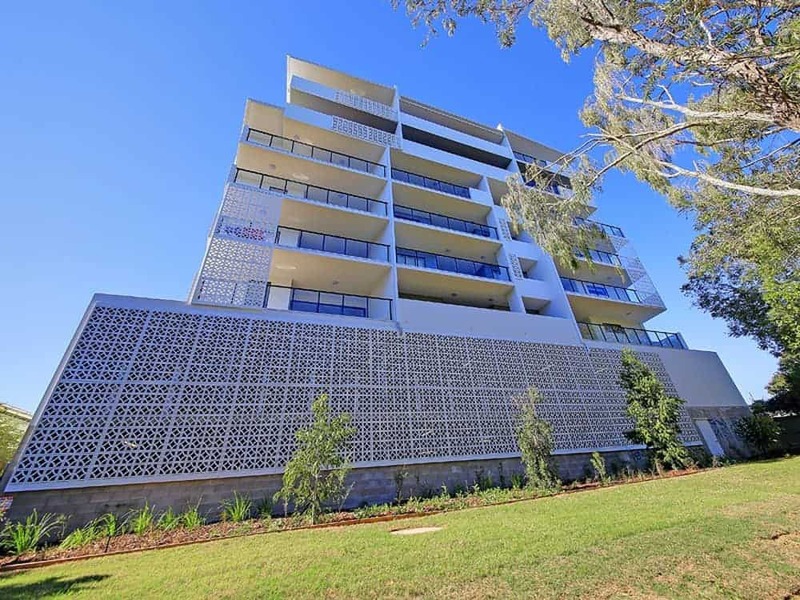 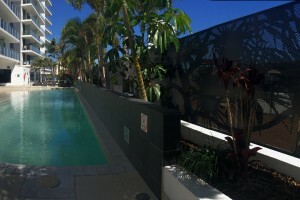 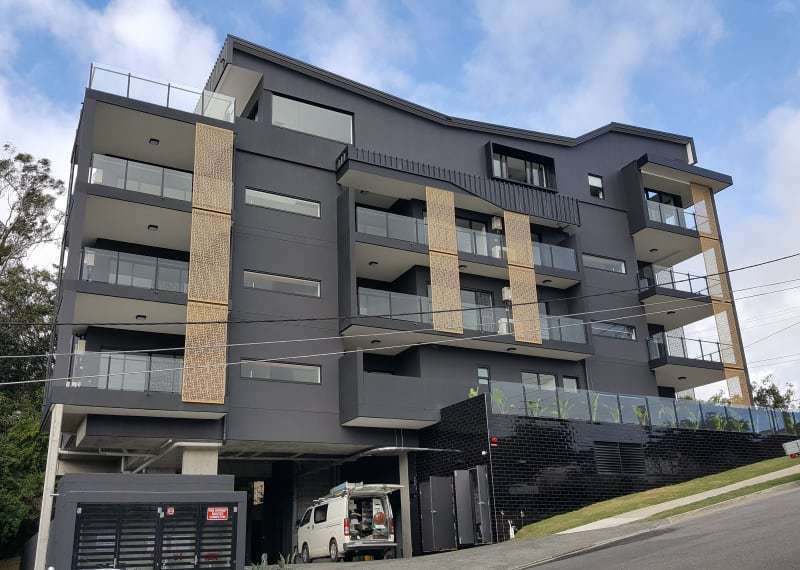 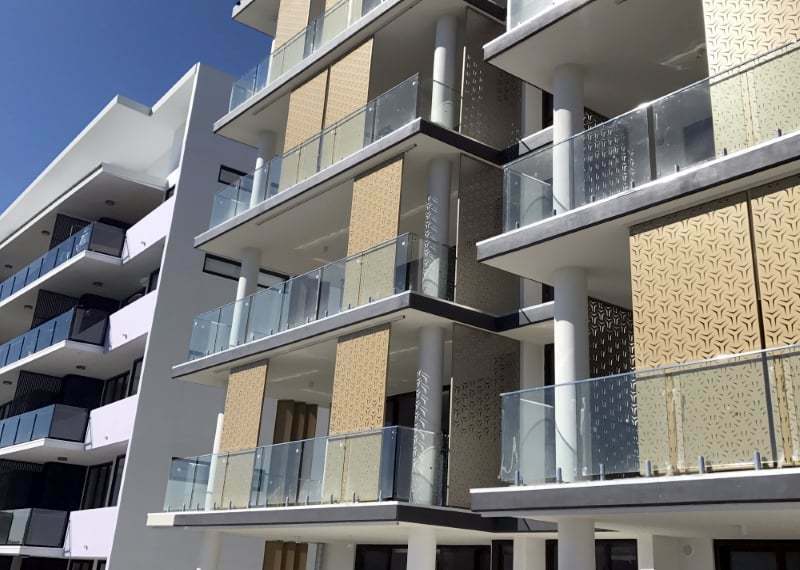 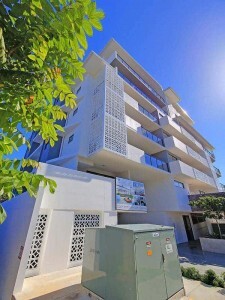 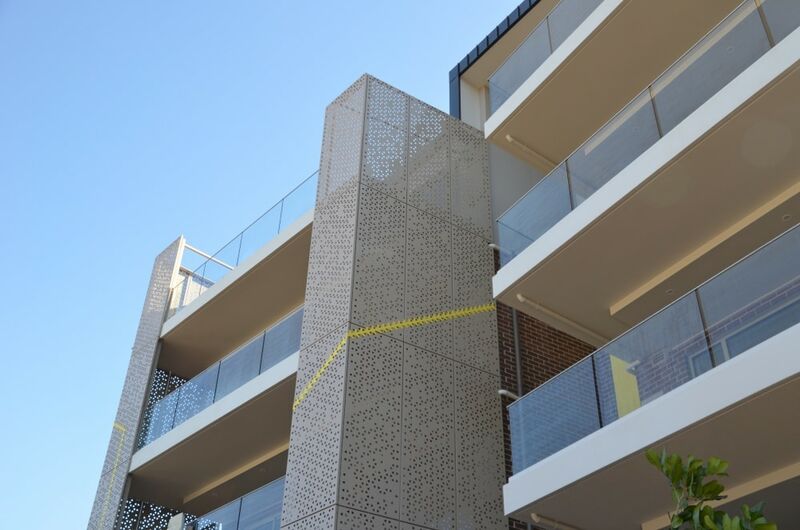 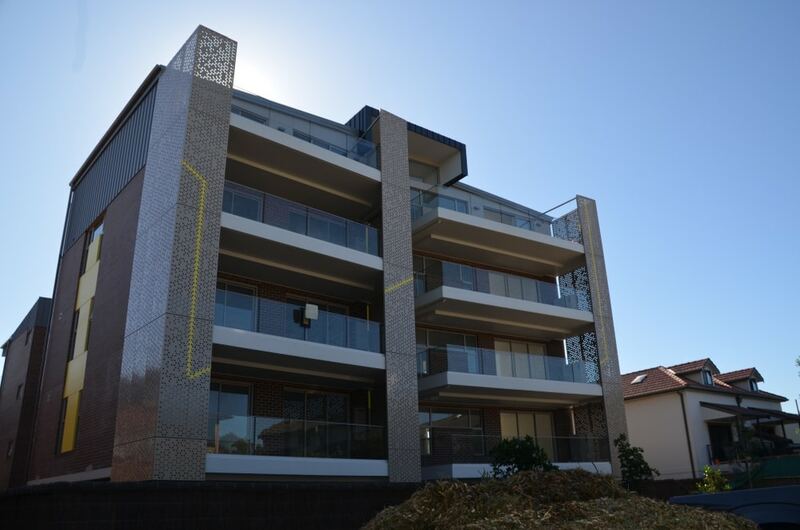 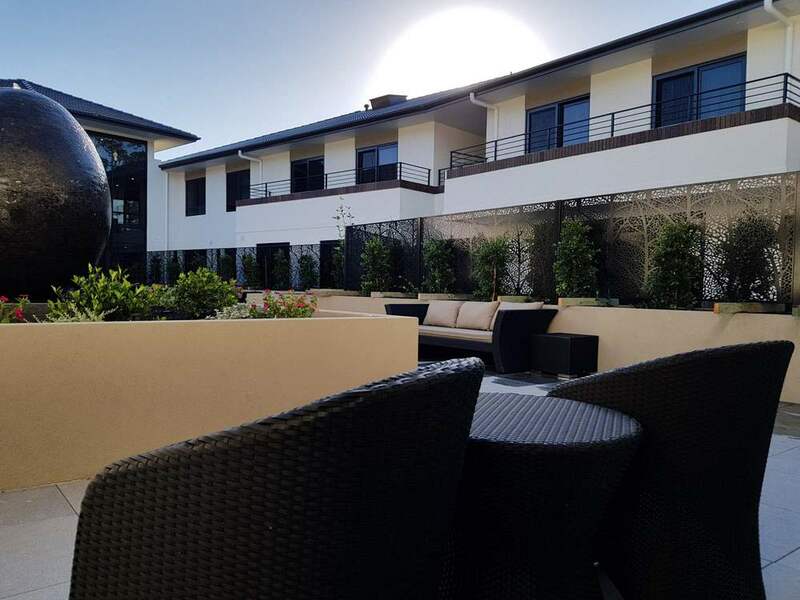 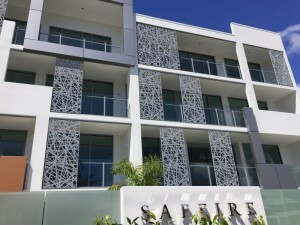 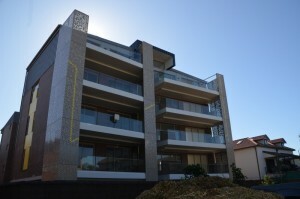 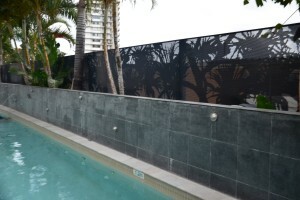 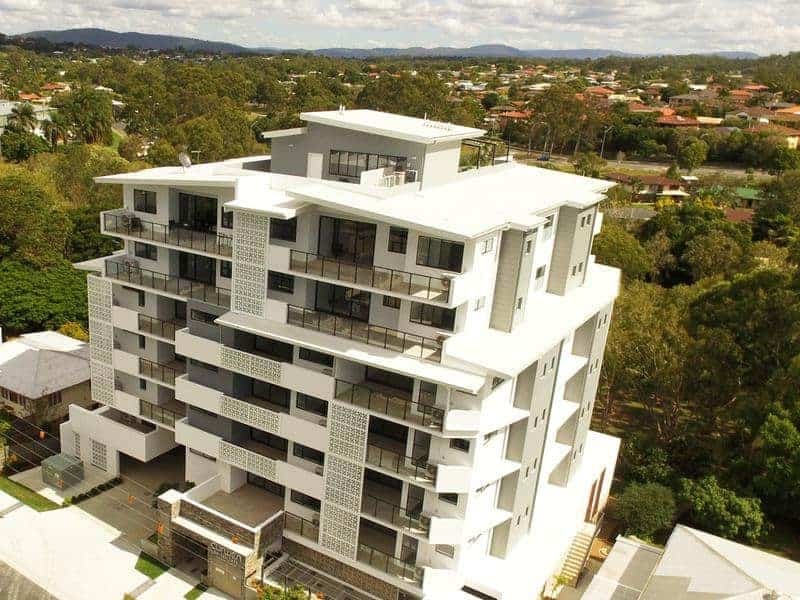 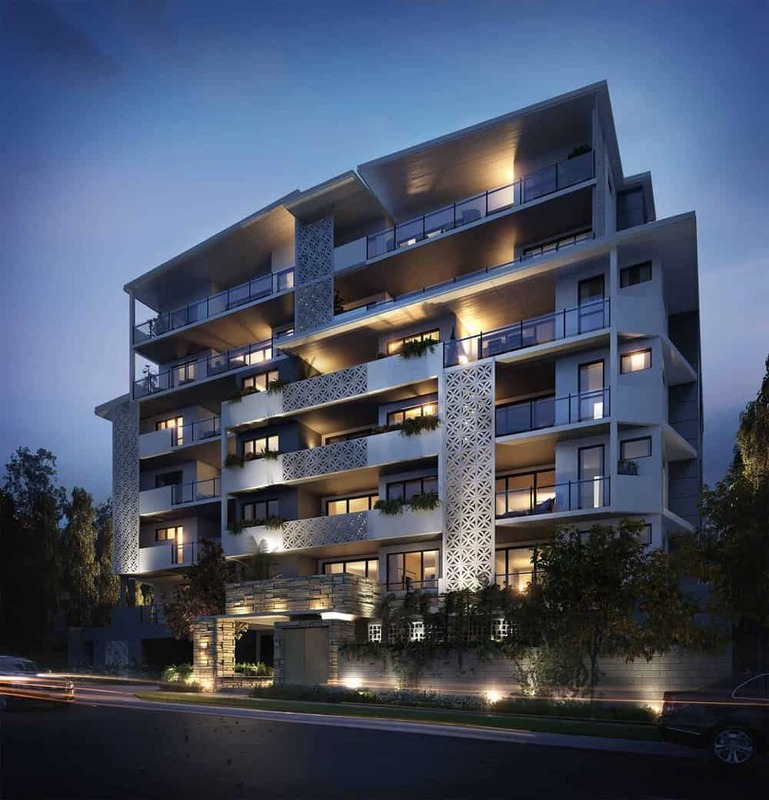 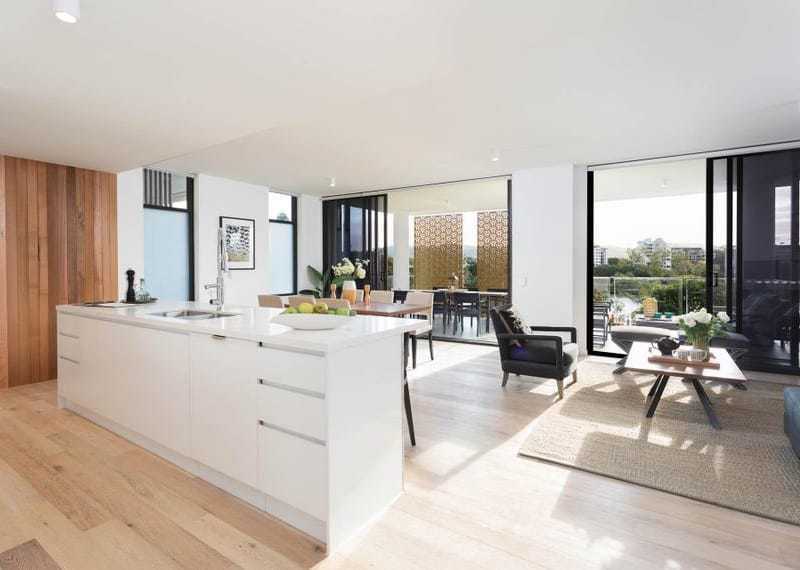 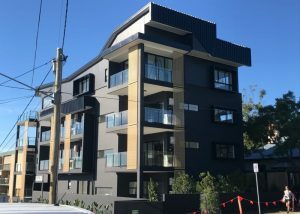 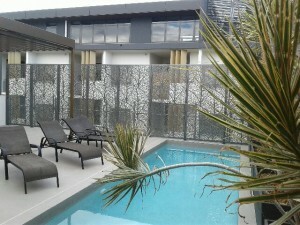 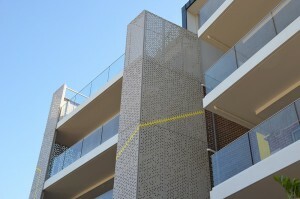 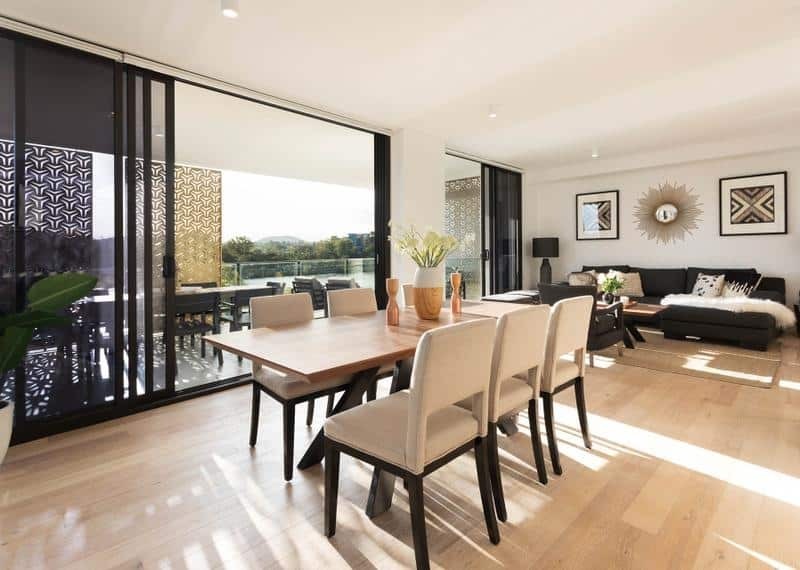 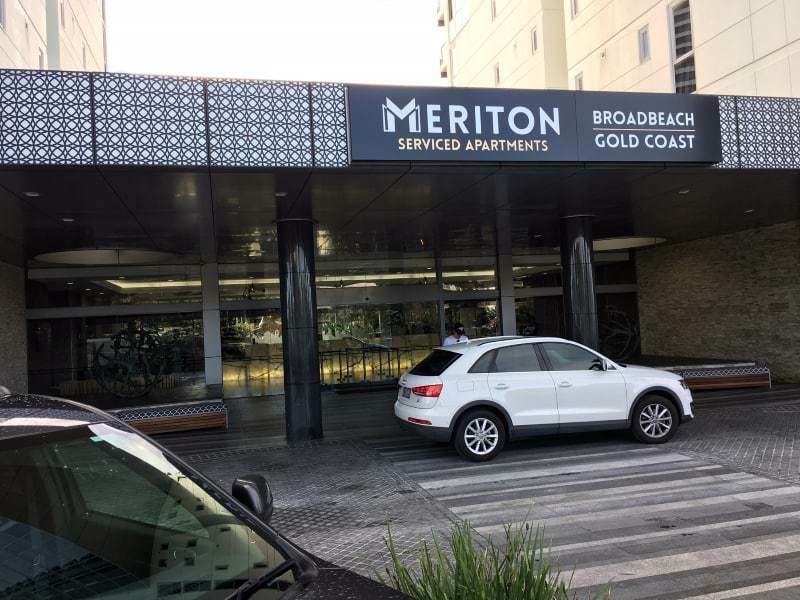 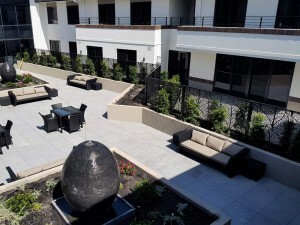 Our retro breeze block designs was used on this beautiful high-end apartment building. 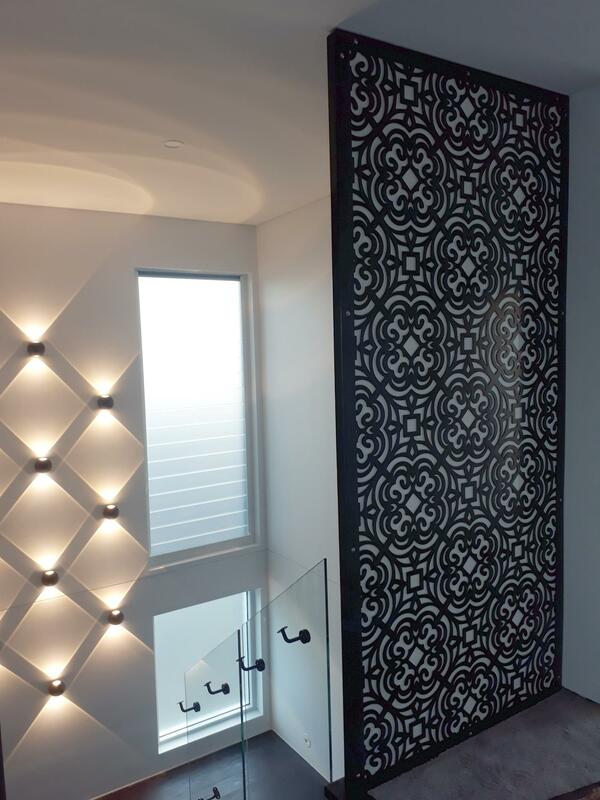 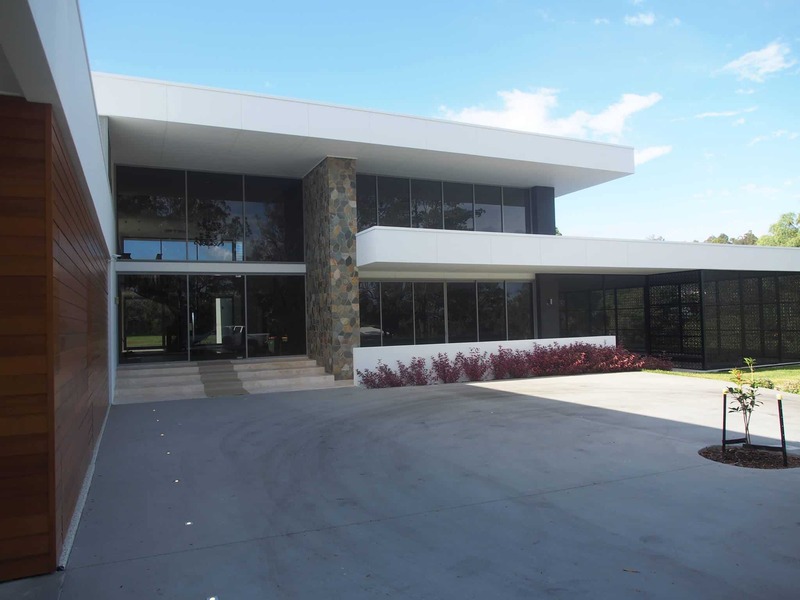 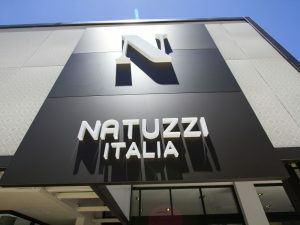 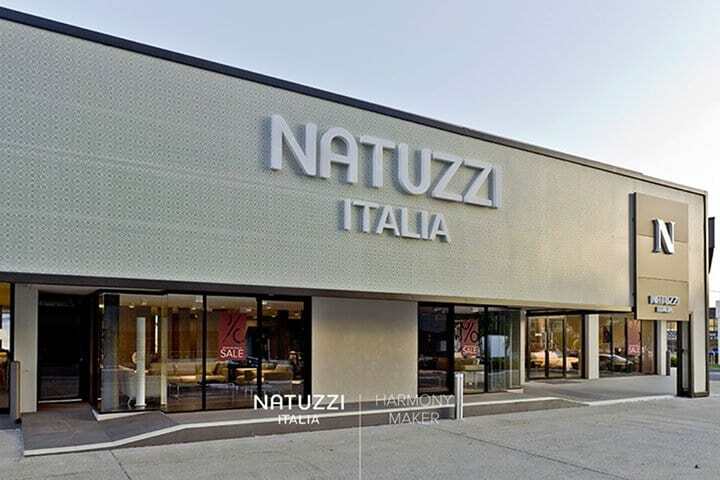 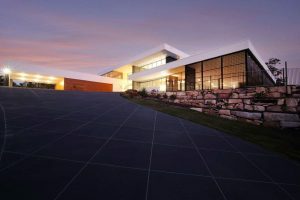 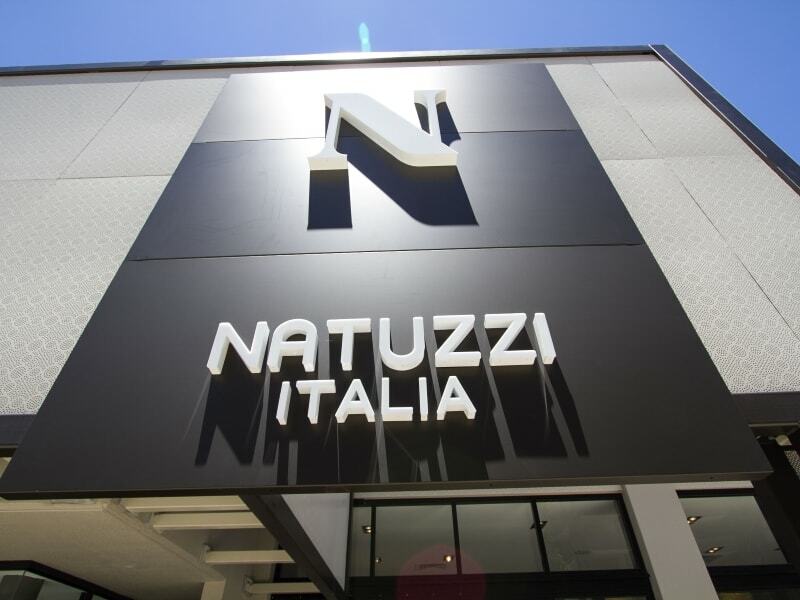 This project required a sleek custom design, styled specifically for this beautiful building. 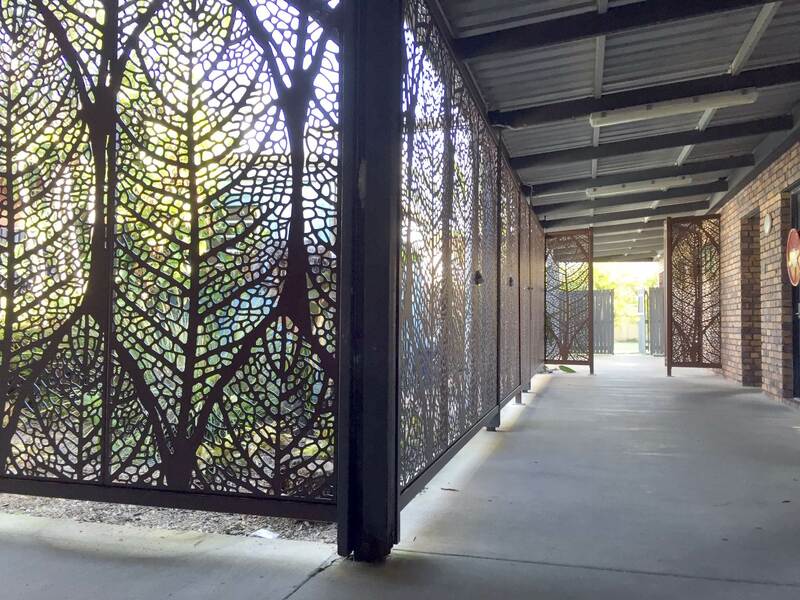 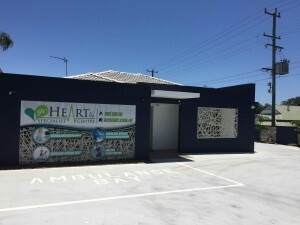 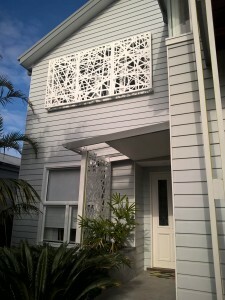 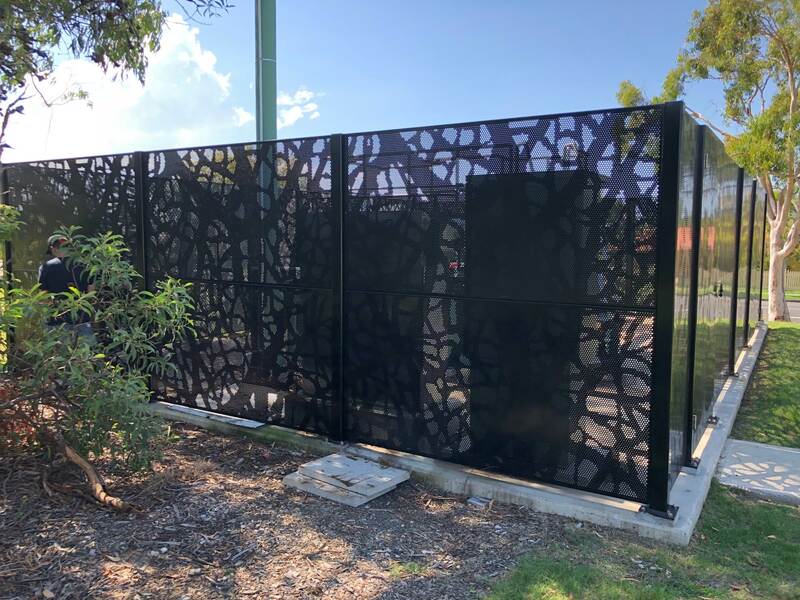 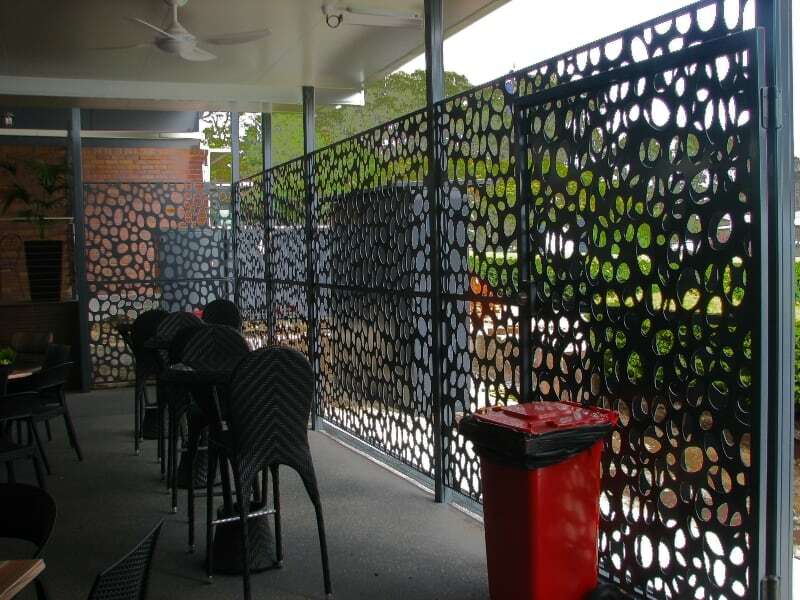 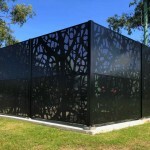 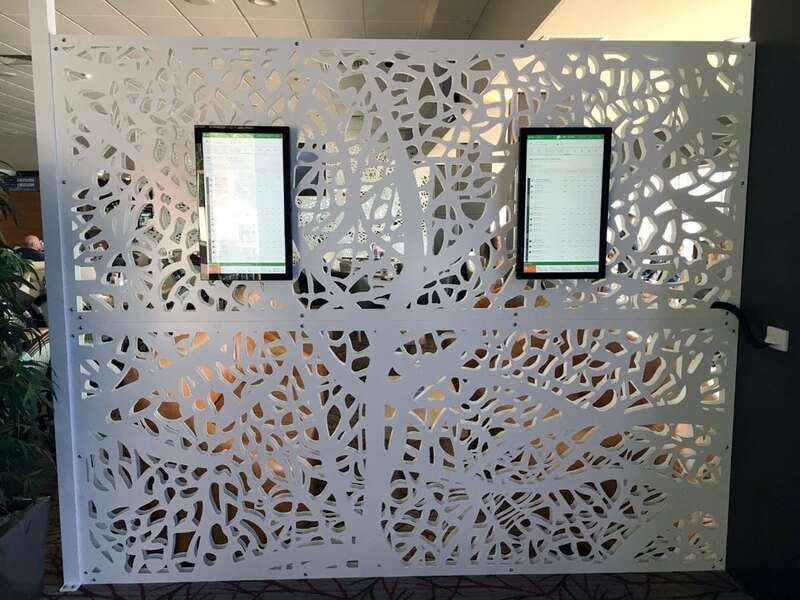 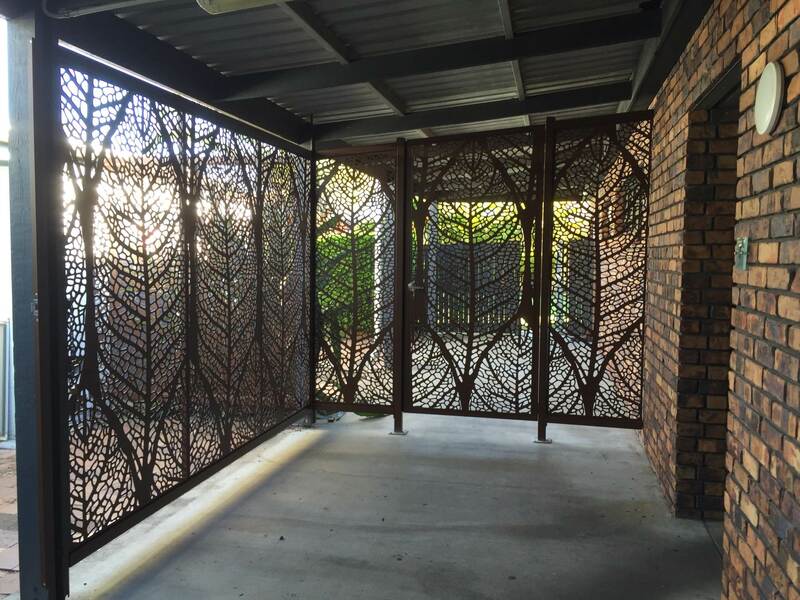 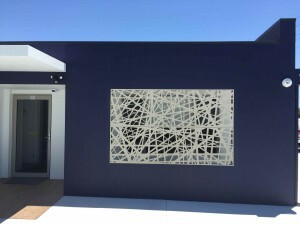 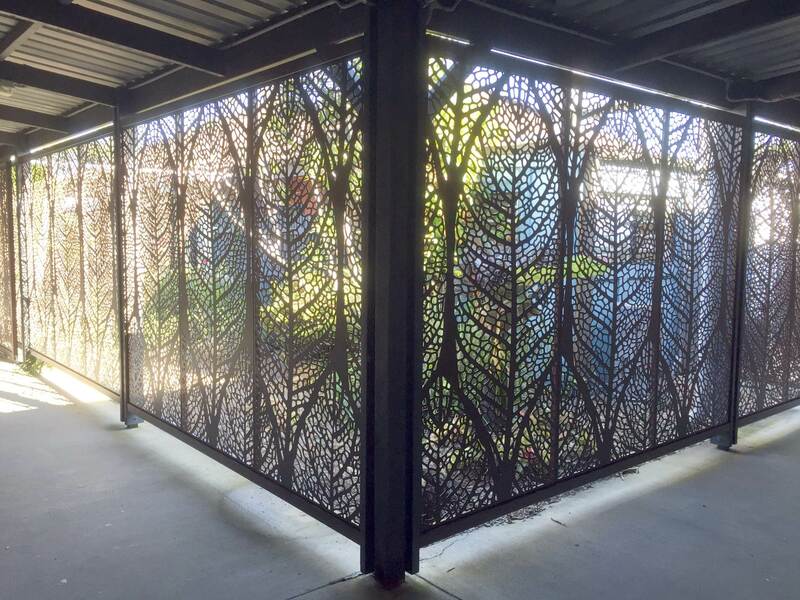 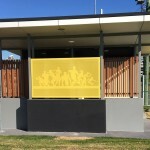 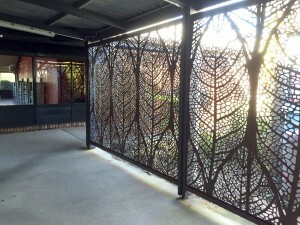 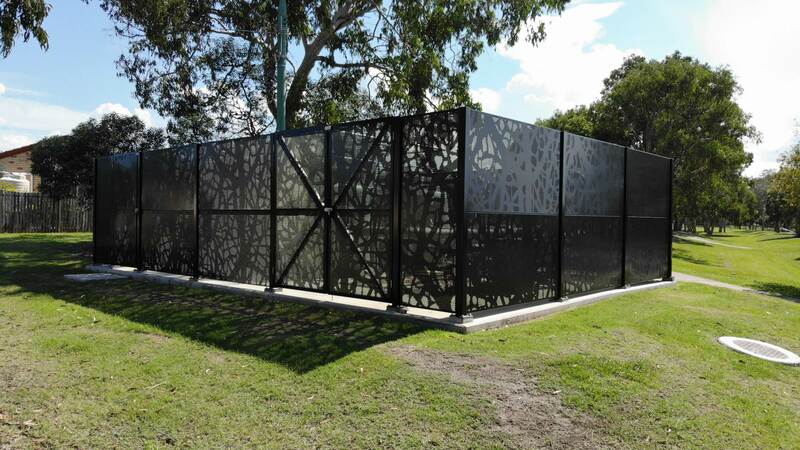 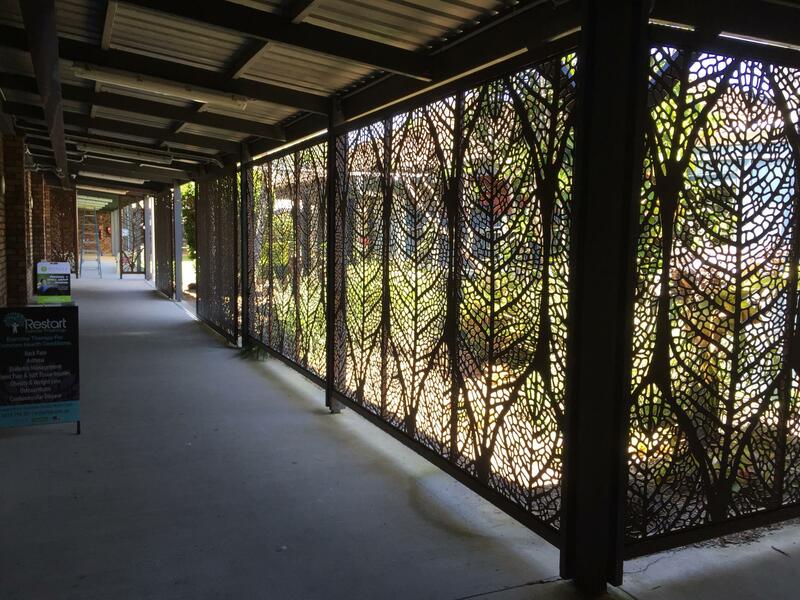 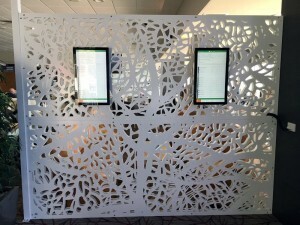 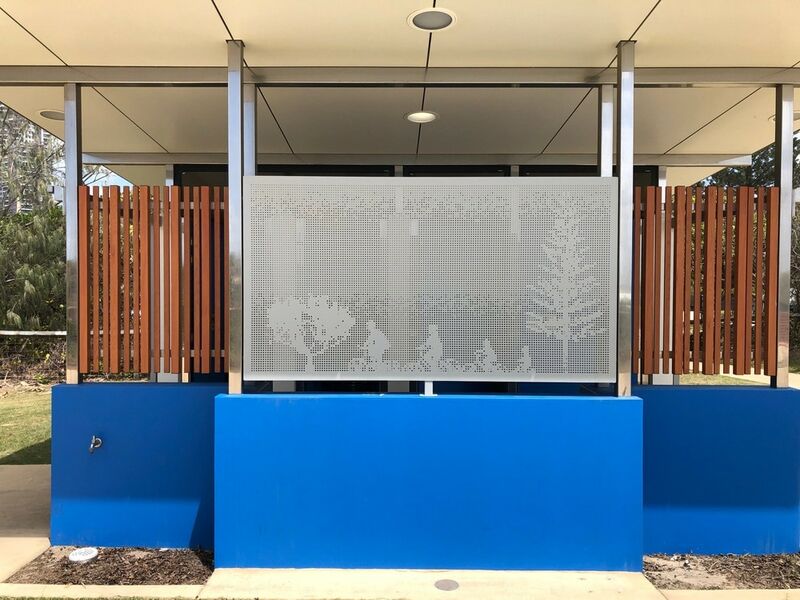 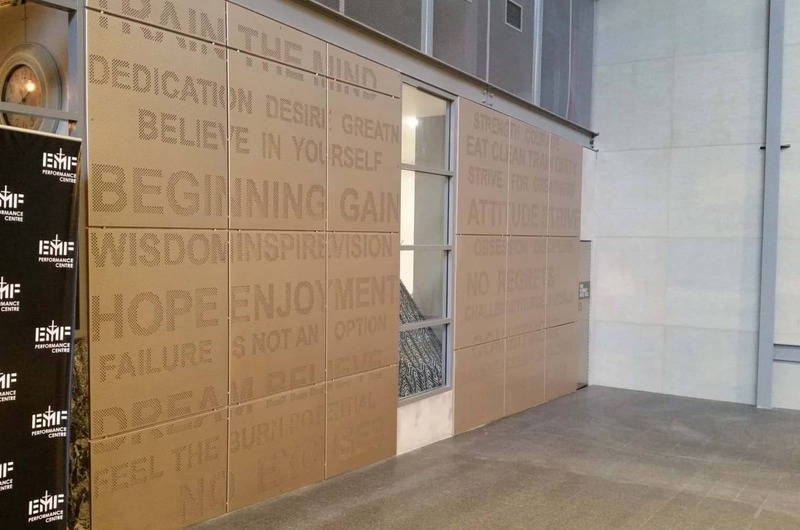 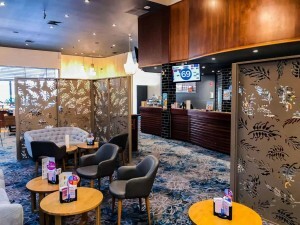 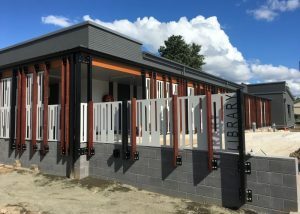 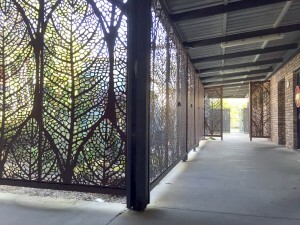 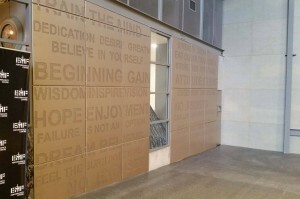 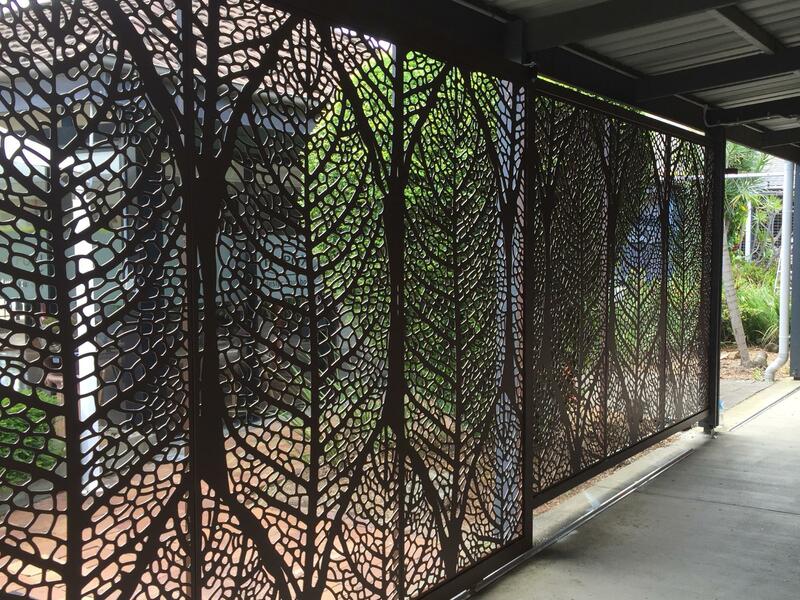 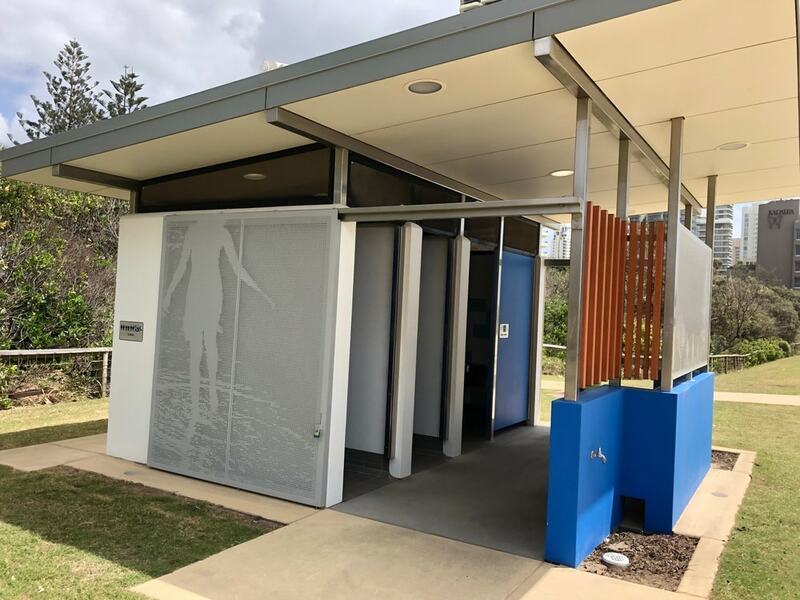 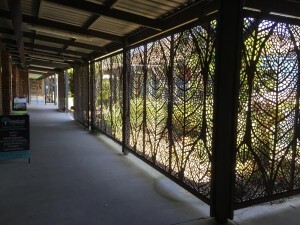 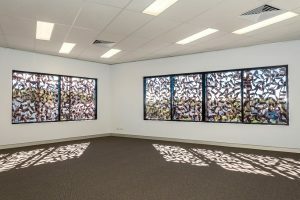 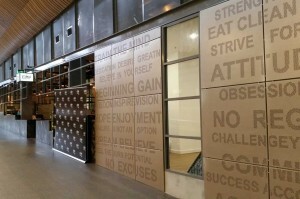 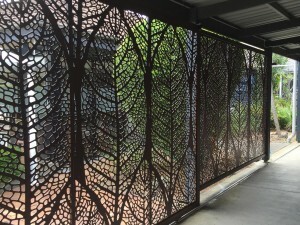 The Laidley Public Library using our Way Out design laser cut screen design to great effect. 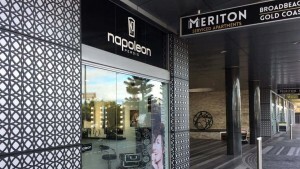 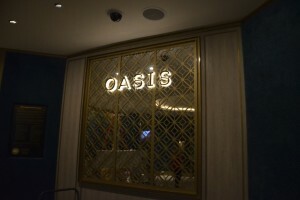 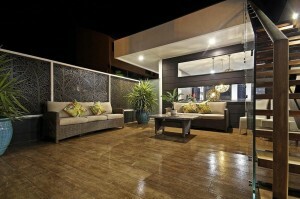 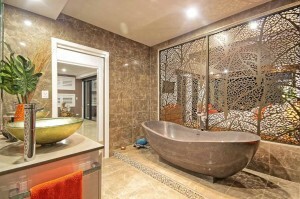 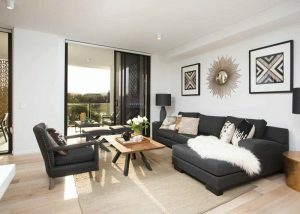 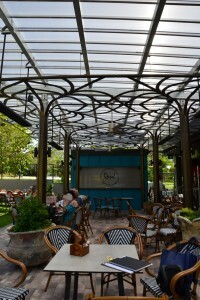 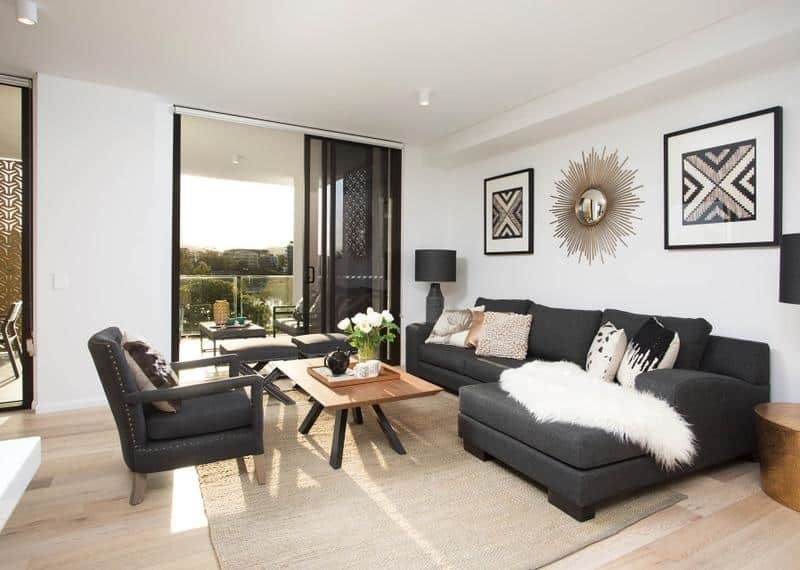 The Vlahos design was used in this project in a black & gold scheme to add style and substance. 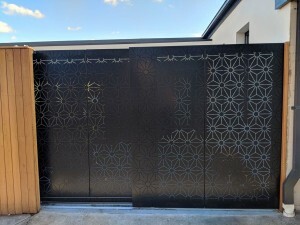 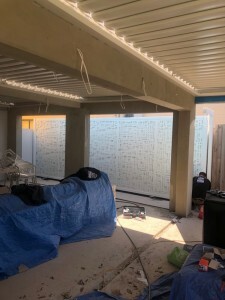 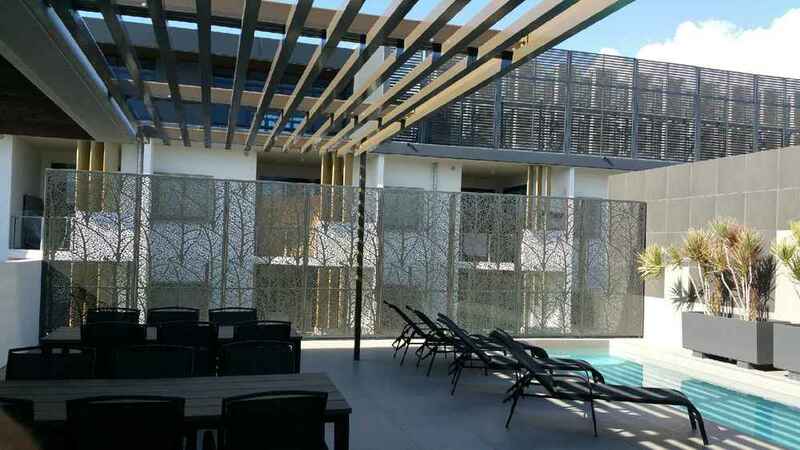 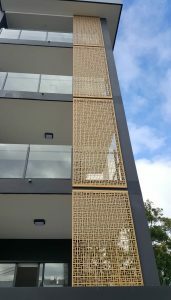 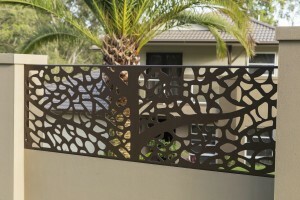 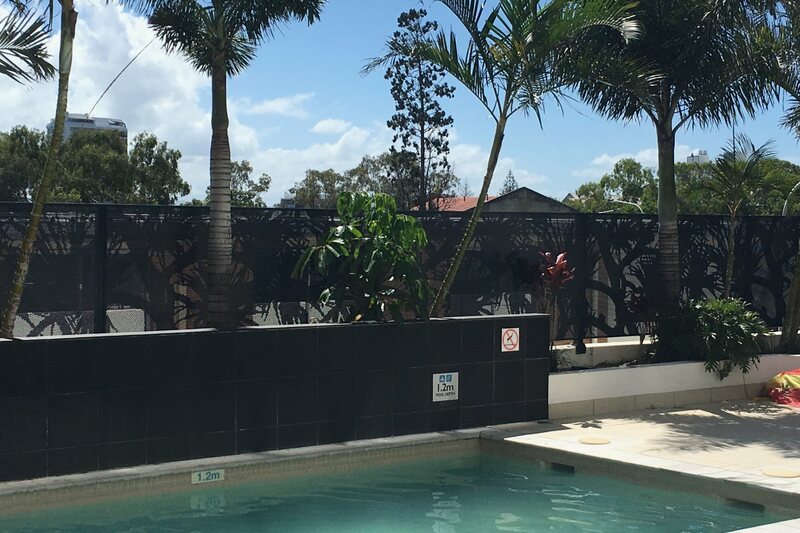 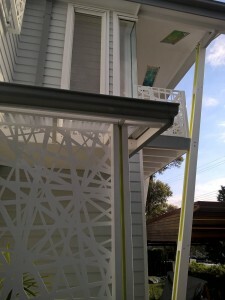 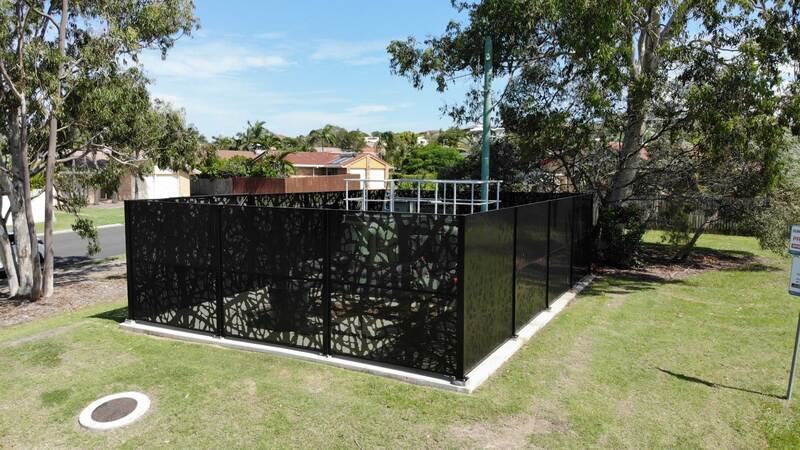 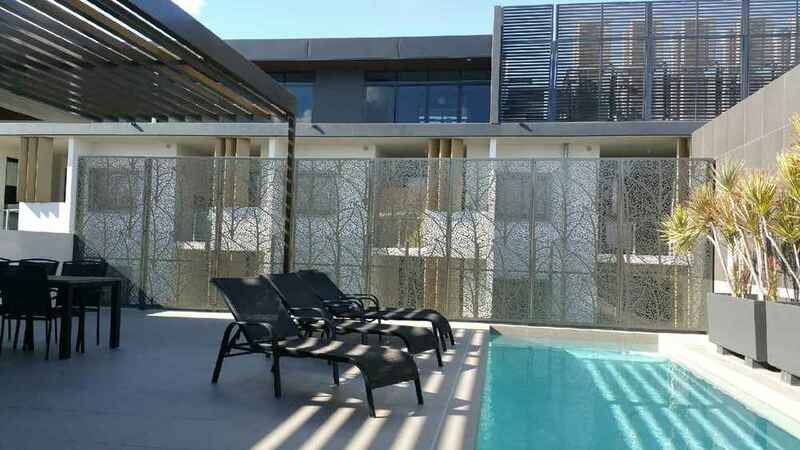 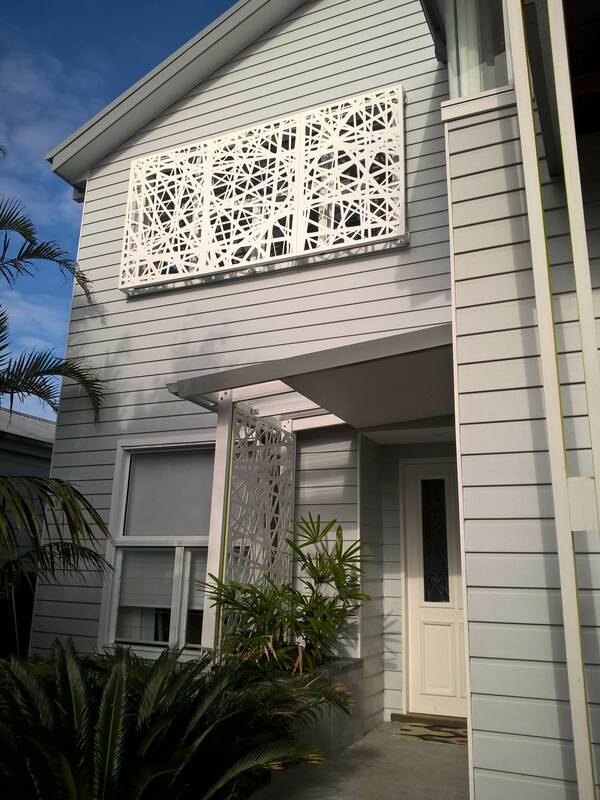 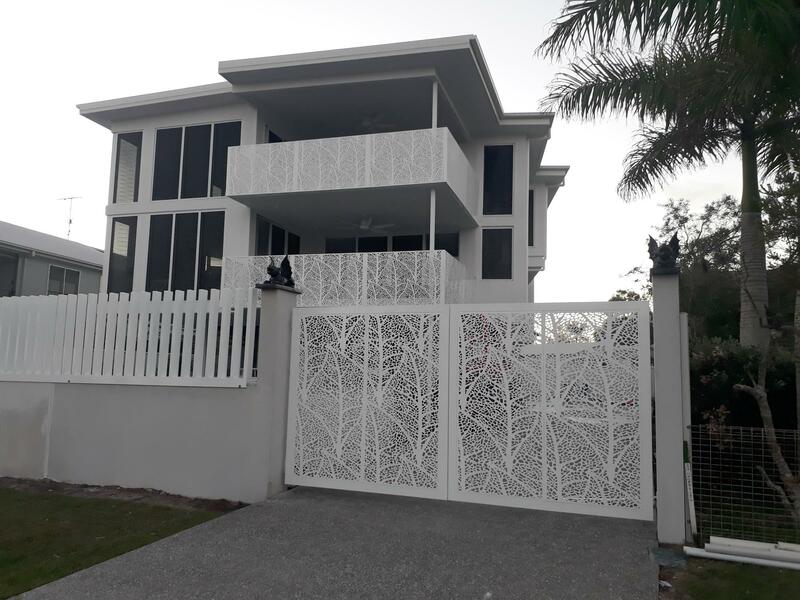 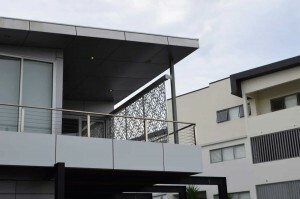 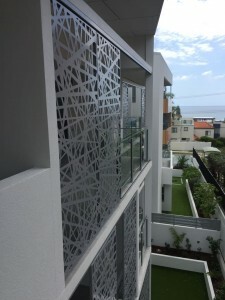 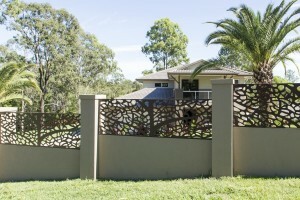 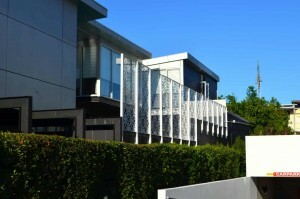 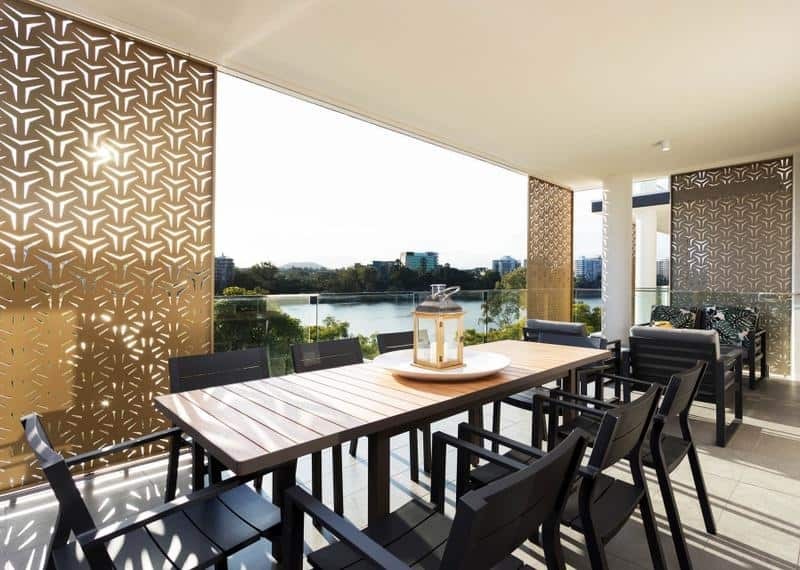 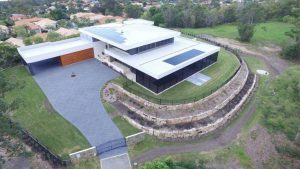 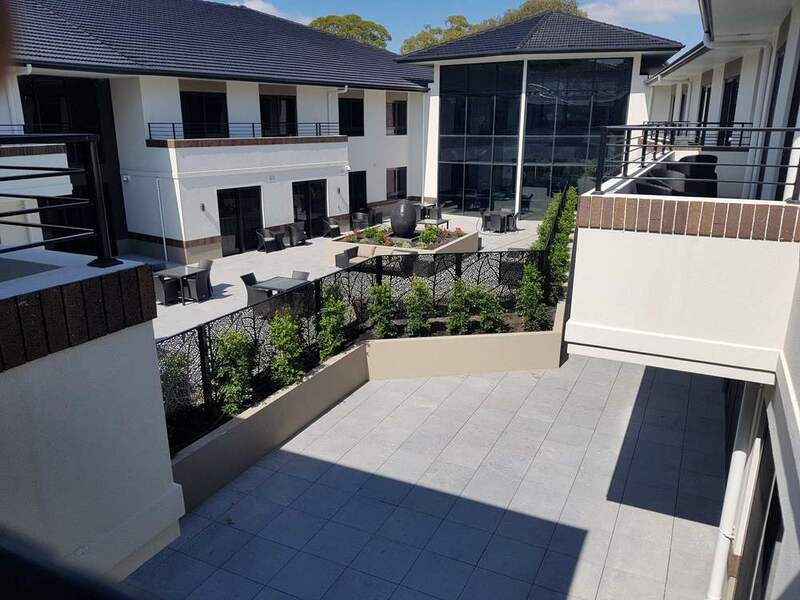 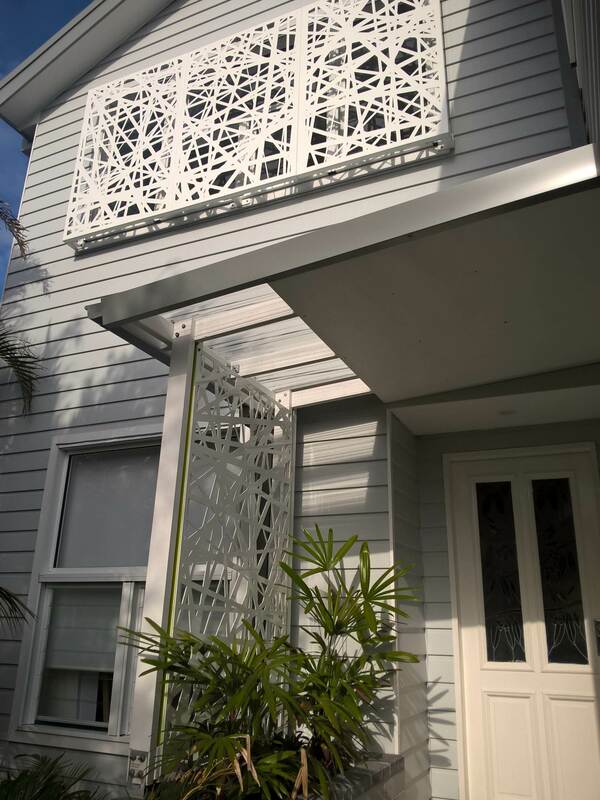 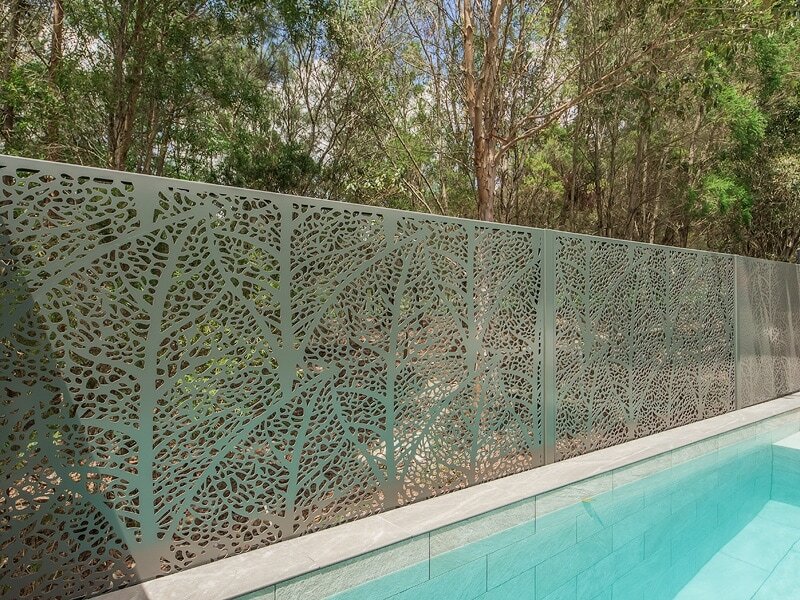 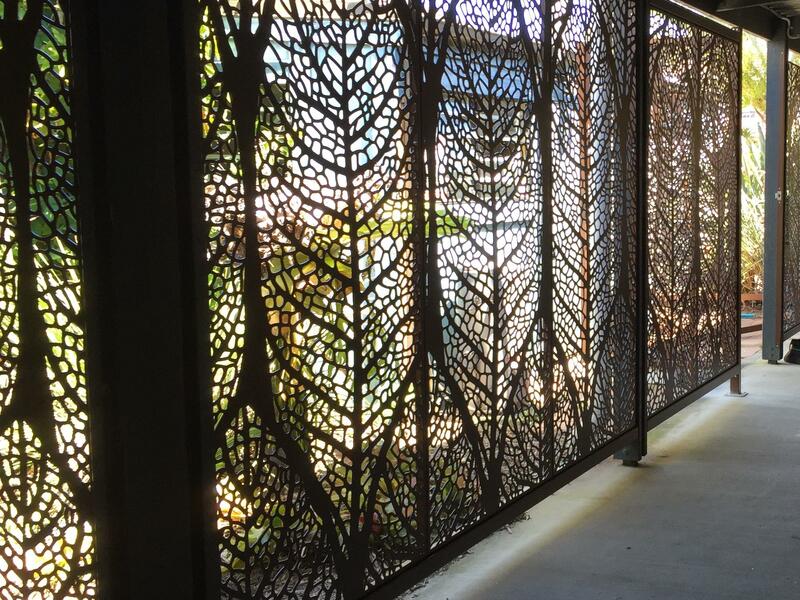 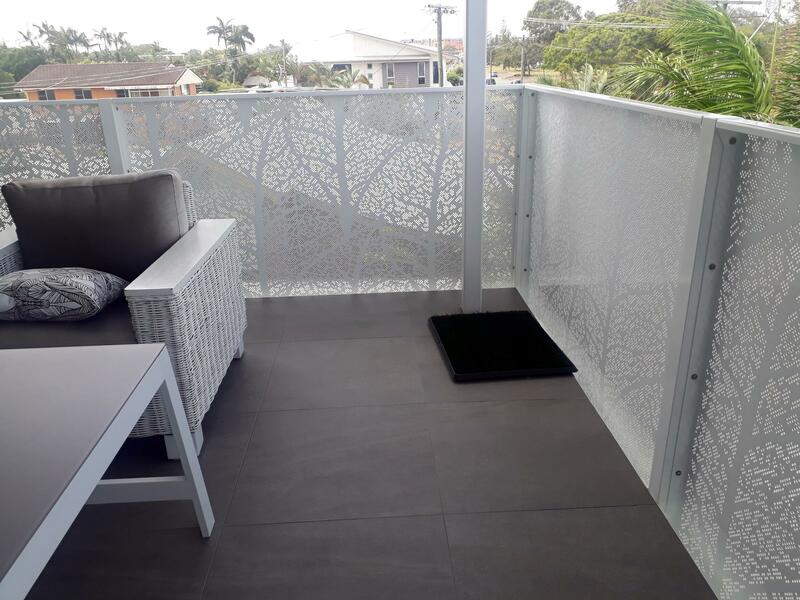 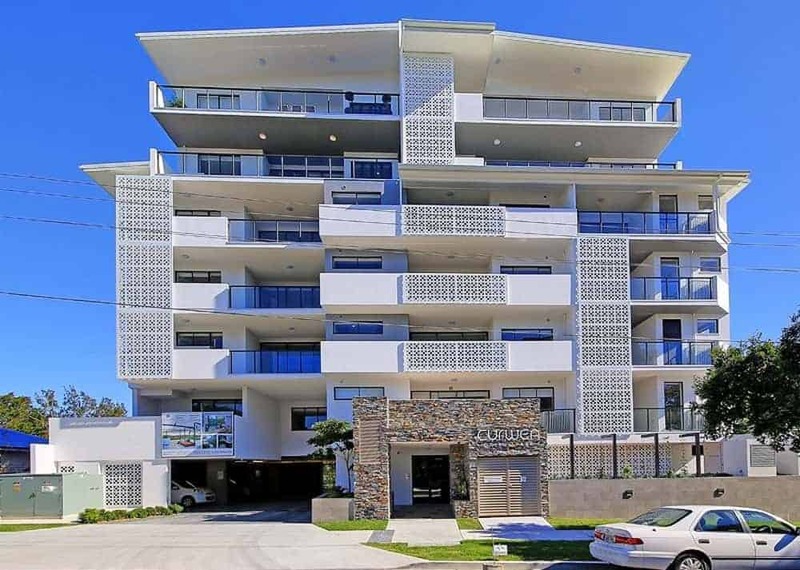 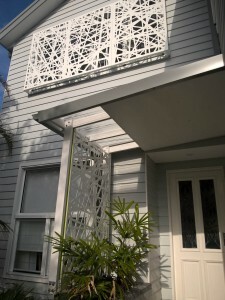 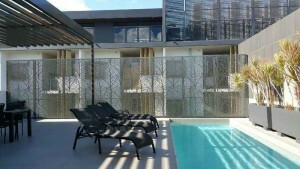 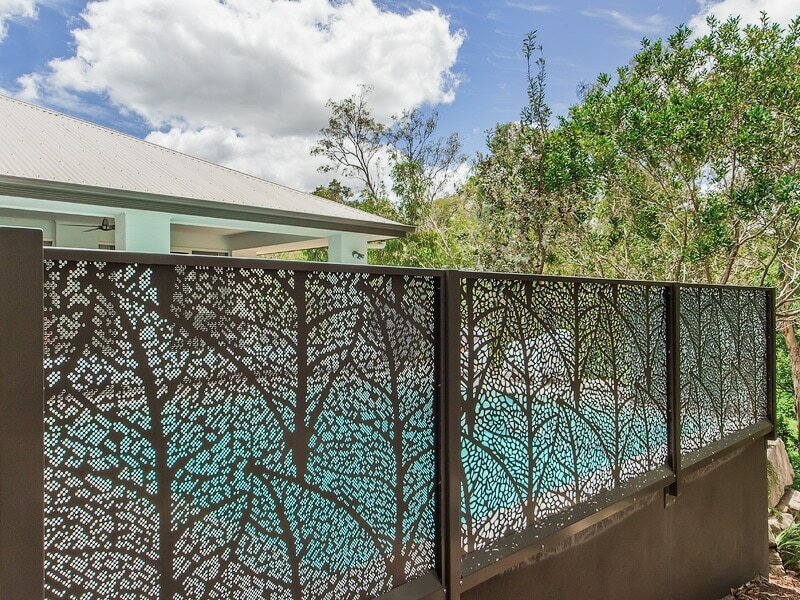 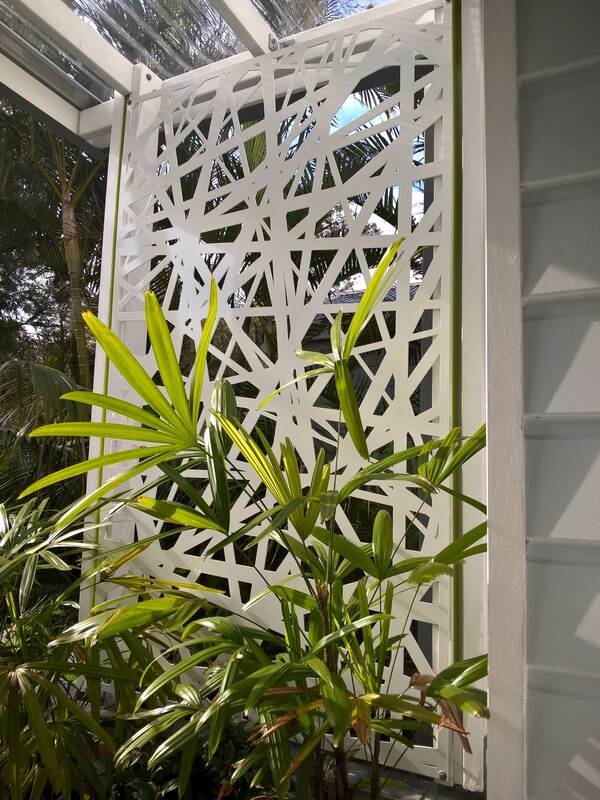 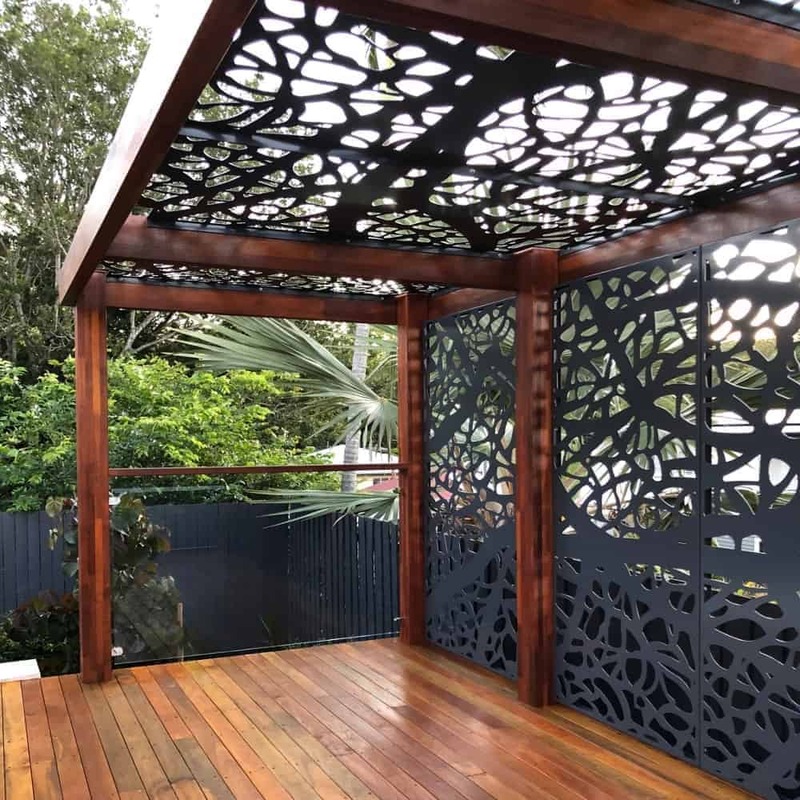 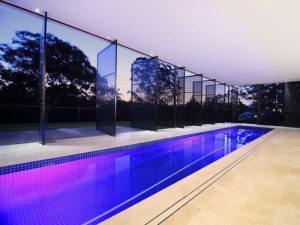 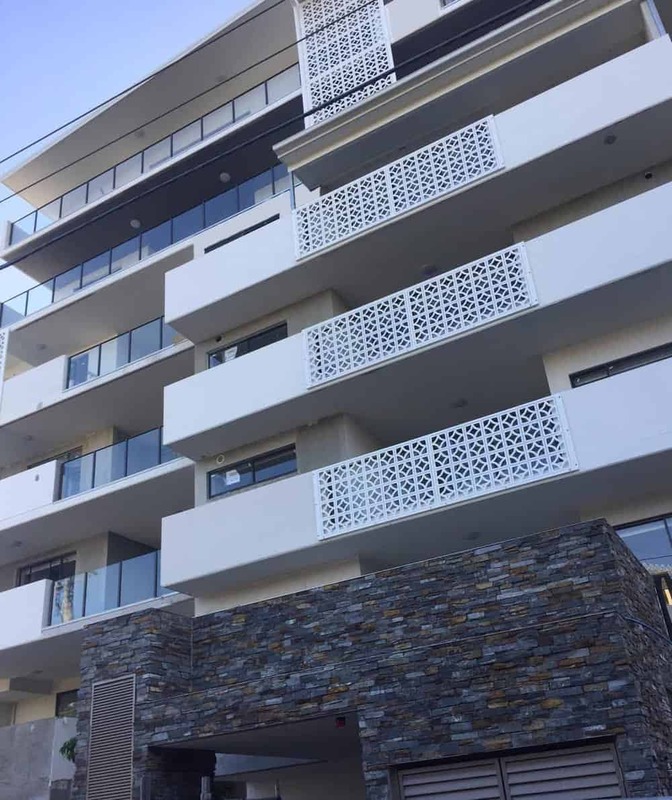 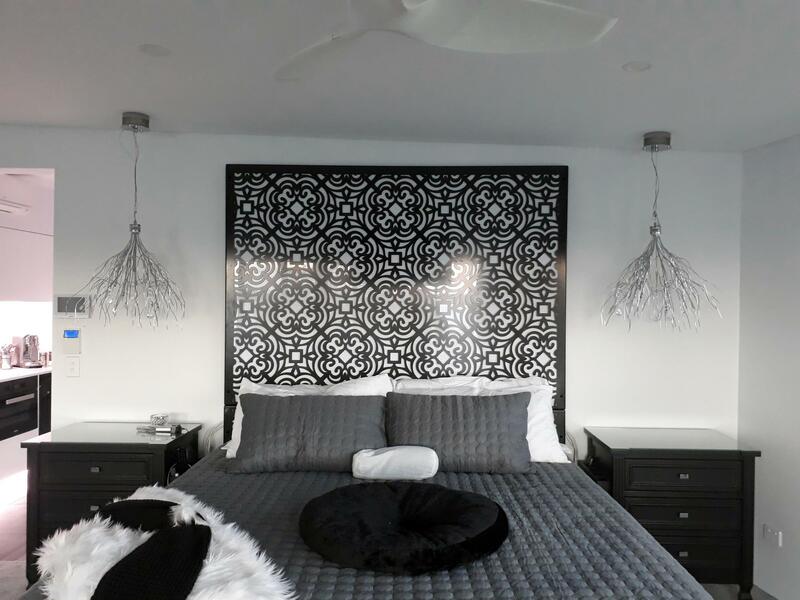 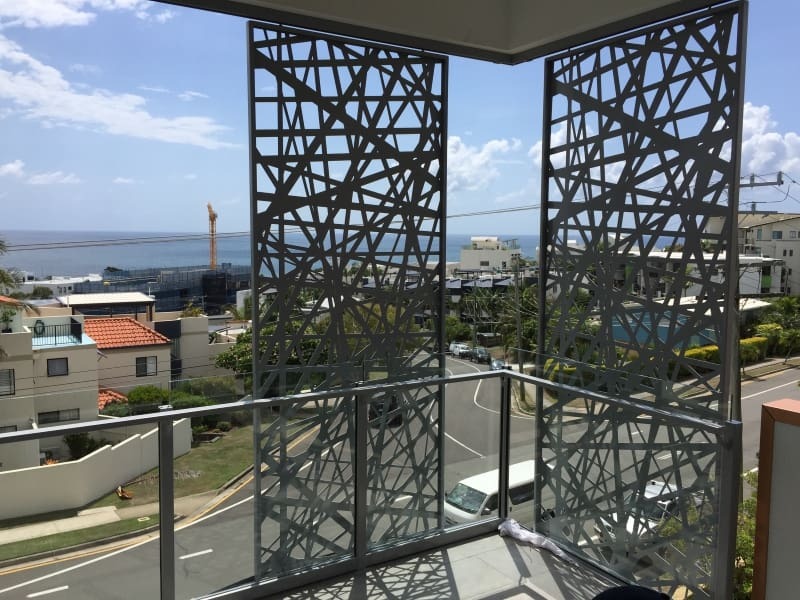 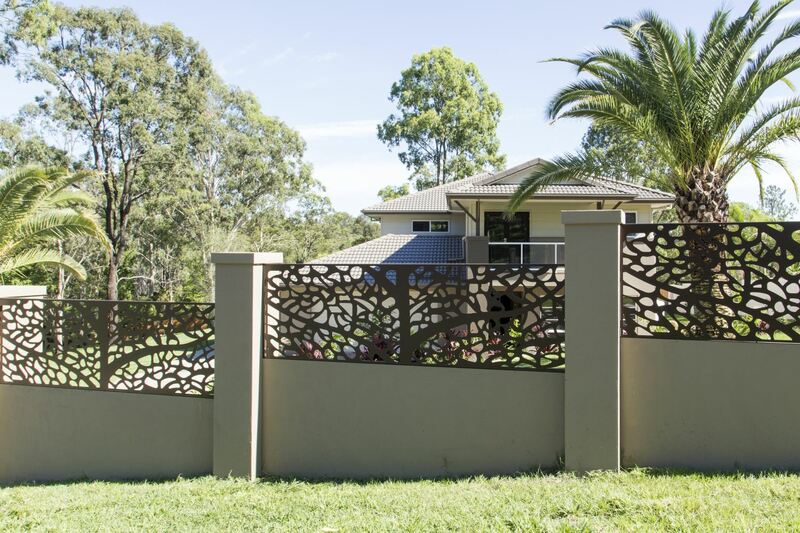 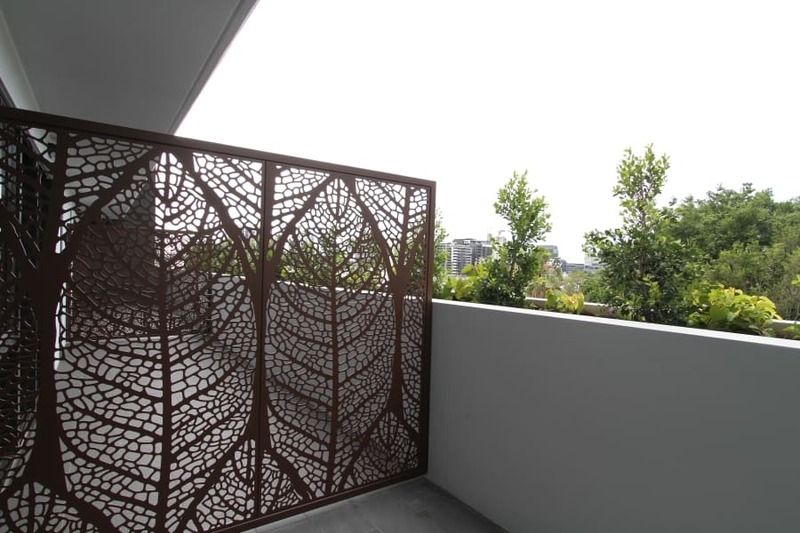 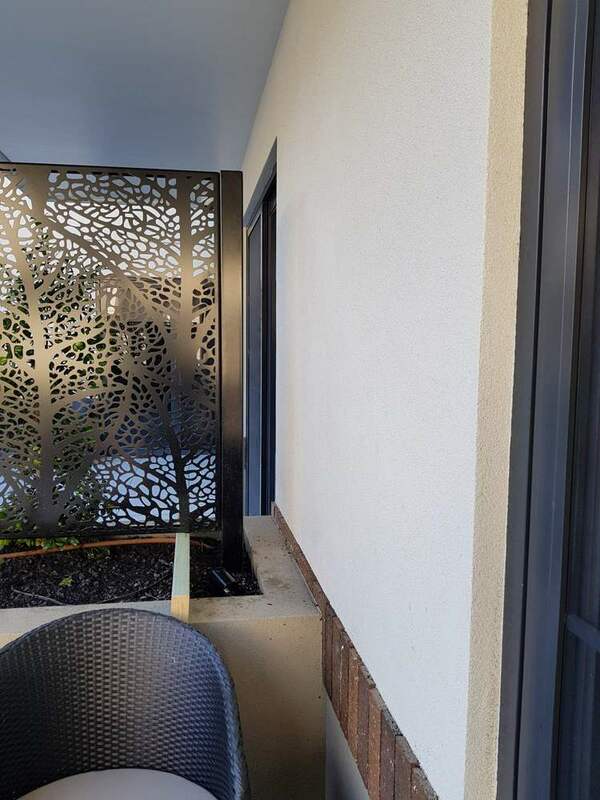 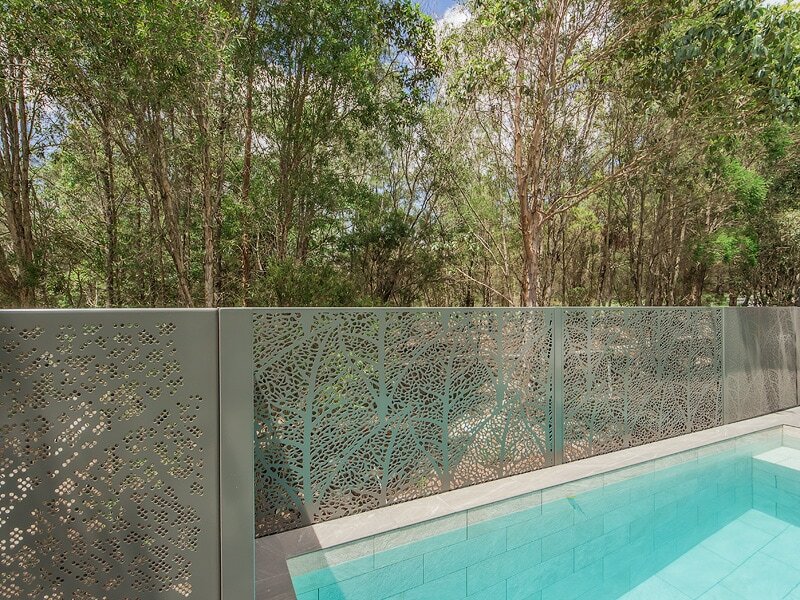 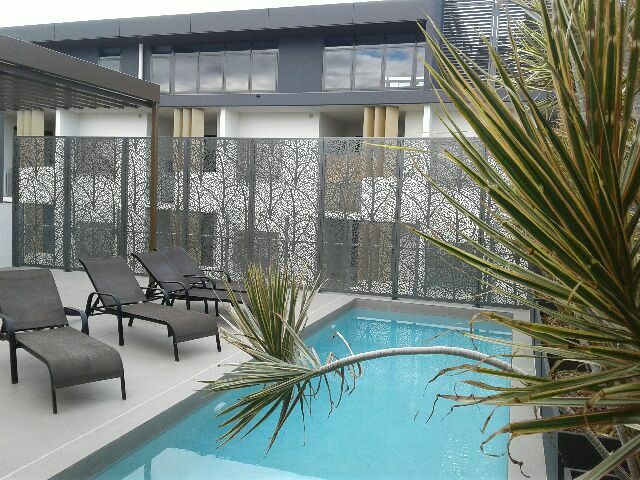 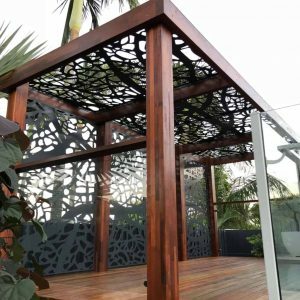 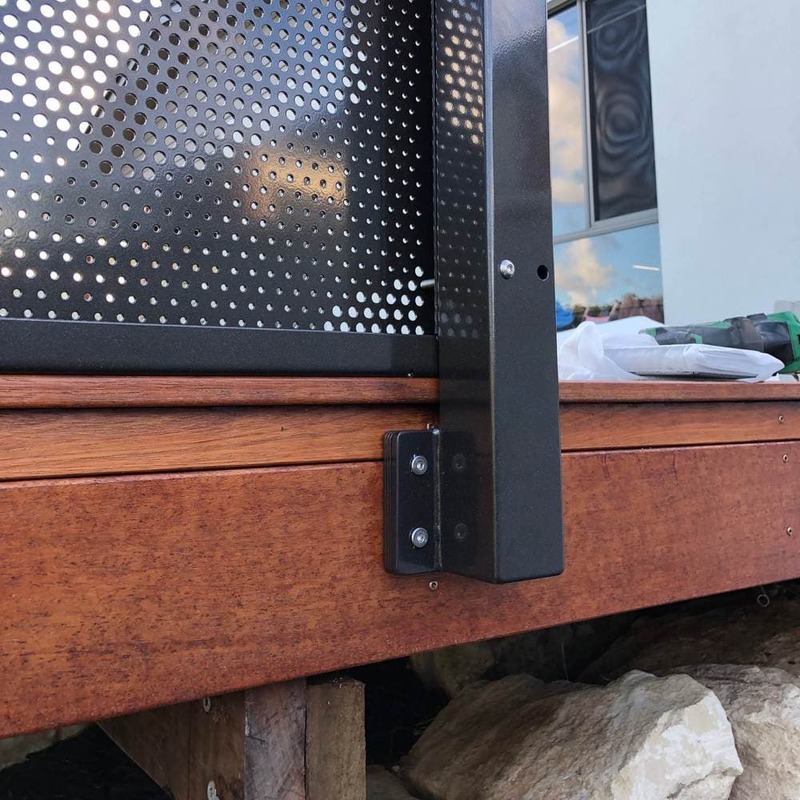 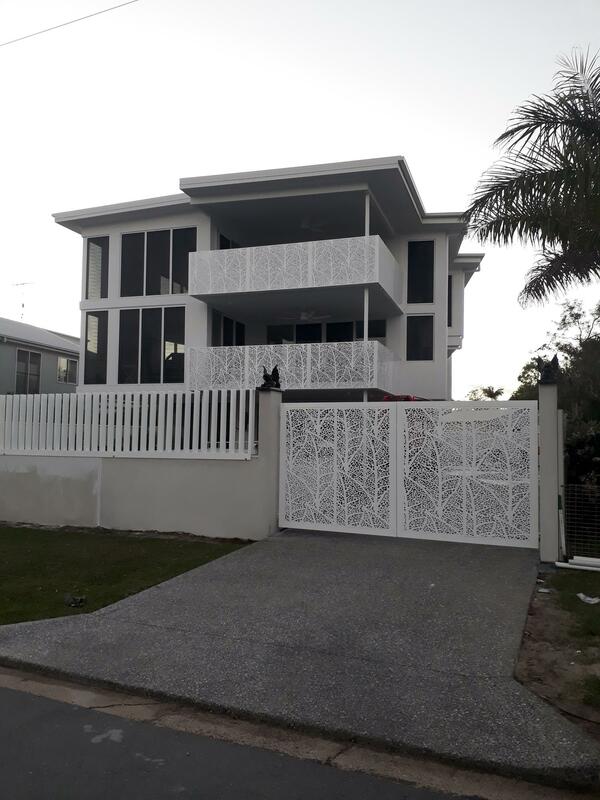 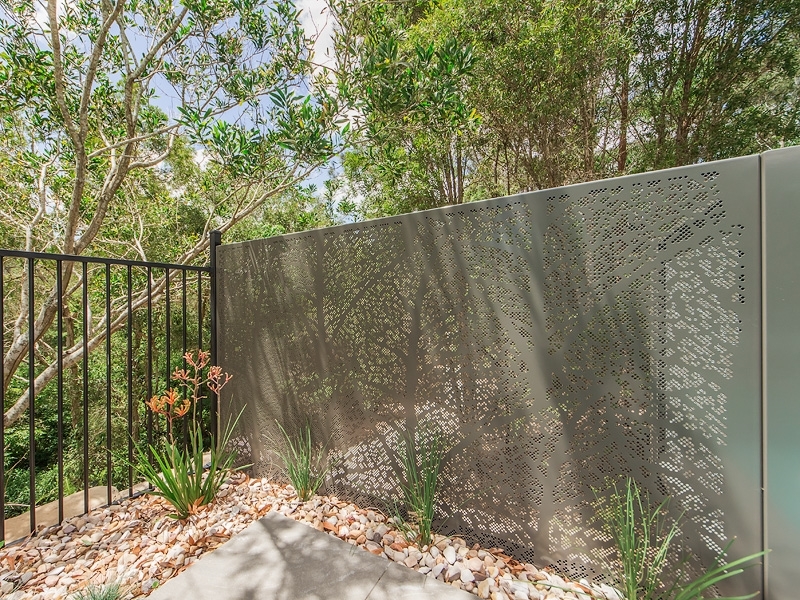 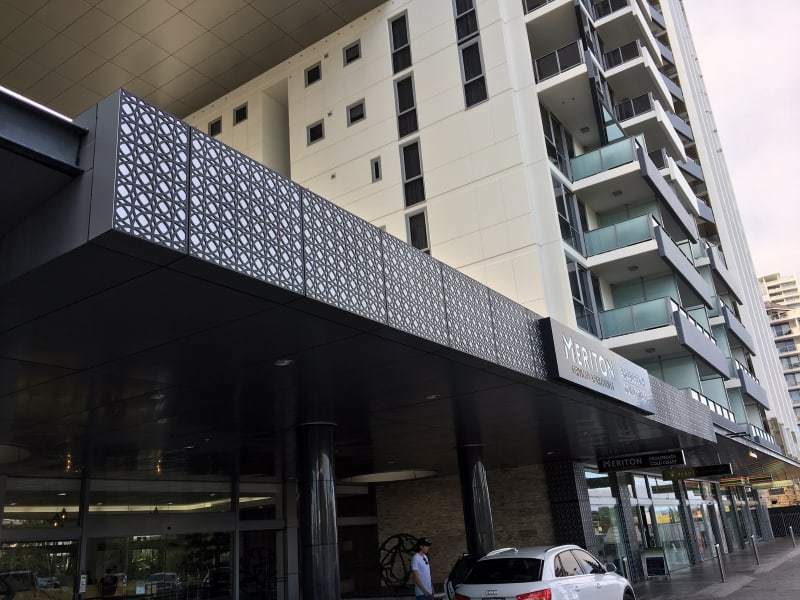 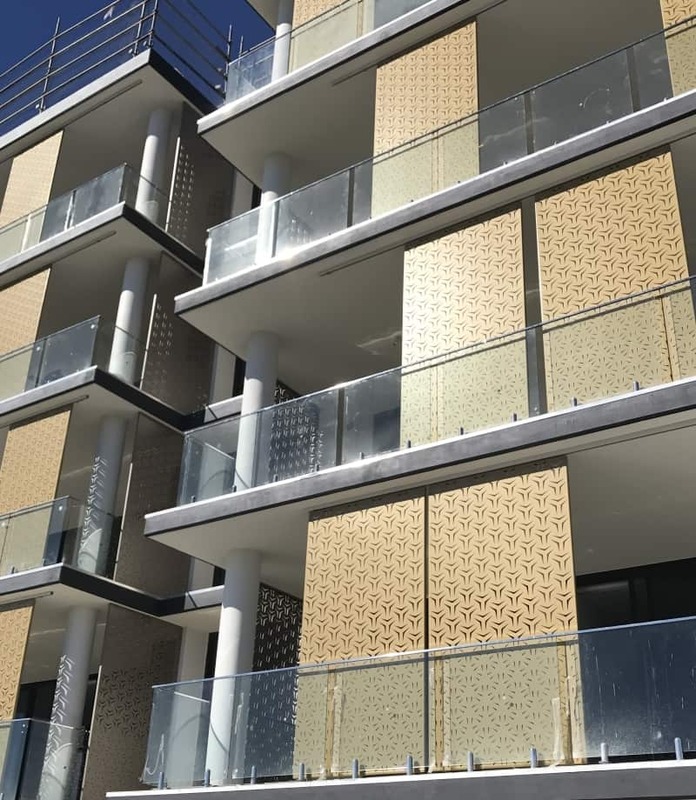 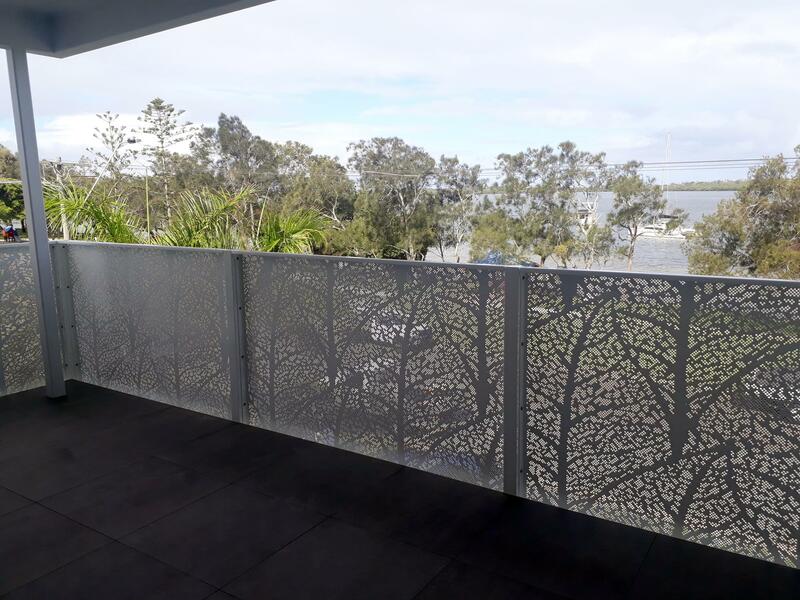 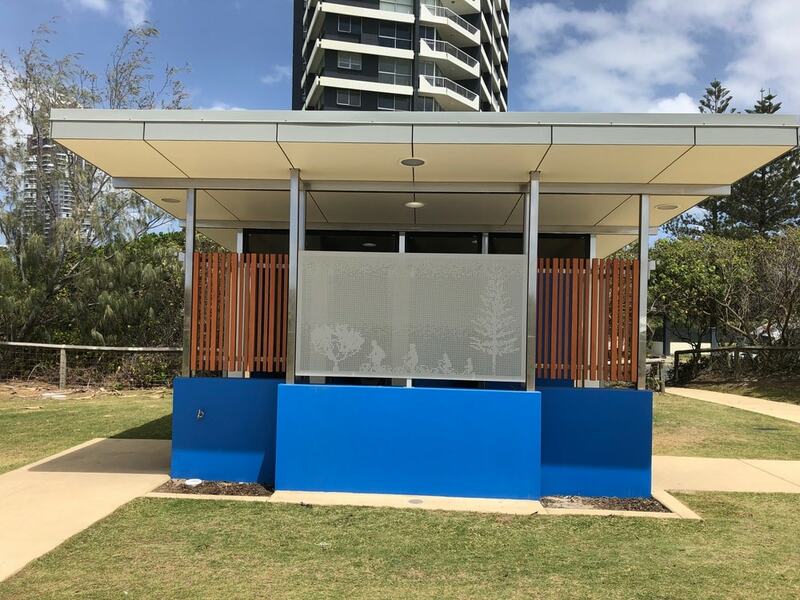 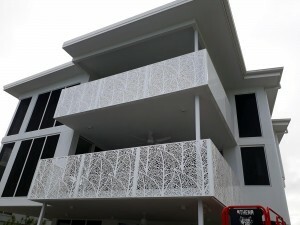 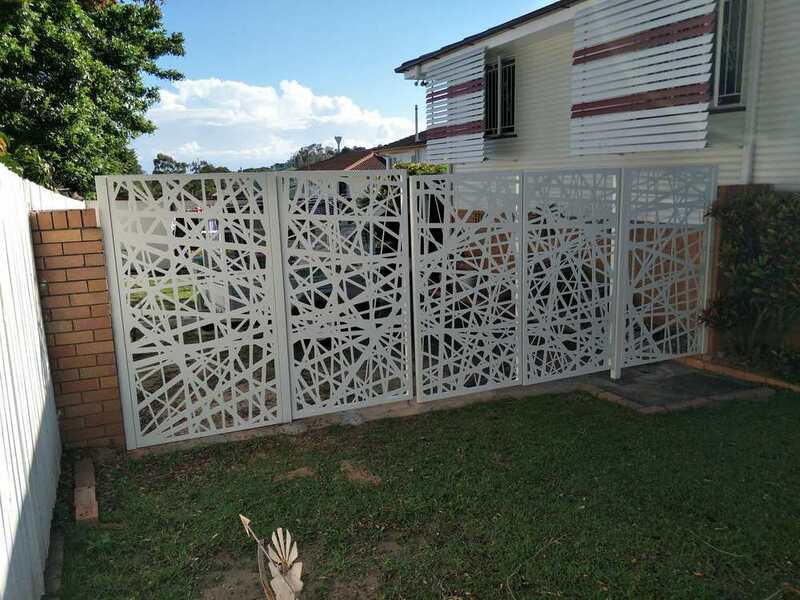 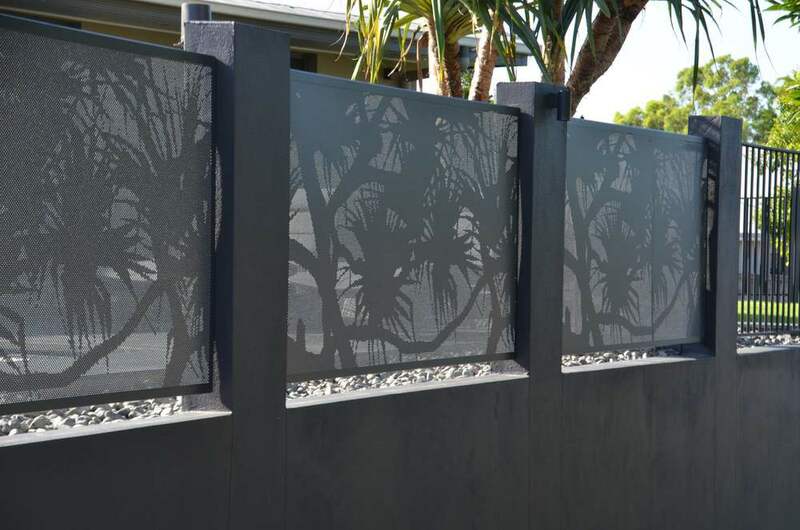 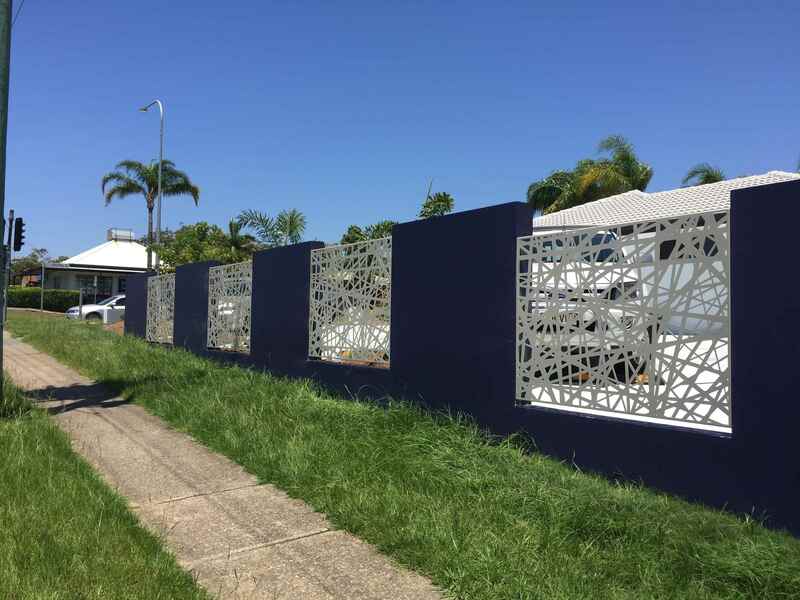 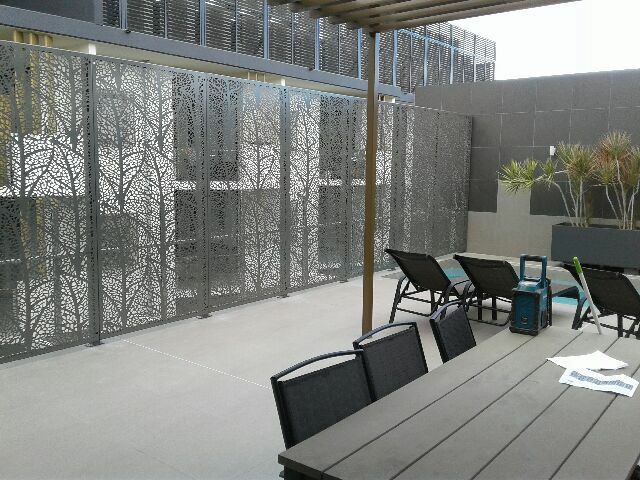 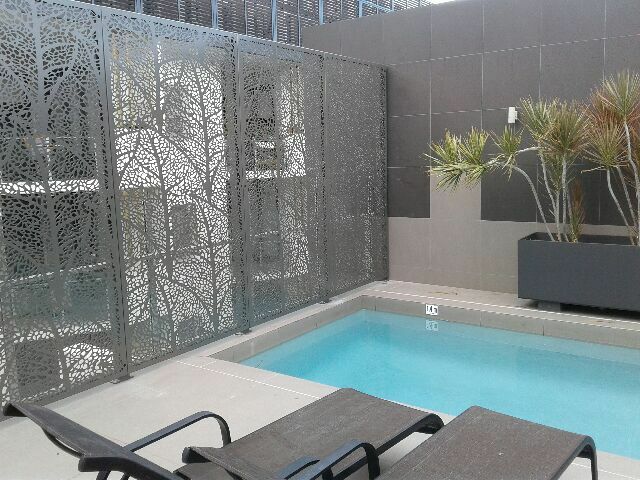 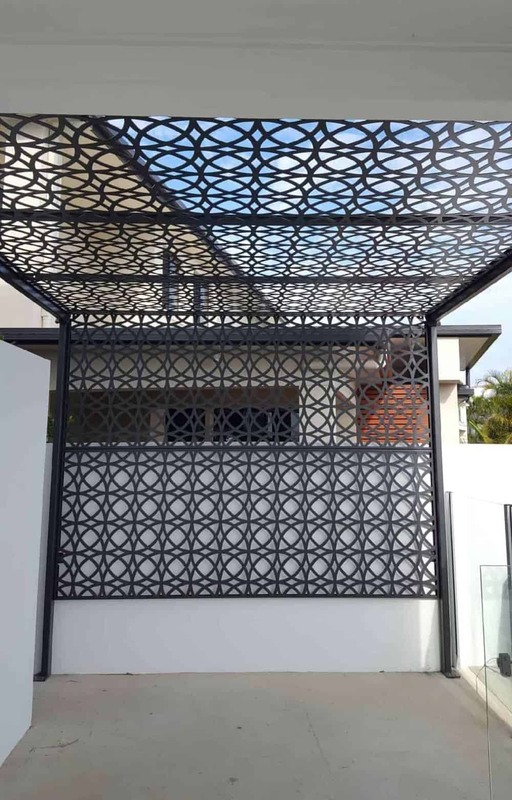 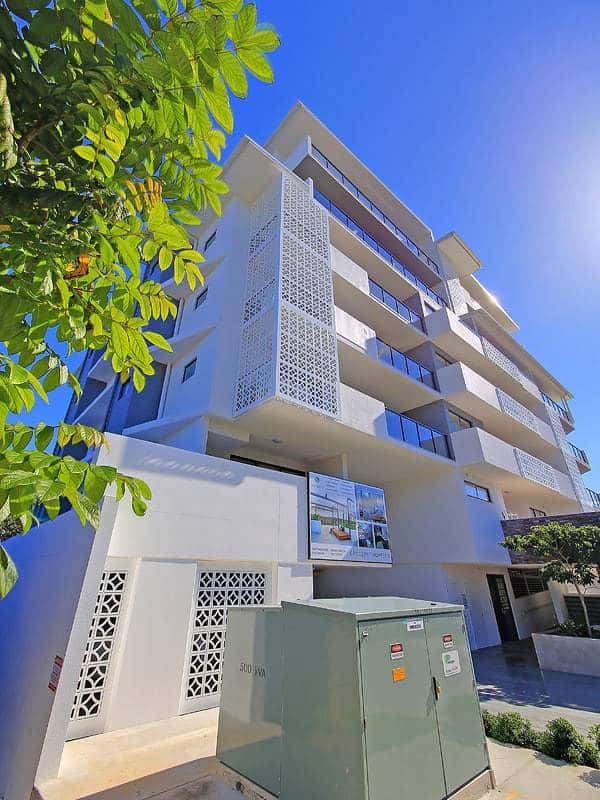 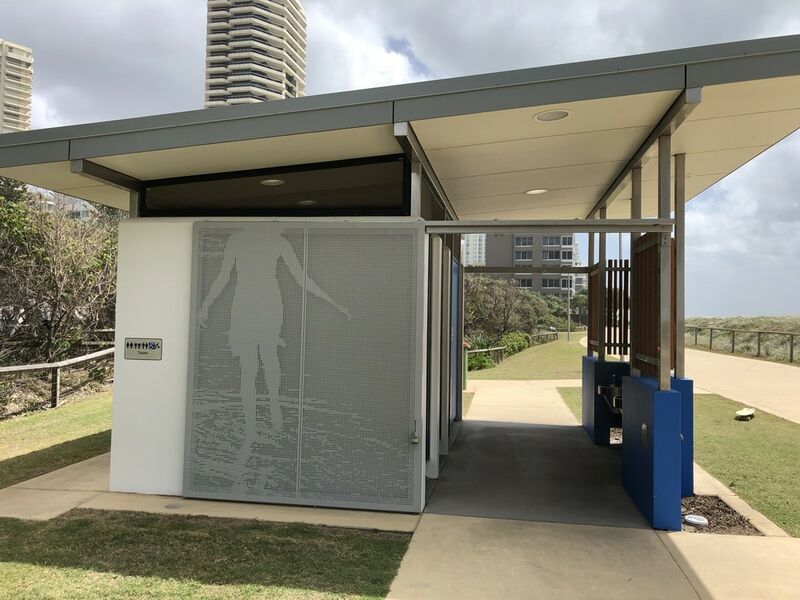 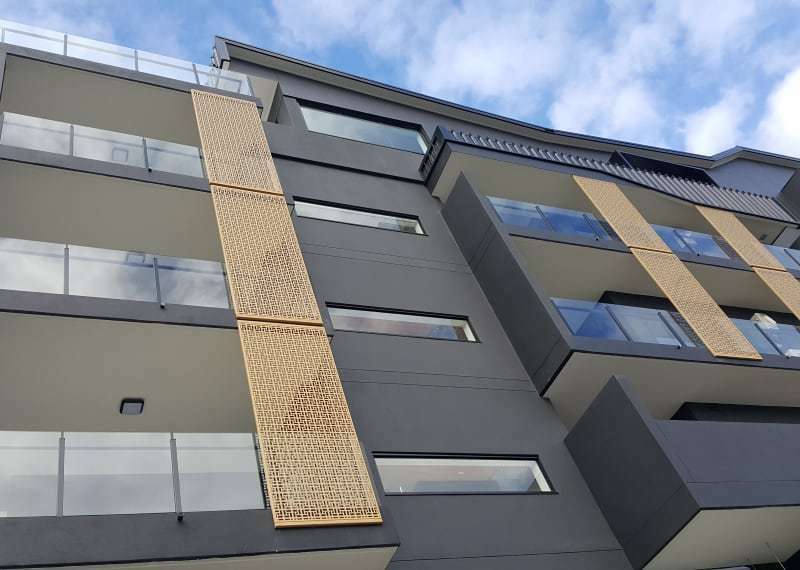 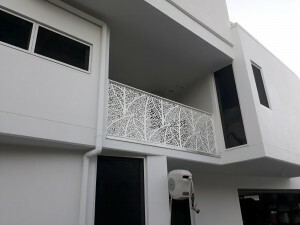 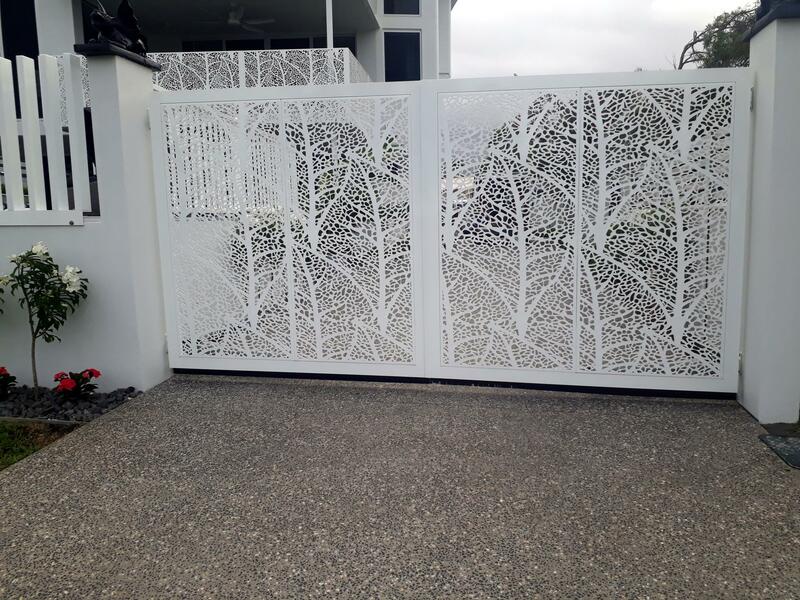 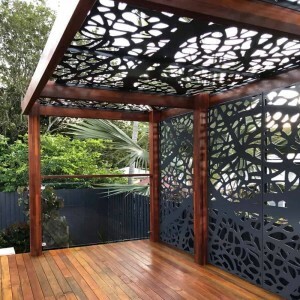 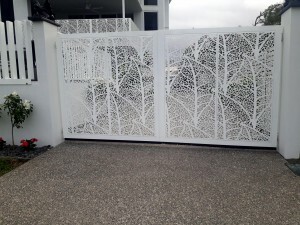 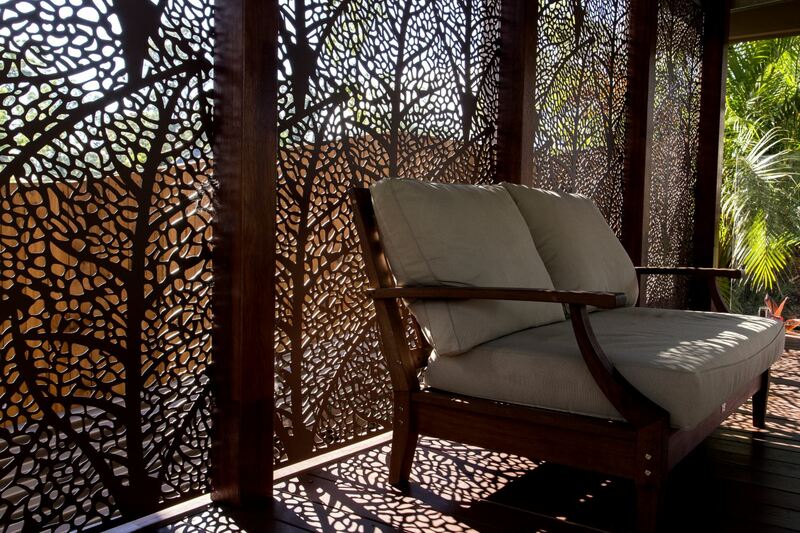 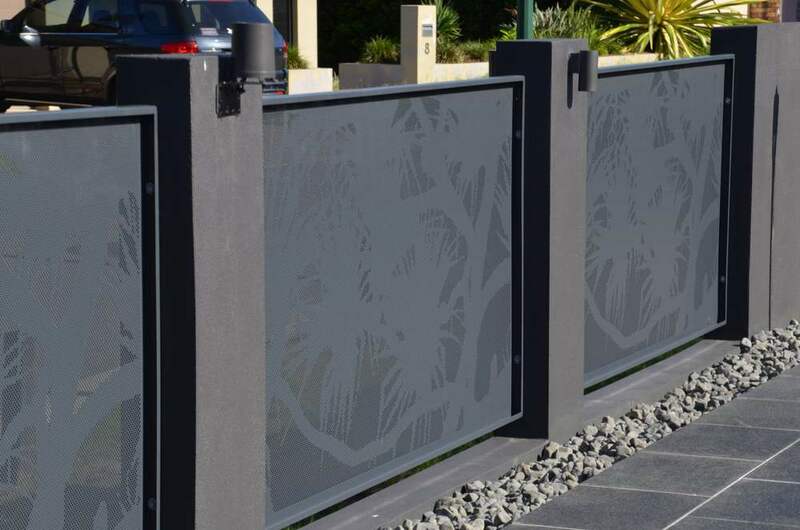 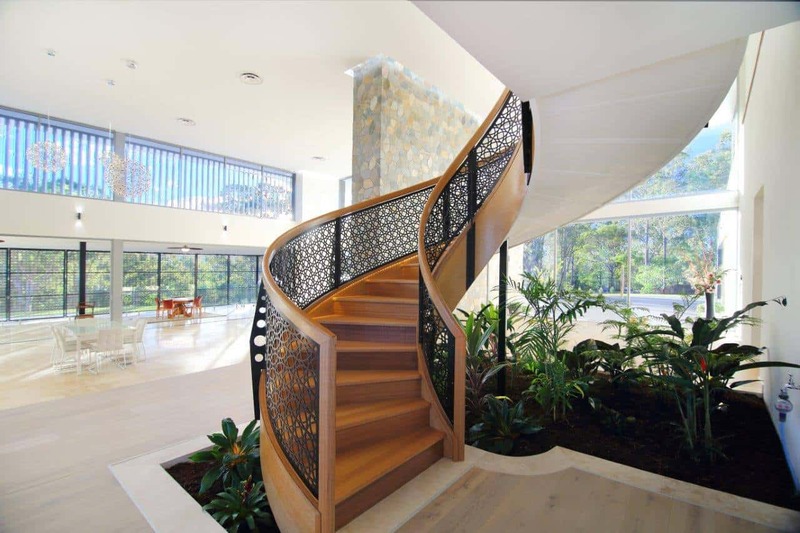 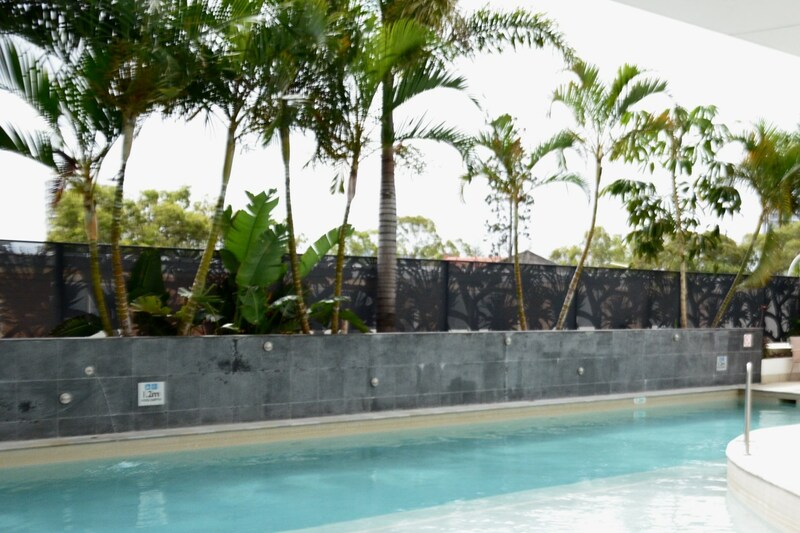 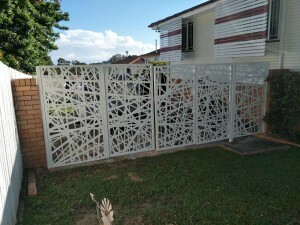 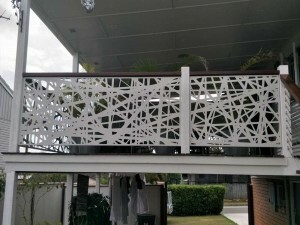 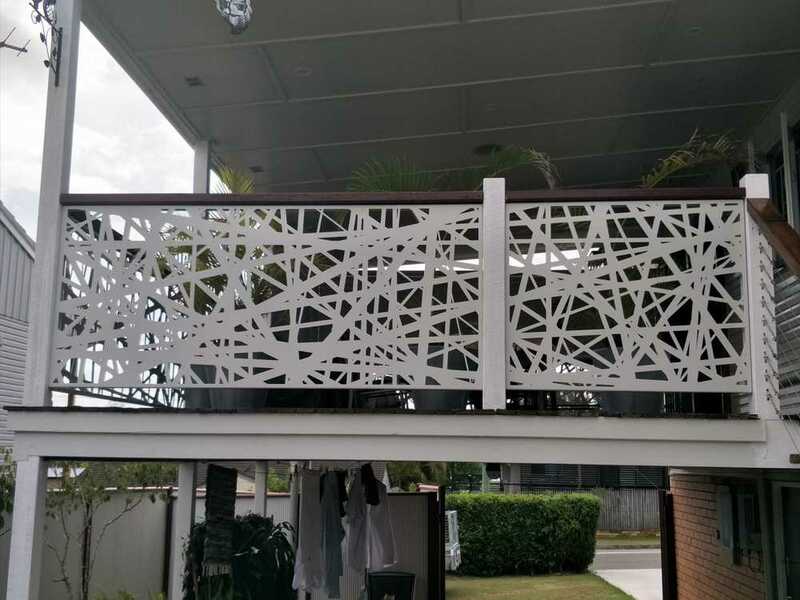 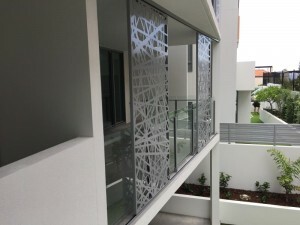 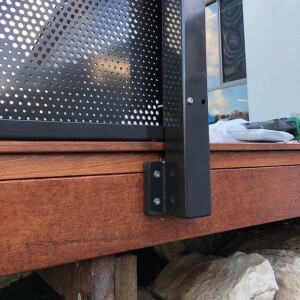 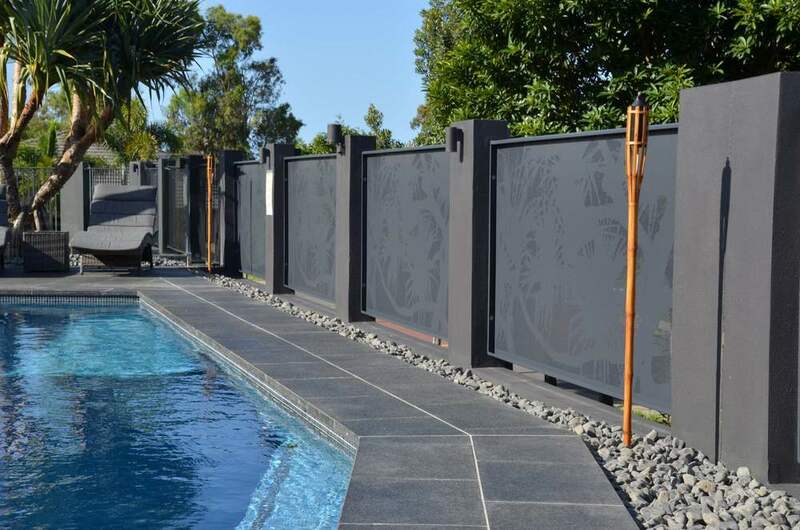 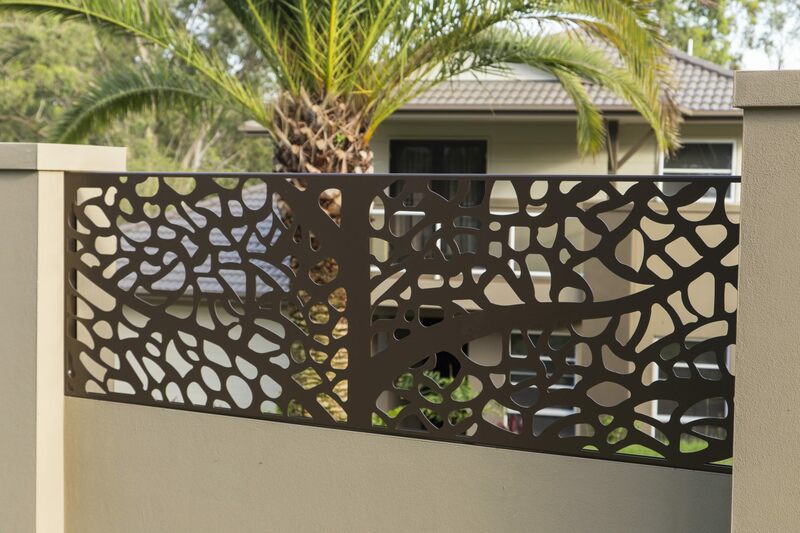 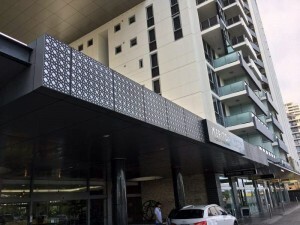 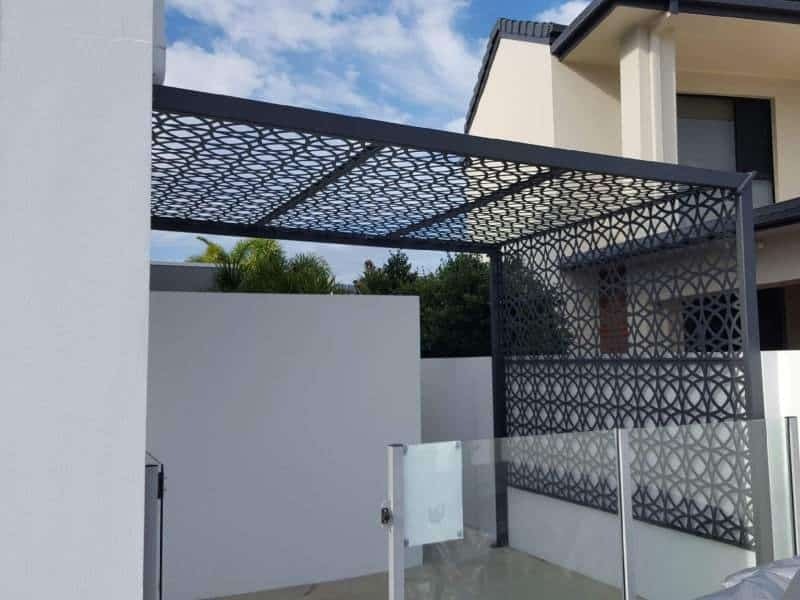 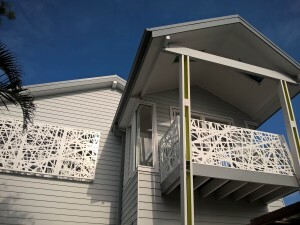 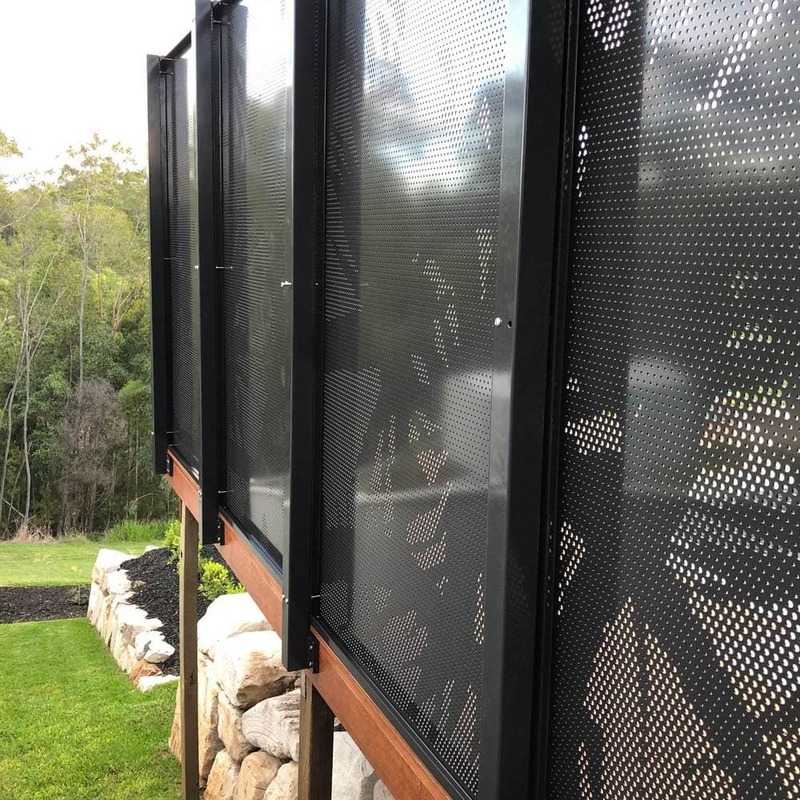 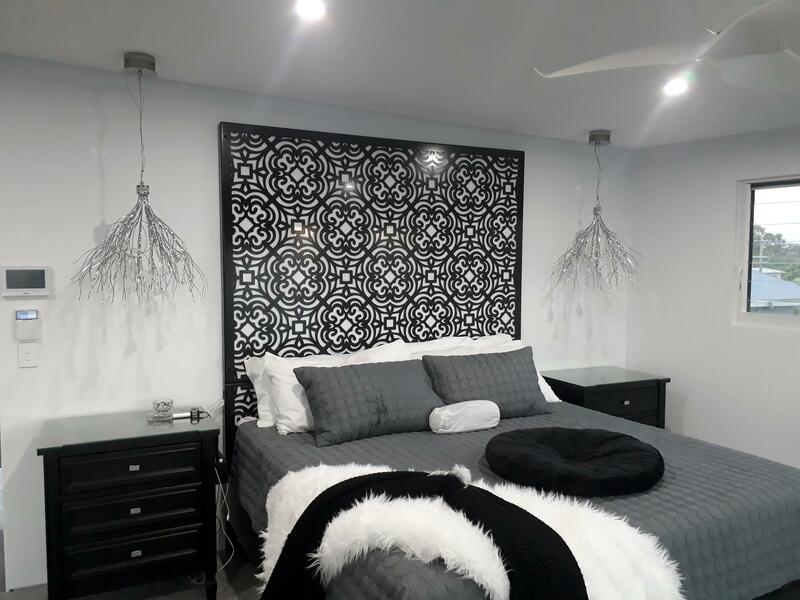 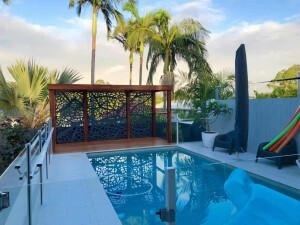 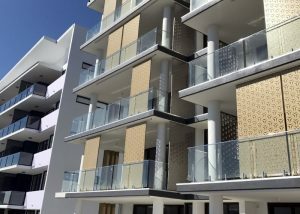 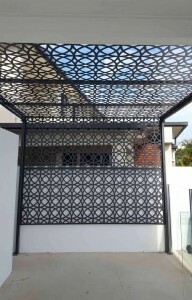 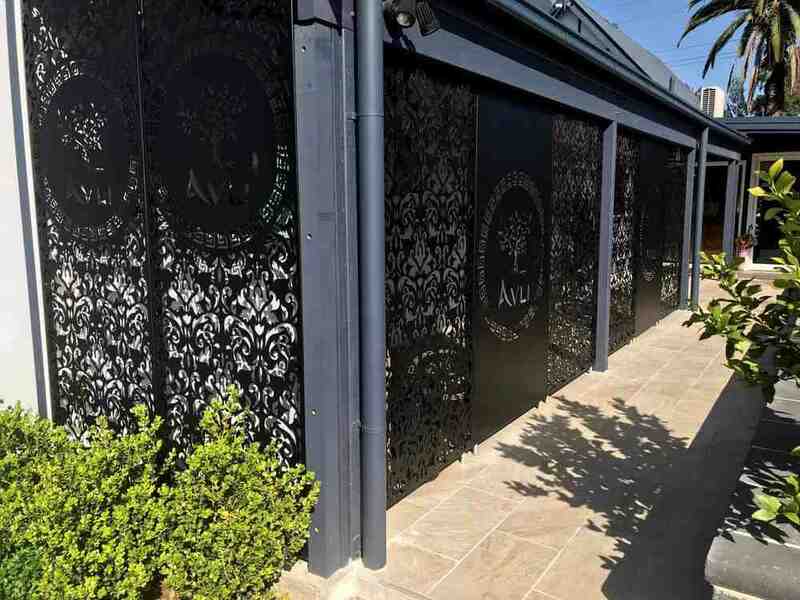 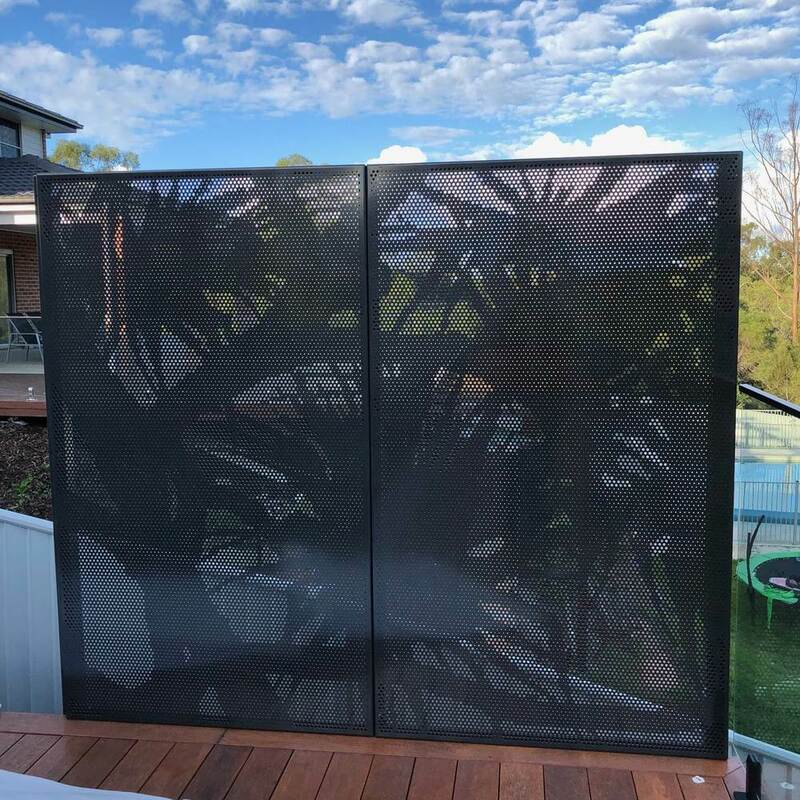 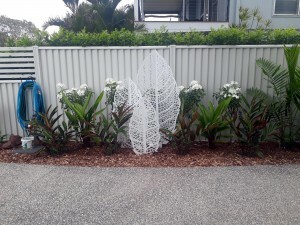 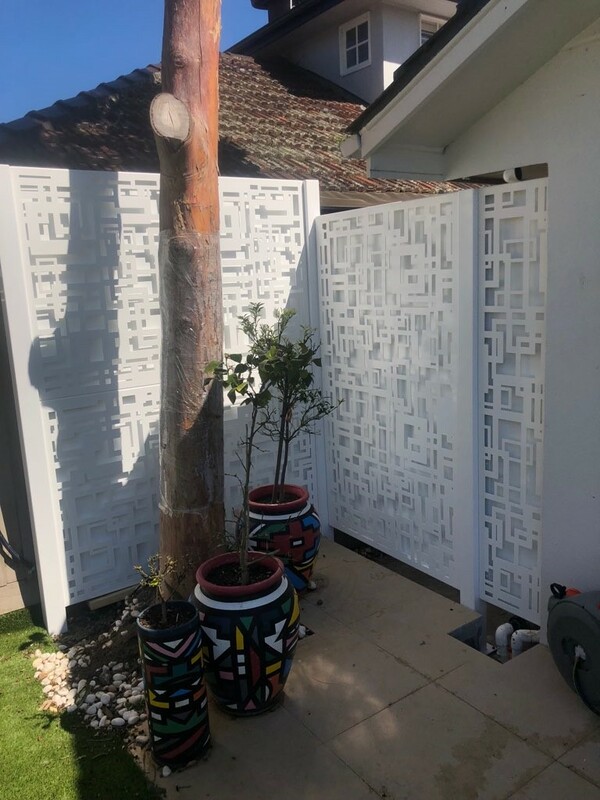 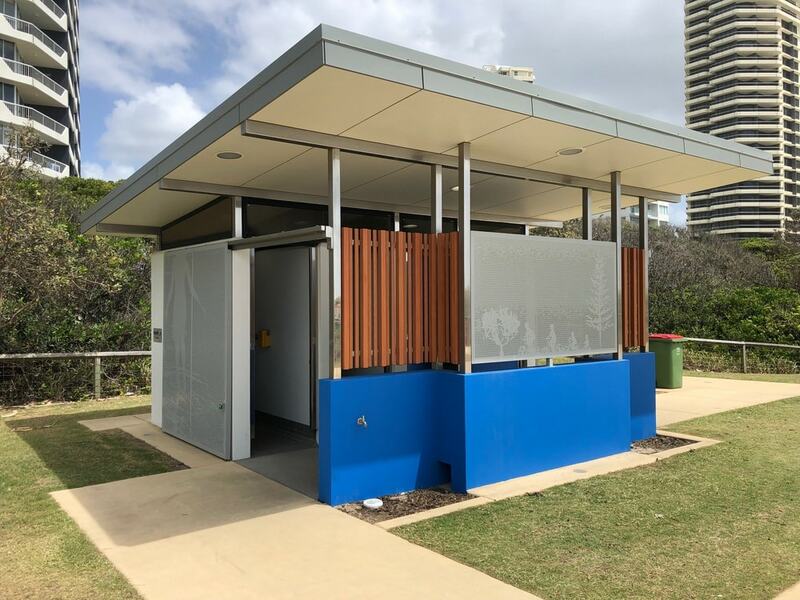 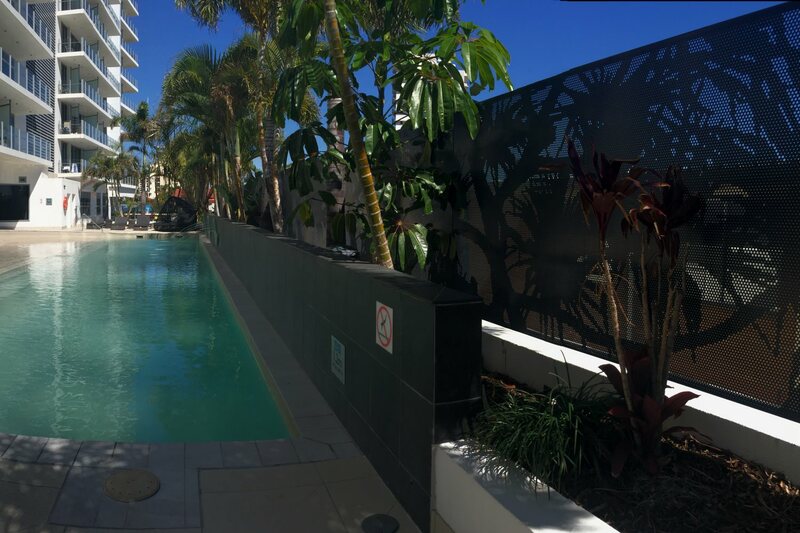 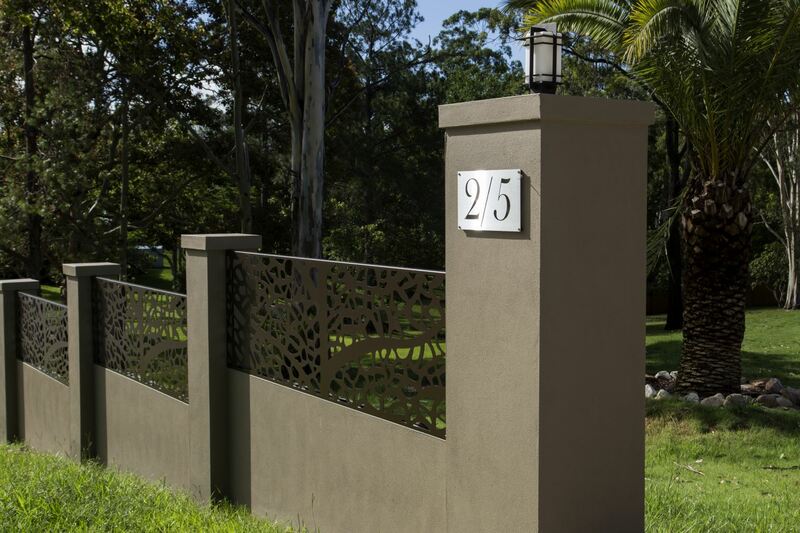 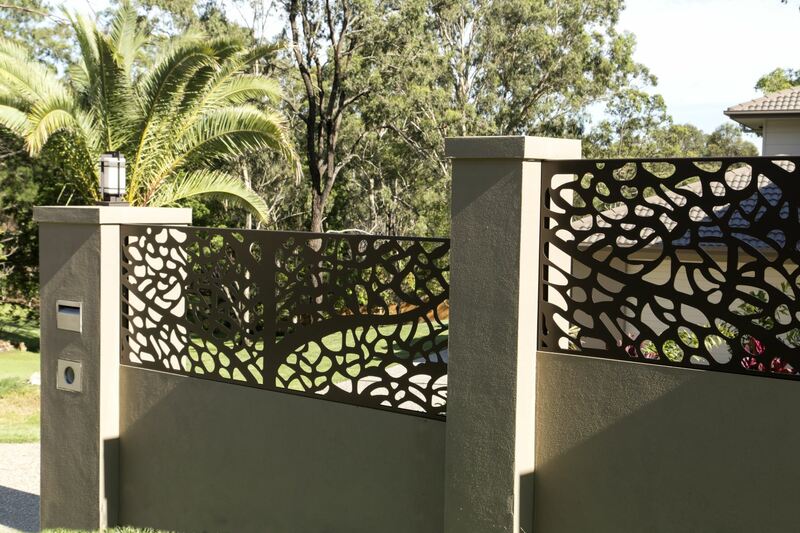 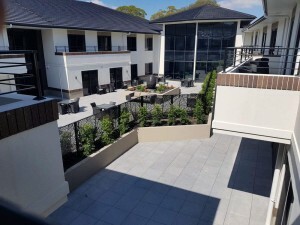 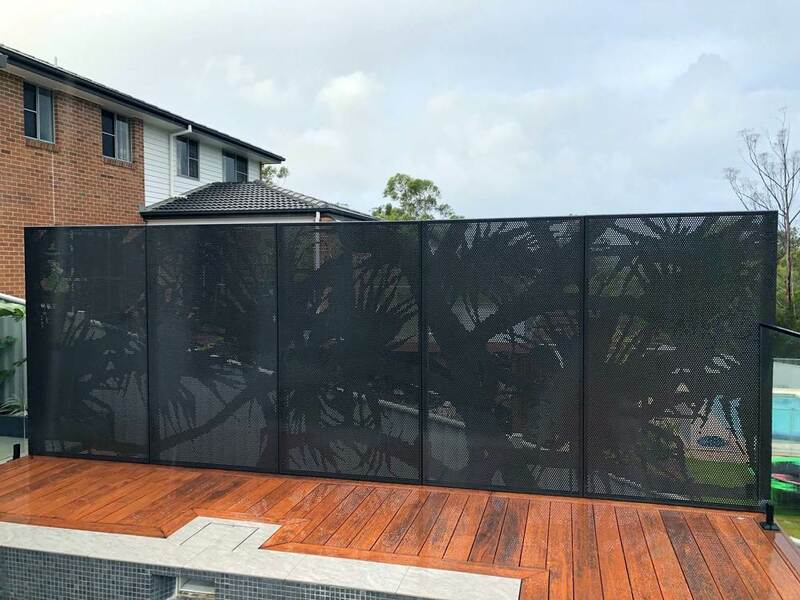 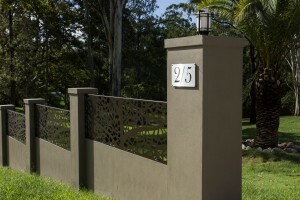 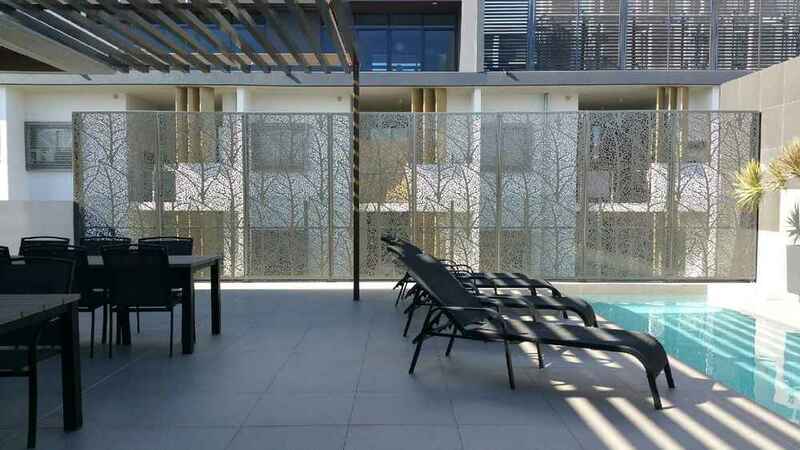 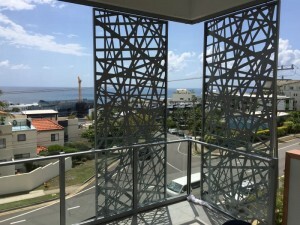 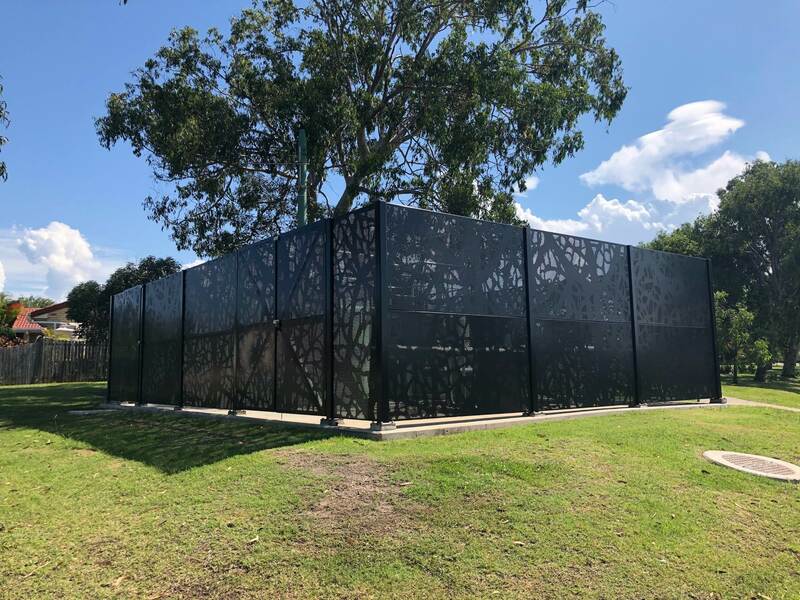 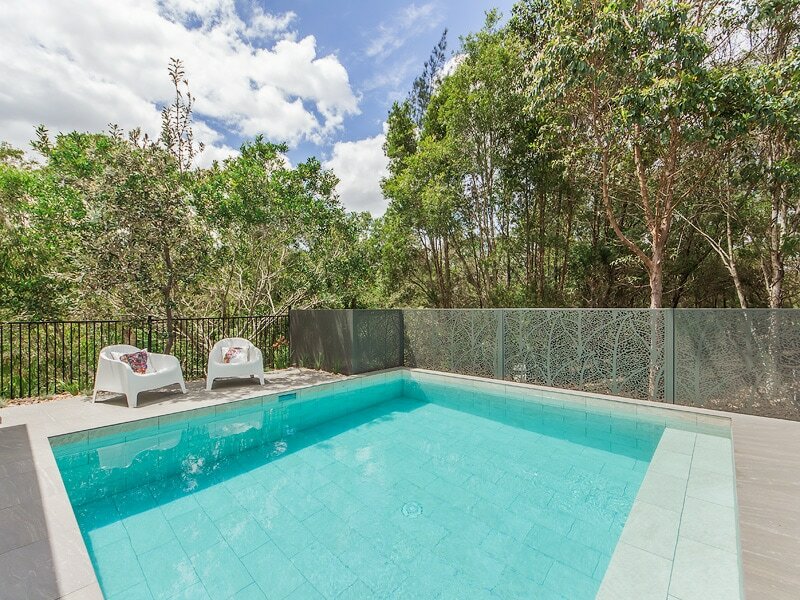 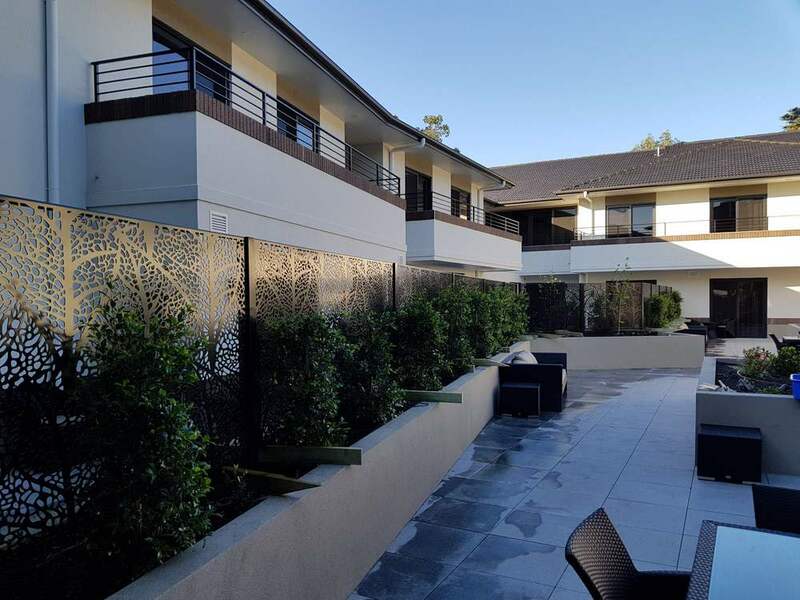 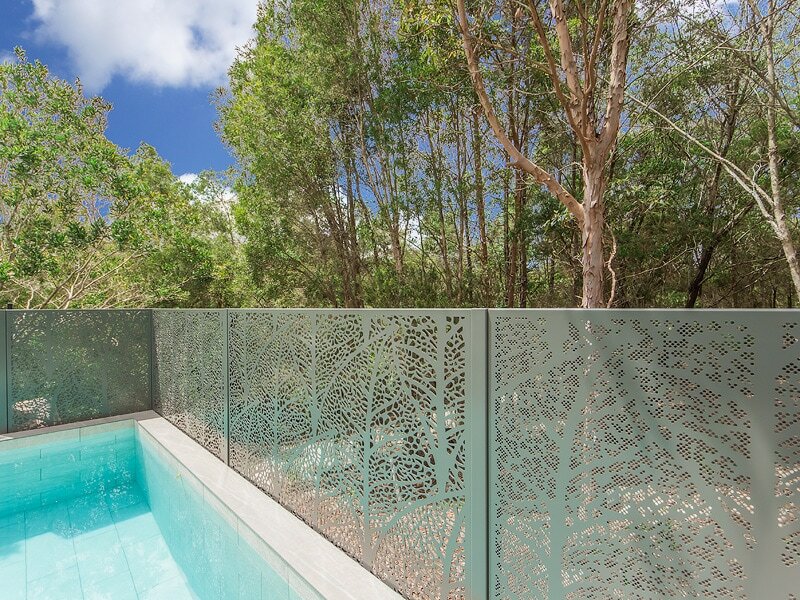 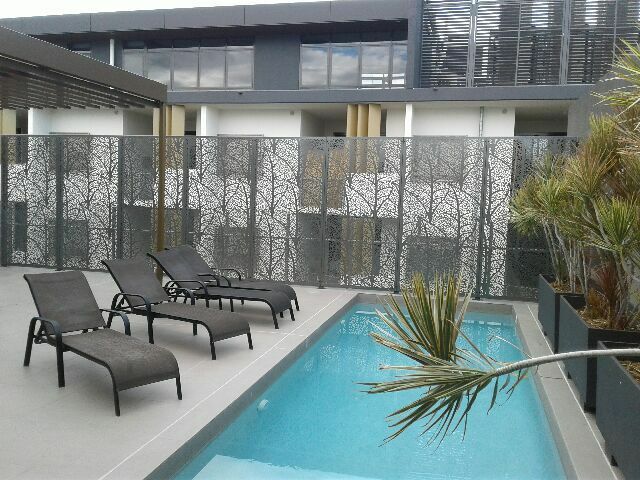 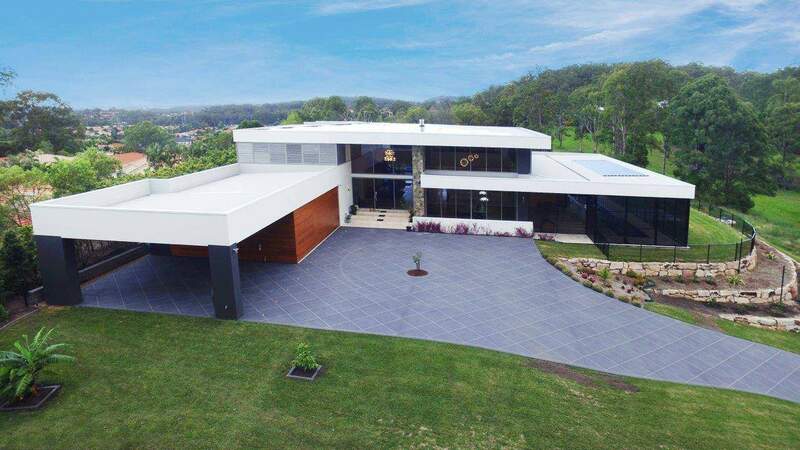 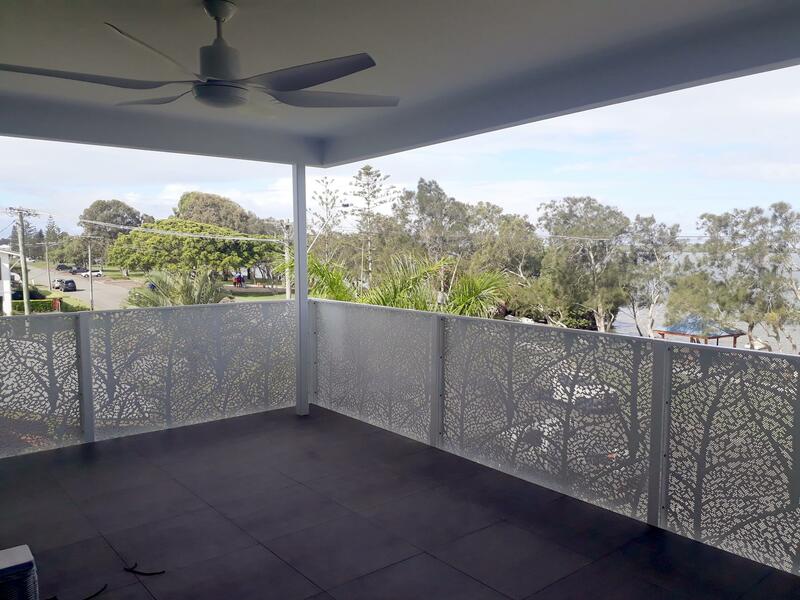 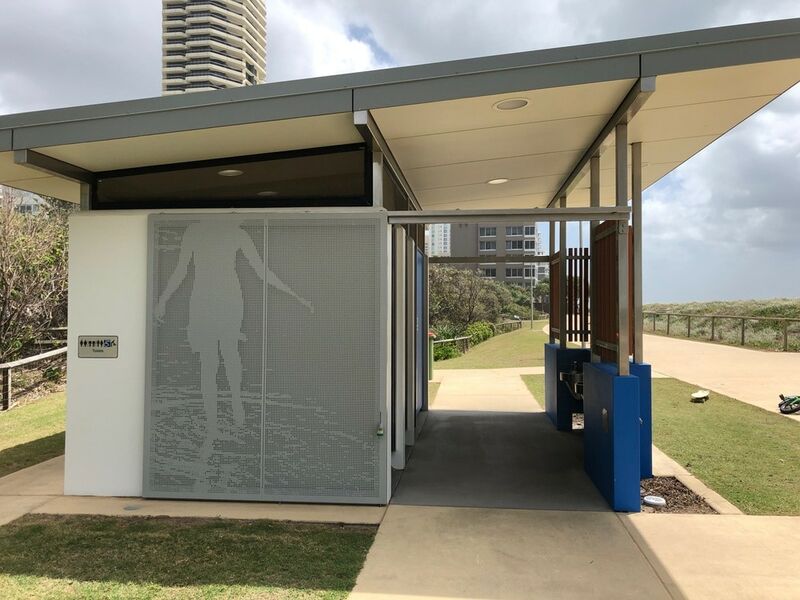 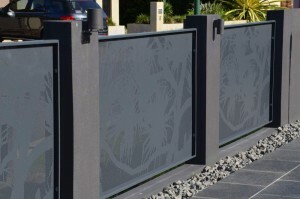 This high end project in Mooloolaba required a custom Birds Nest screen design, all precisely laser cut to suit their exact requirements. 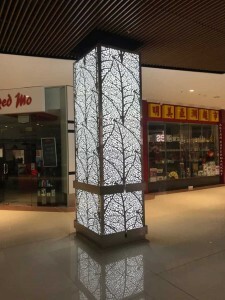 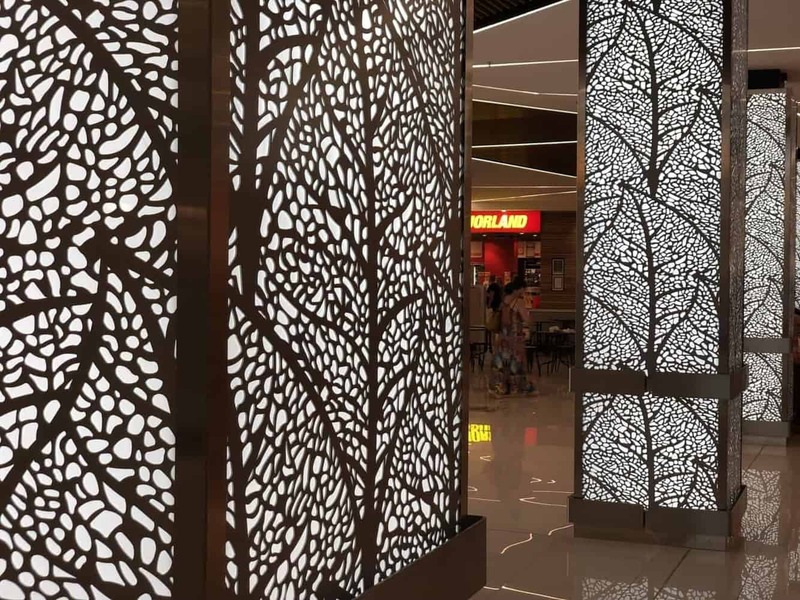 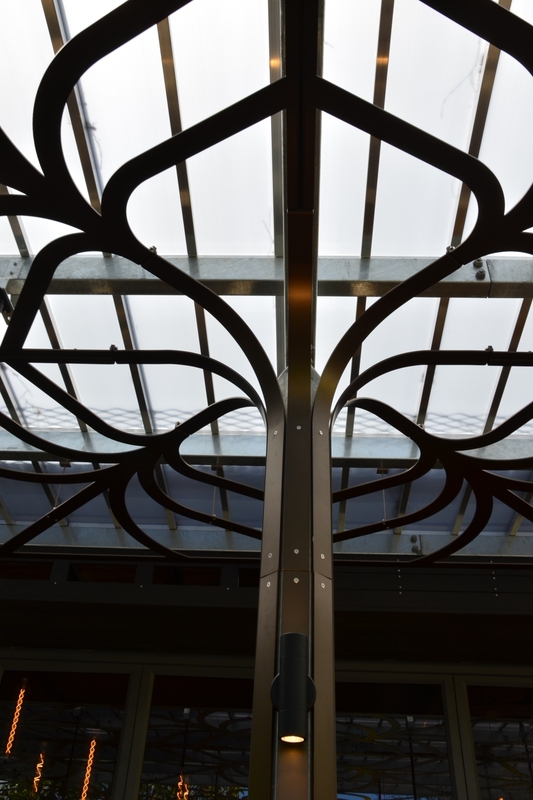 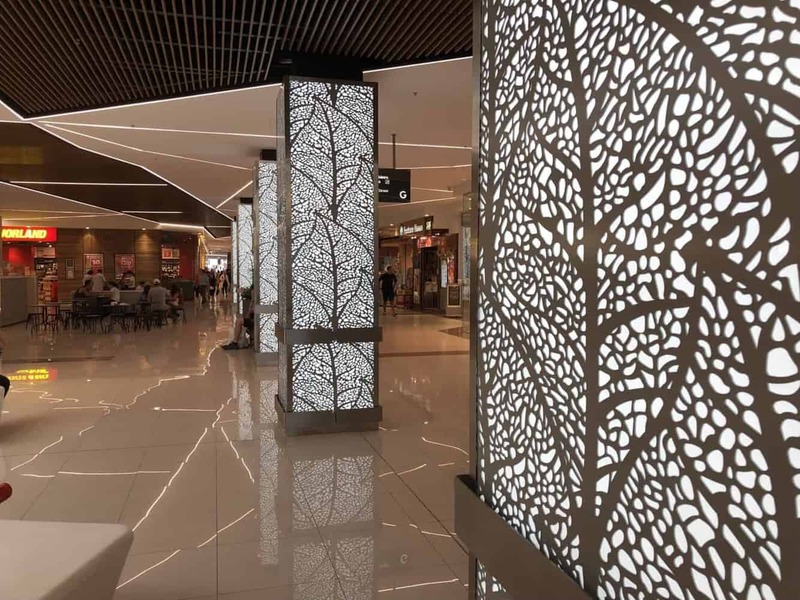 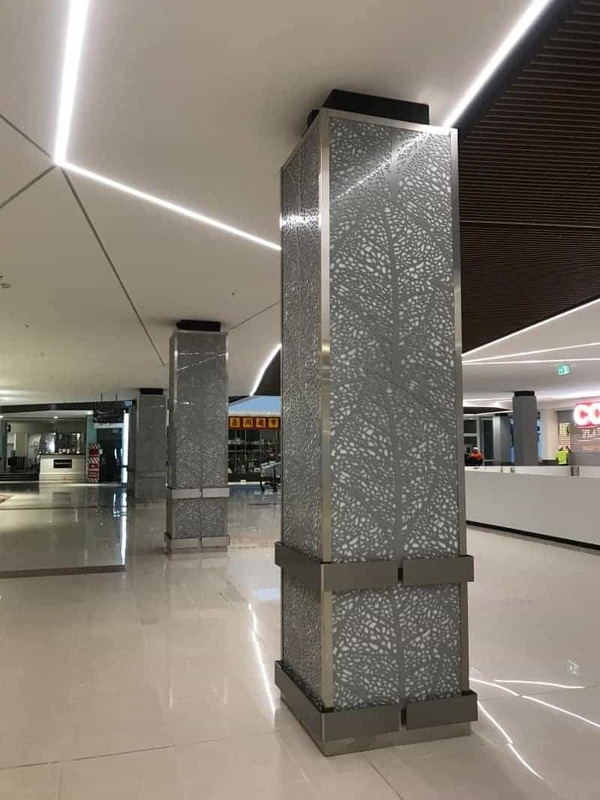 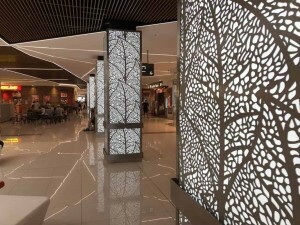 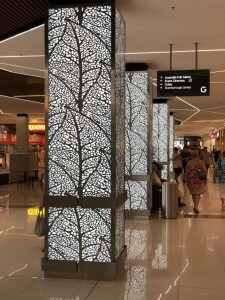 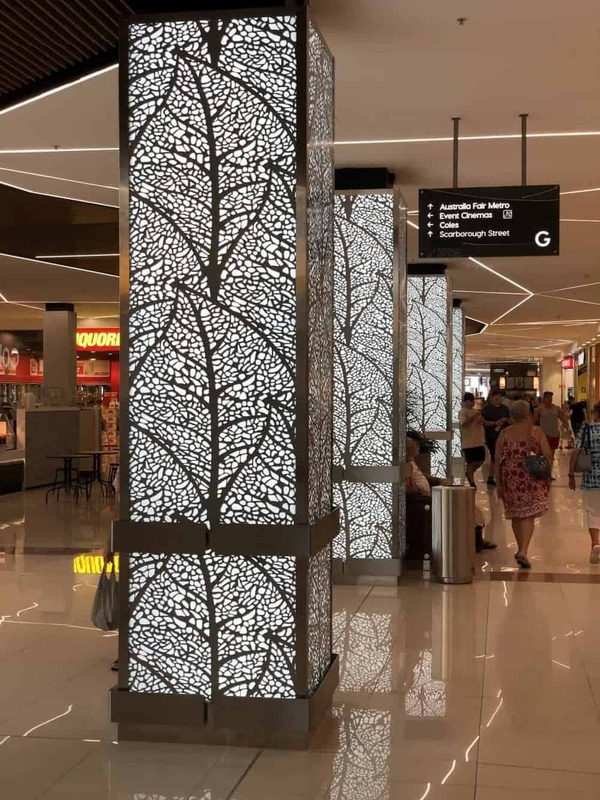 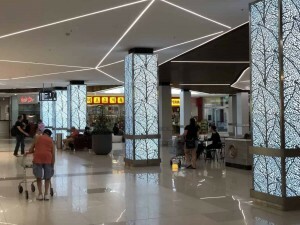 DSD created a solution to add a much need face-lift to existing structural columns by installing back lit Autumn Leaves laser cut screens. 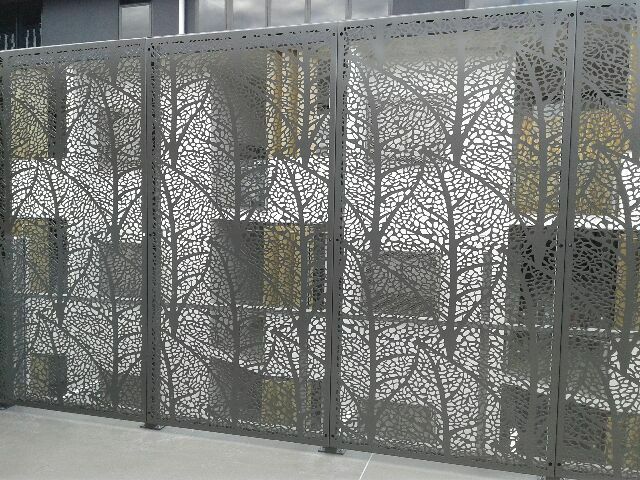 The Laser Cut leaf vines was used on this project as decorative window covers to add an organic look to a commercial/industrial building. 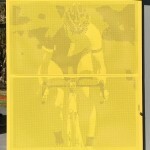 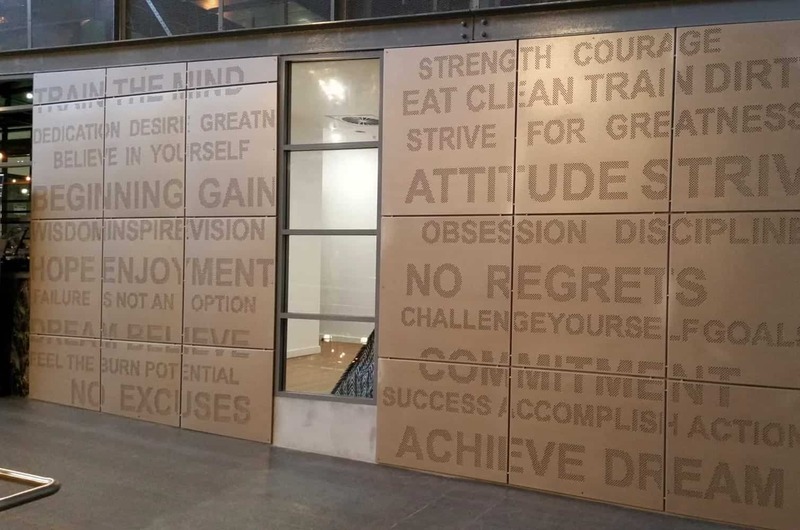 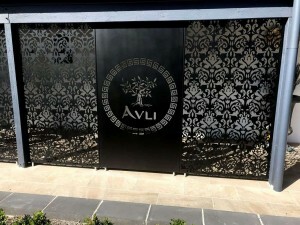 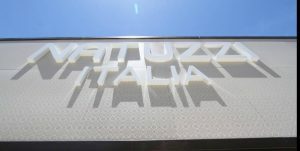 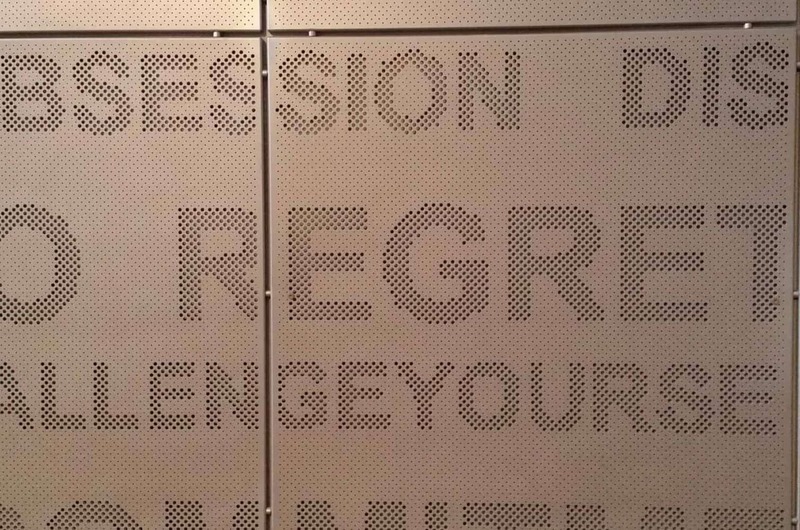 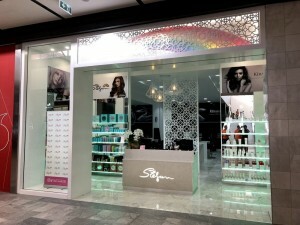 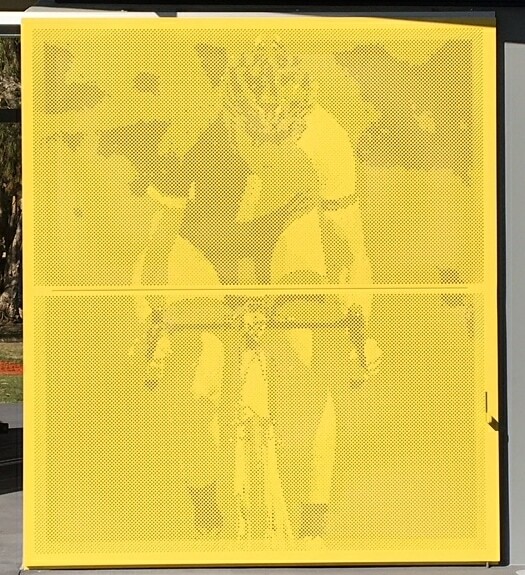 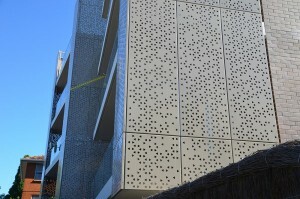 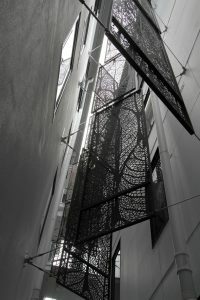 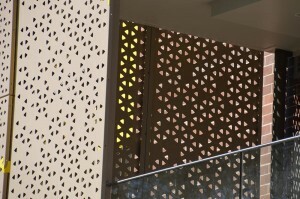 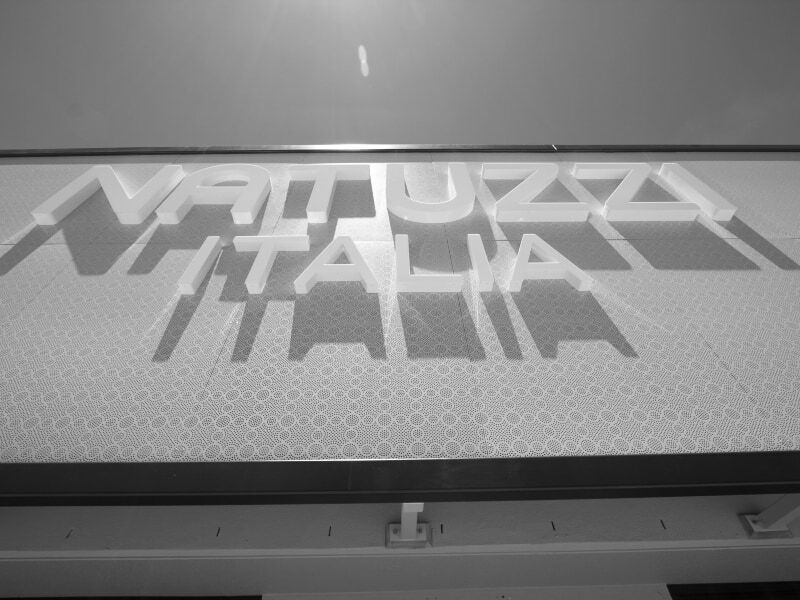 DSD custom made perforated screens for the store facade. The overall result was a contemporary modern feel with class and style. 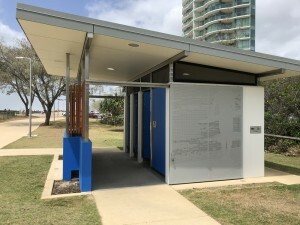 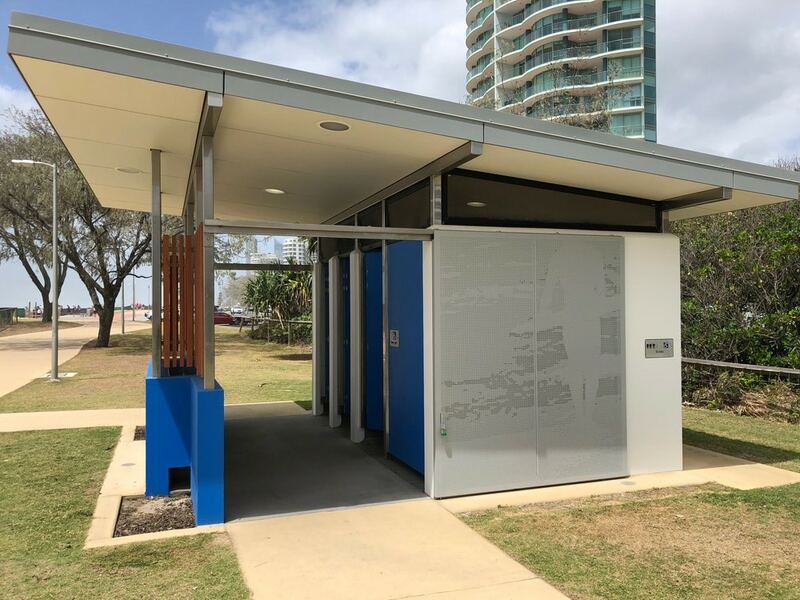 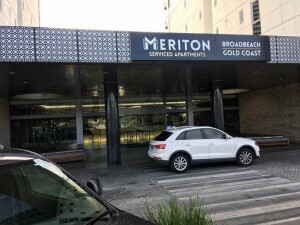 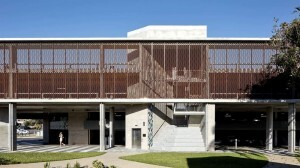 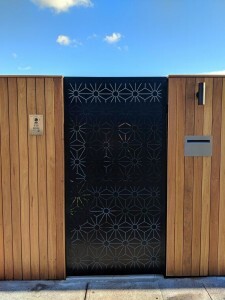 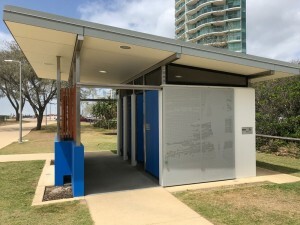 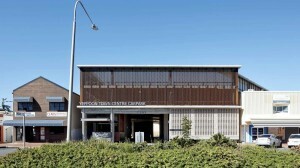 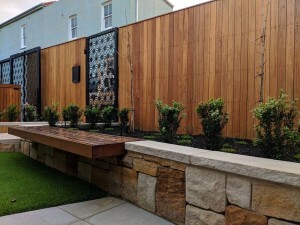 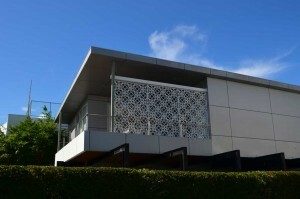 This architecturally designed building has feature “Corten Steel” cladding to the street façade and a unique privacy screen solution for the side walls. 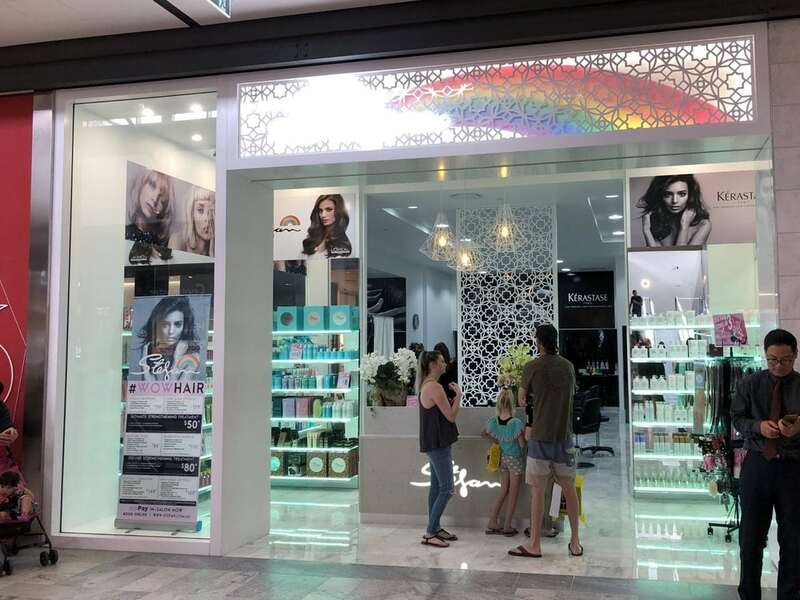 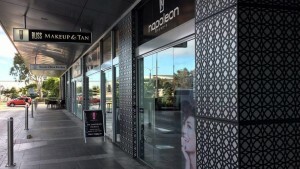 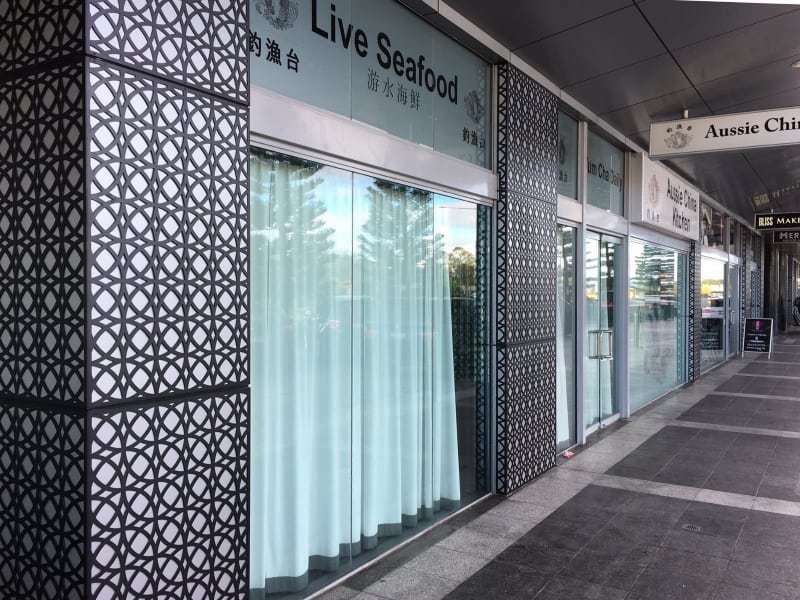 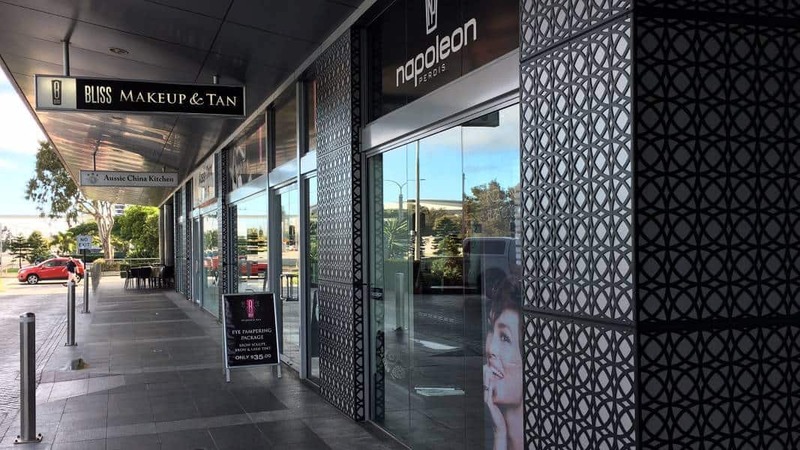 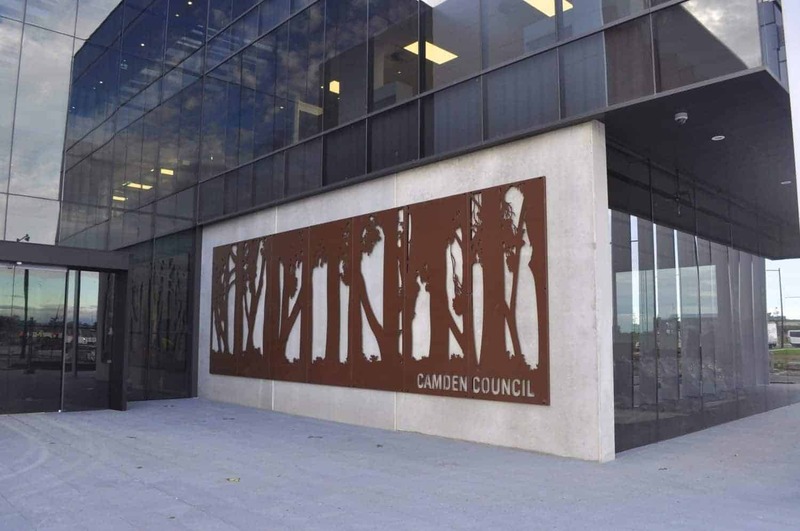 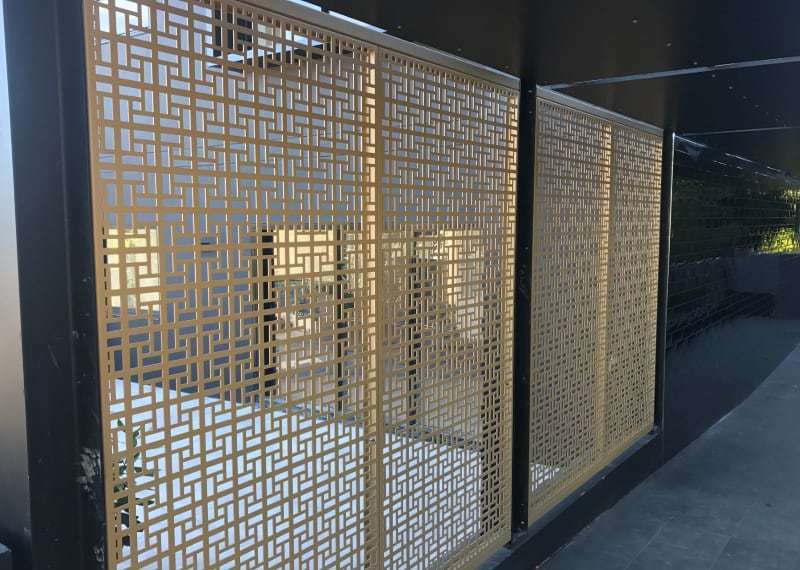 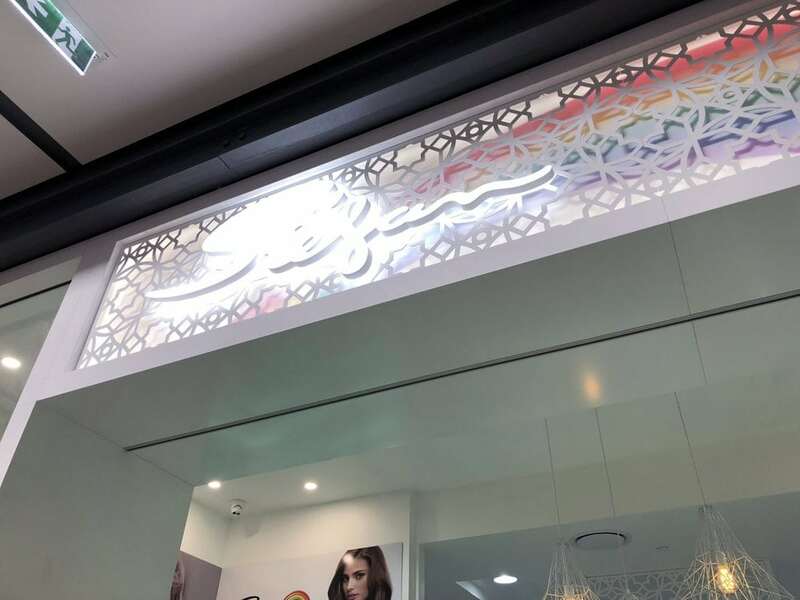 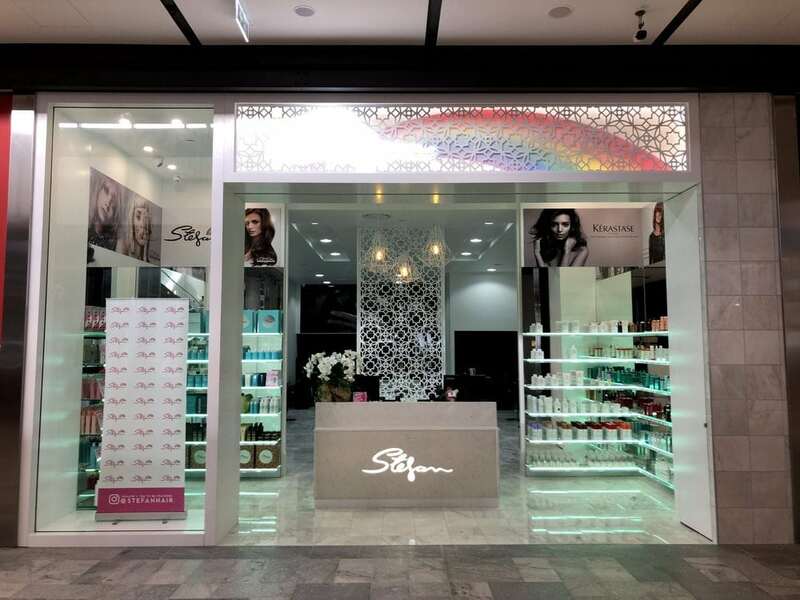 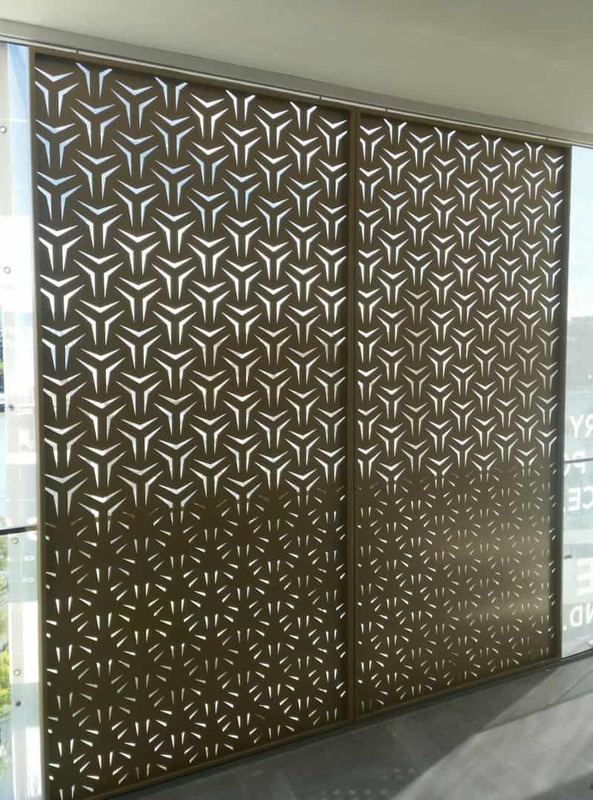 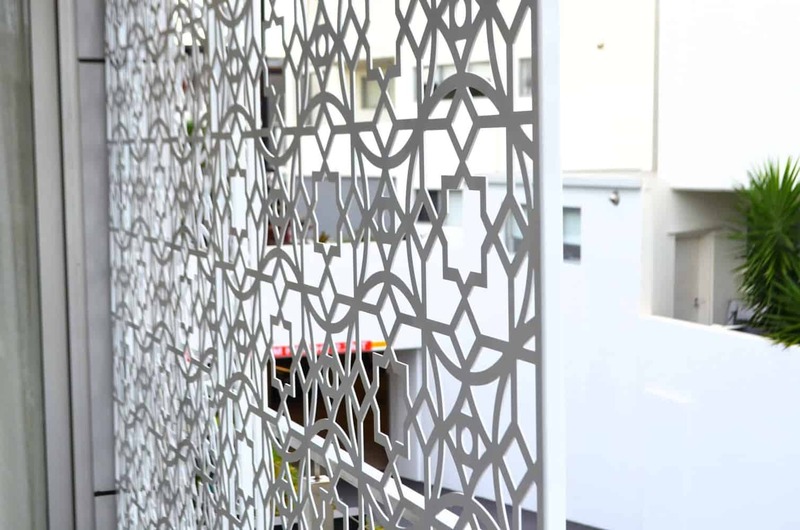 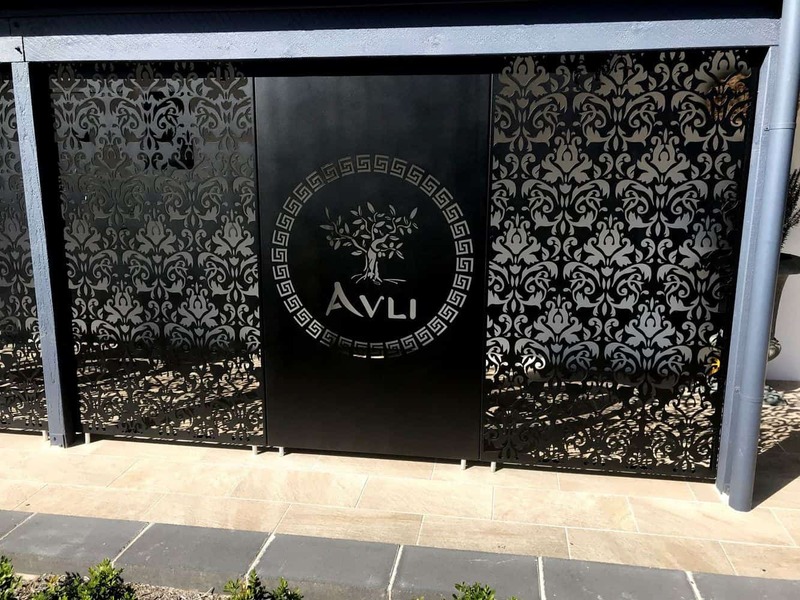 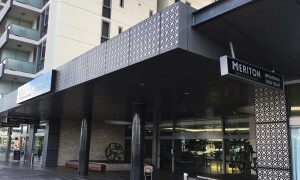 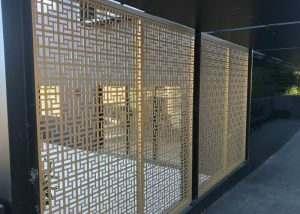 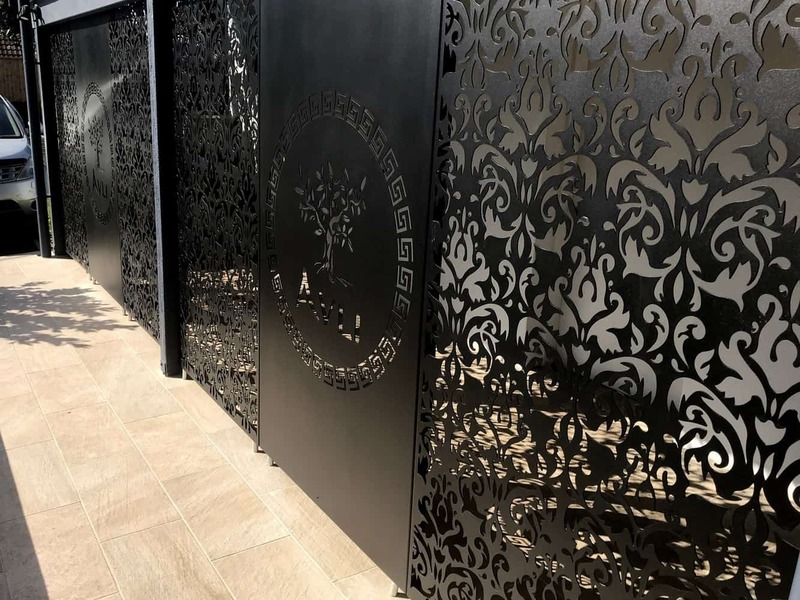 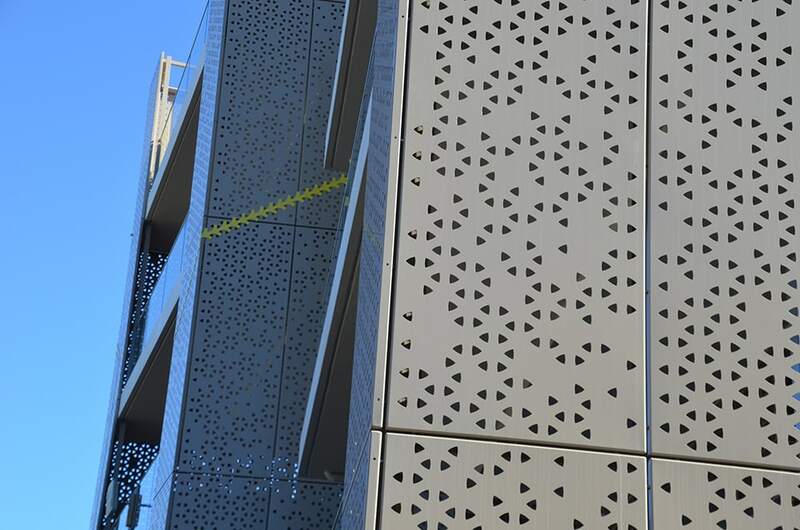 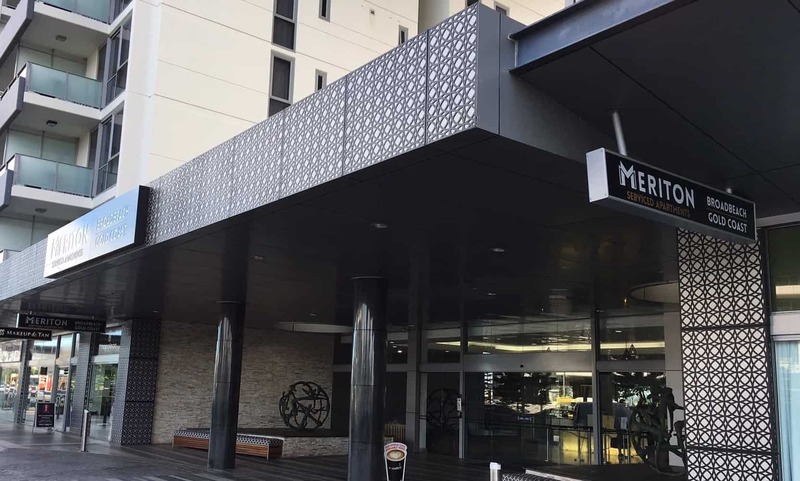 DSD were contracted for this project to update the facade of the building & retail precinct with laser cut decorative screens. 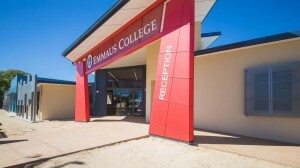 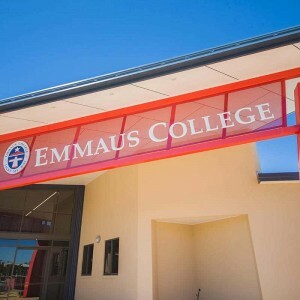 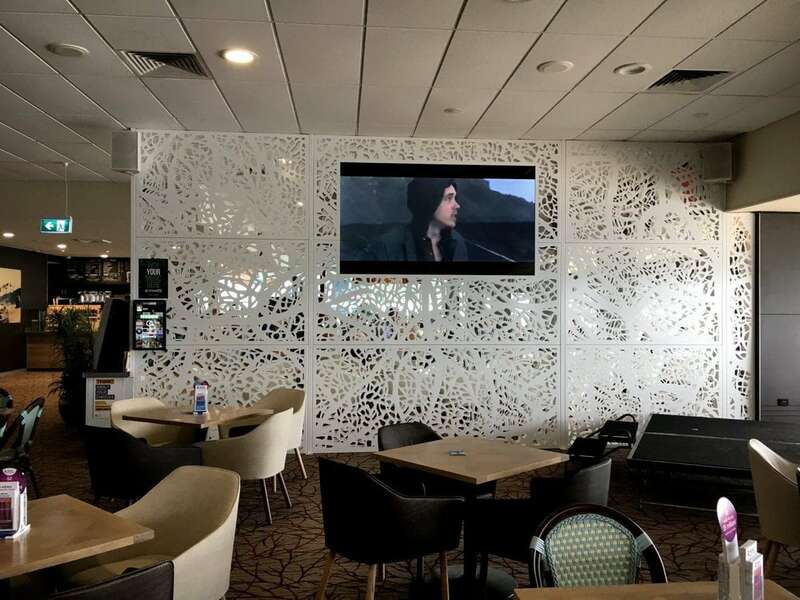 Redlands College used our DSD Fix Double Sided Screens to section off their cafe area but still but still kept the space bright and airy. 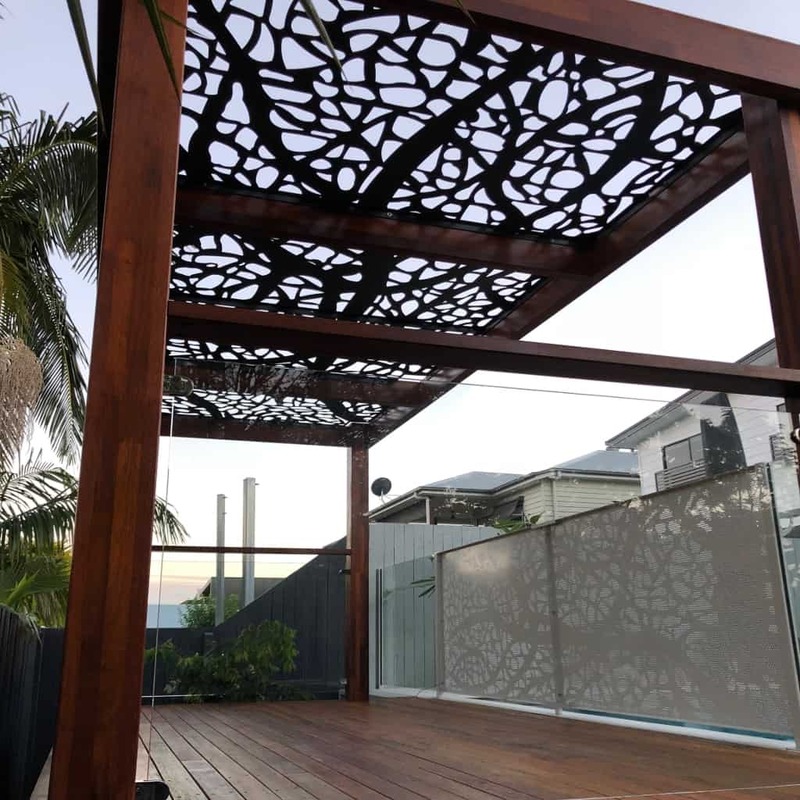 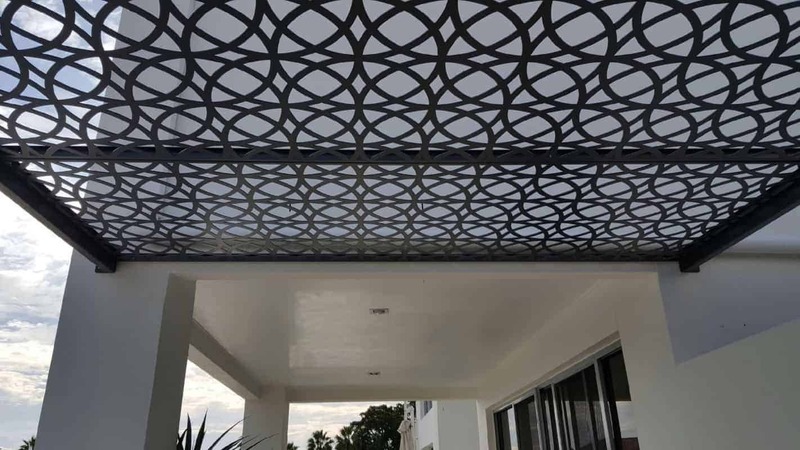 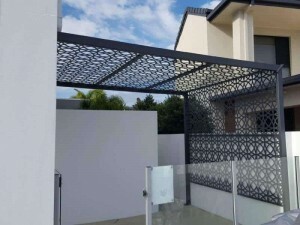 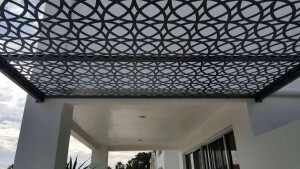 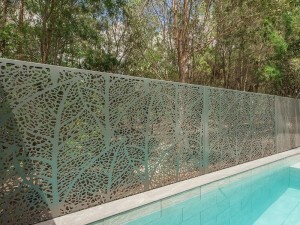 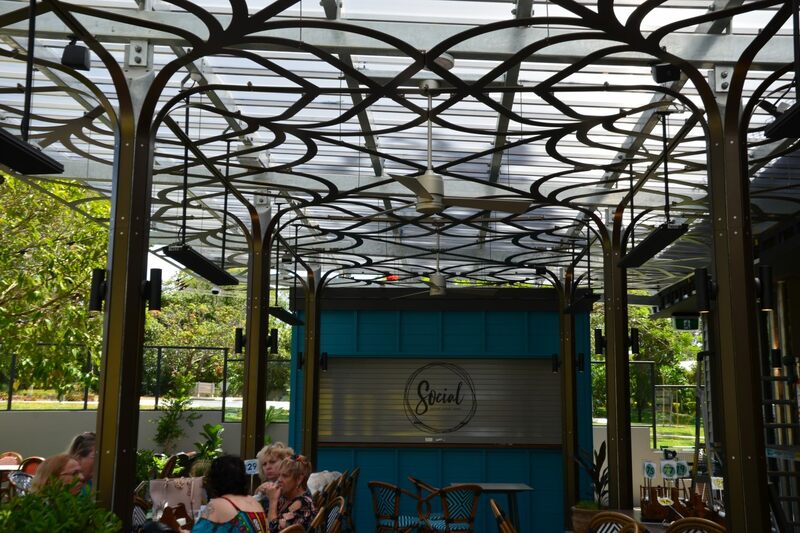 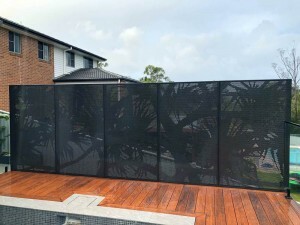 Made to order custom laser cut screens add some extra class and style to this pool pergola creating a beautiful pool side oasis. 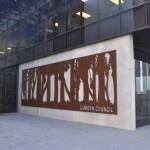 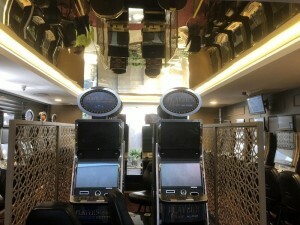 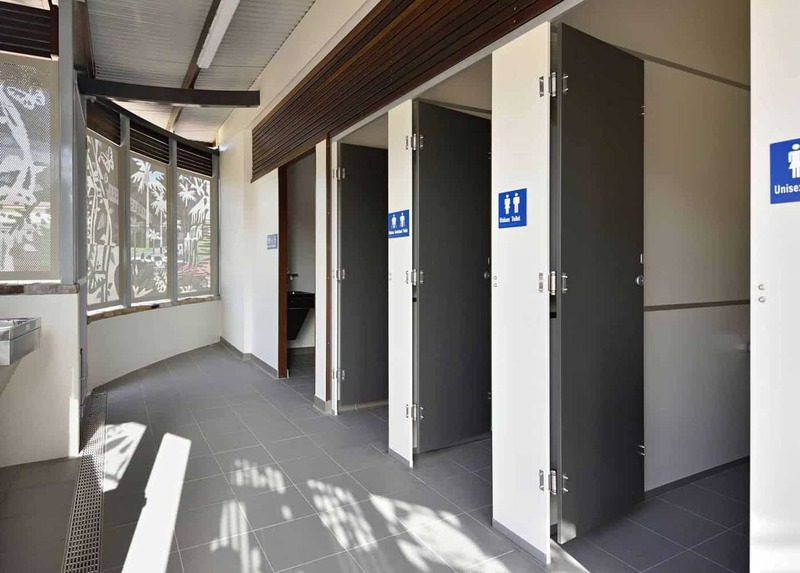 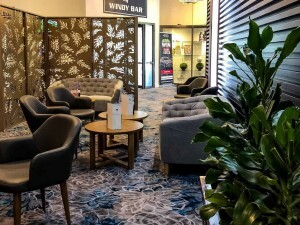 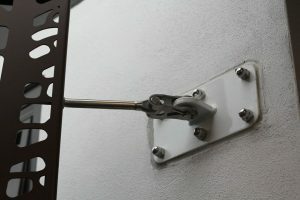 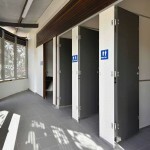 DSD has worked with many councils and shires to create some truly beautiful and functional solutions for each situation. 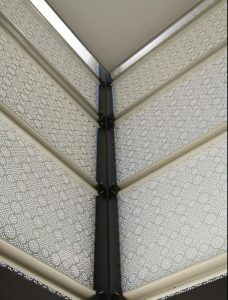 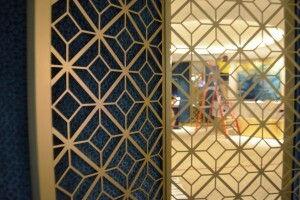 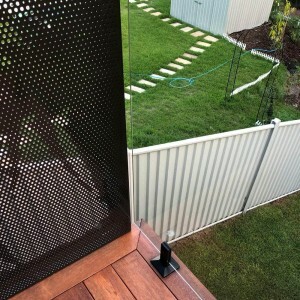 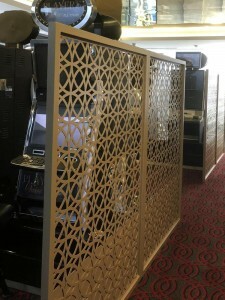 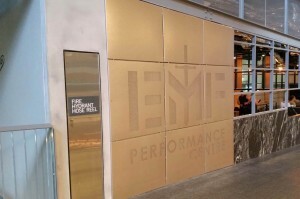 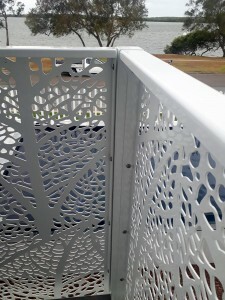 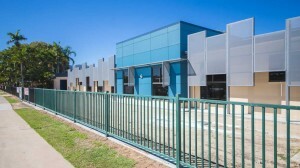 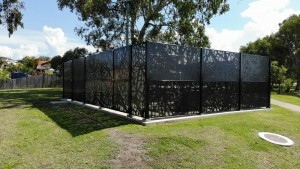 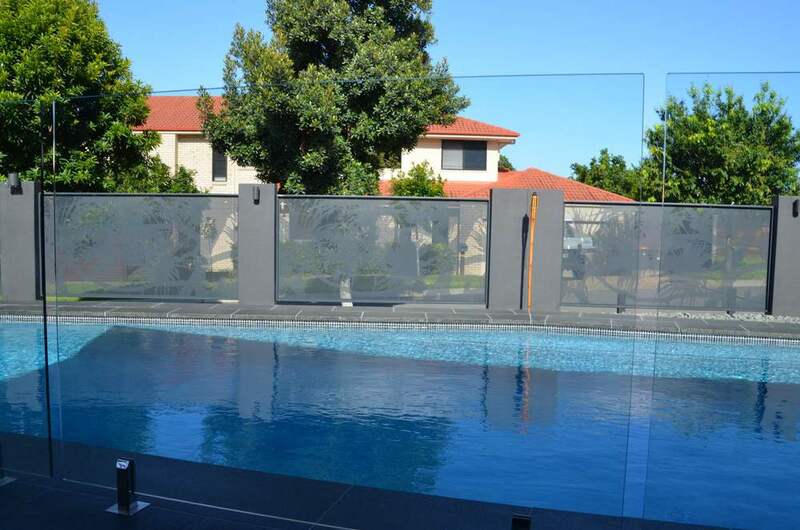 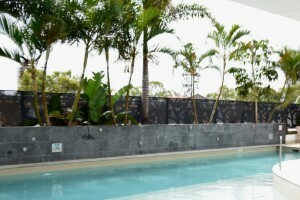 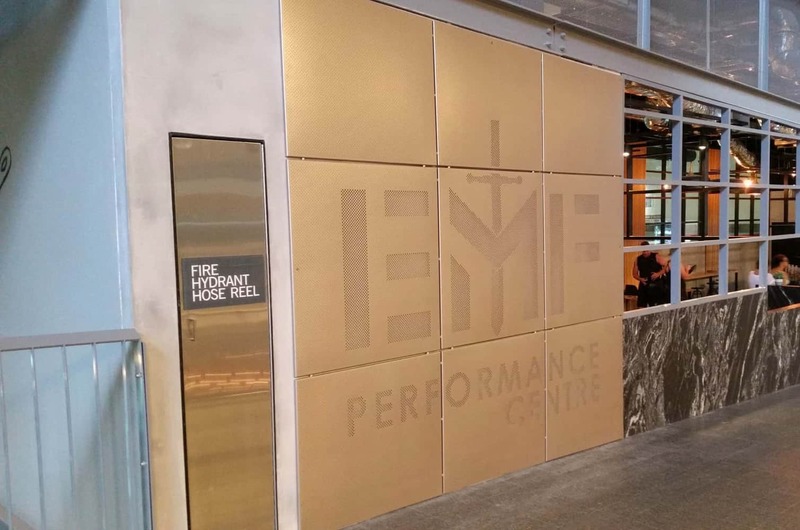 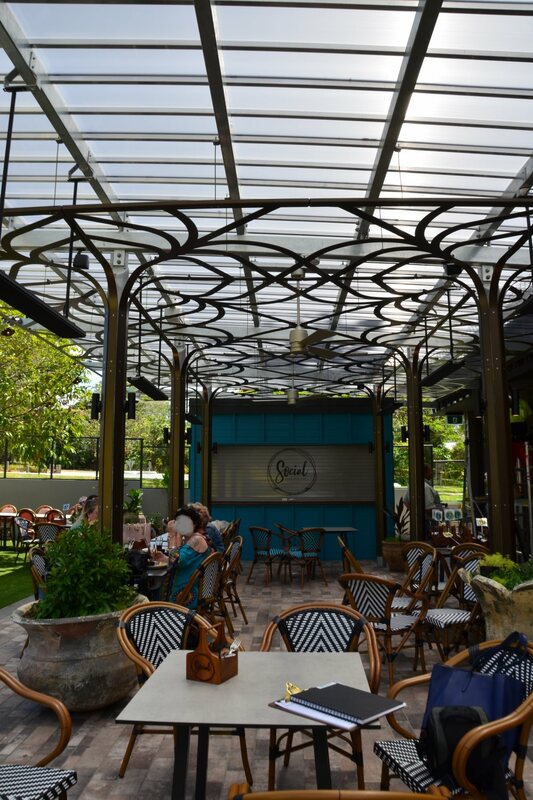 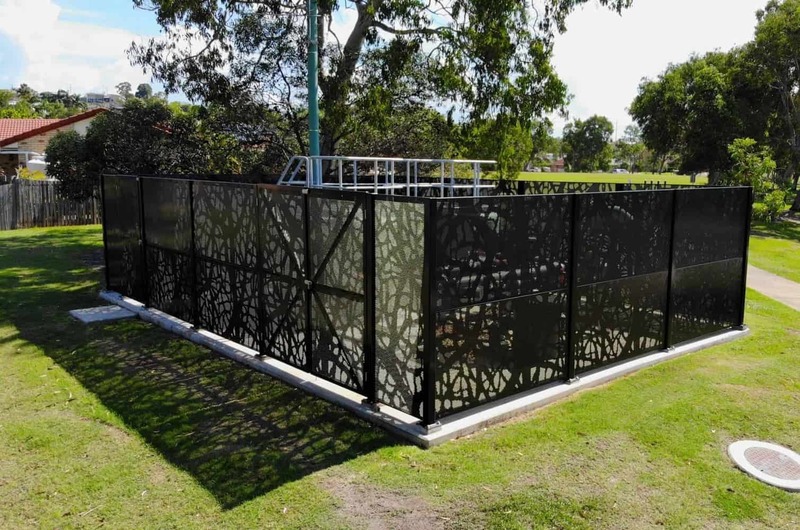 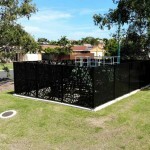 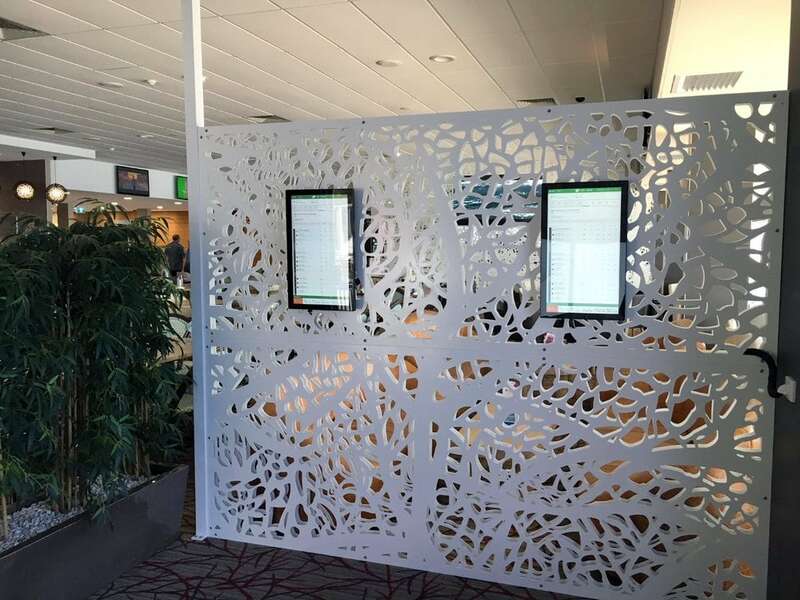 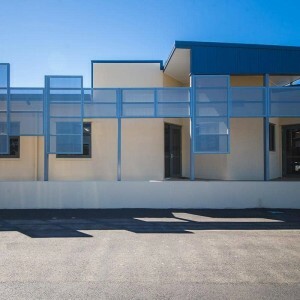 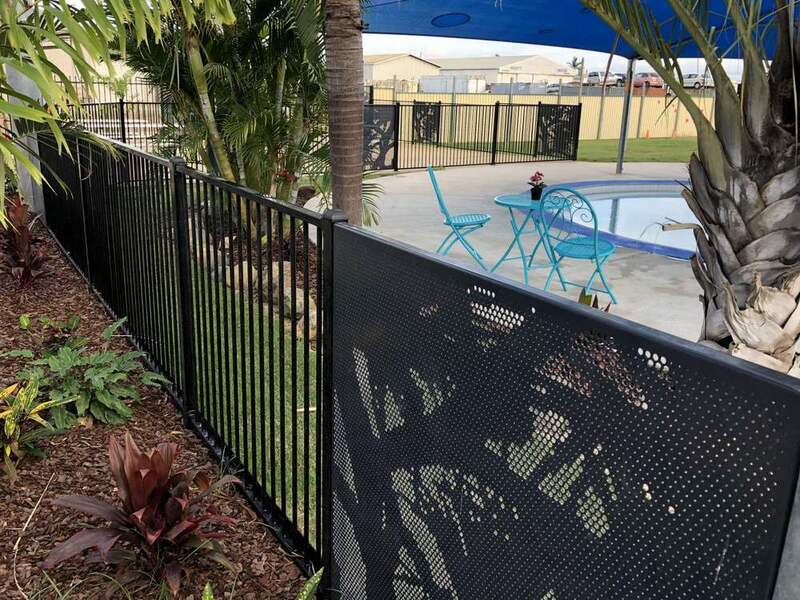 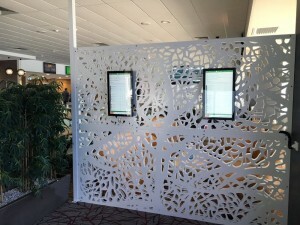 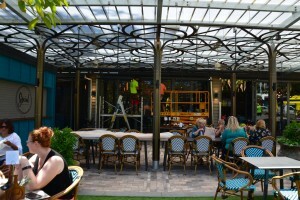 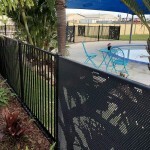 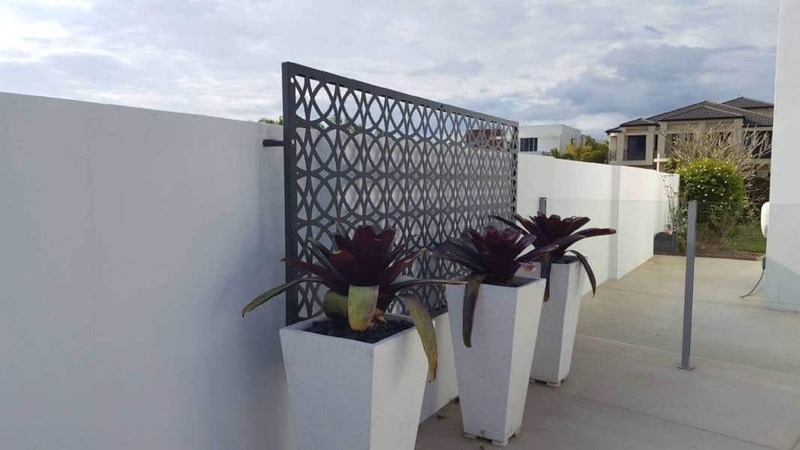 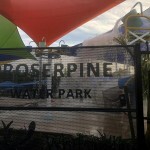 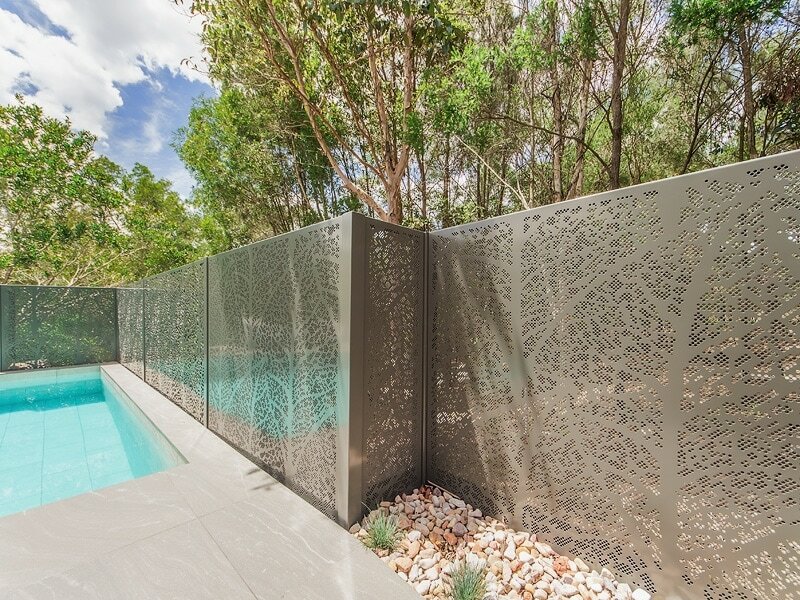 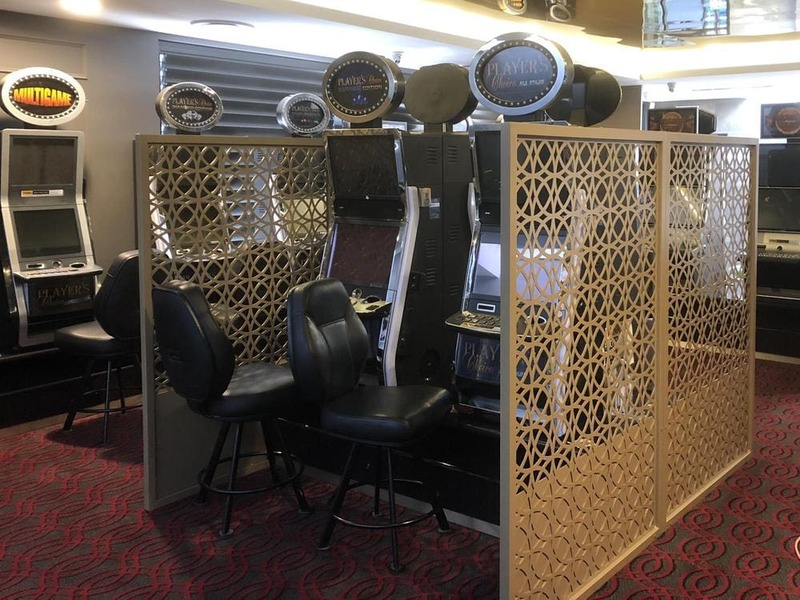 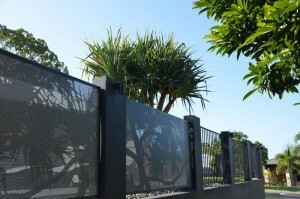 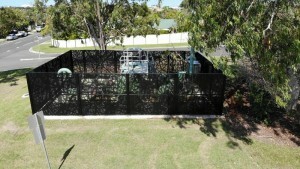 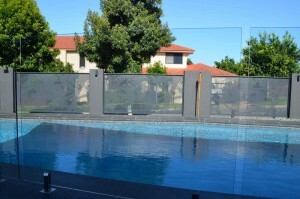 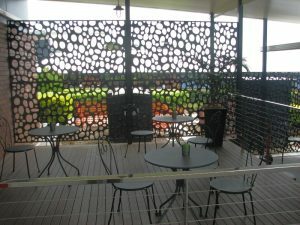 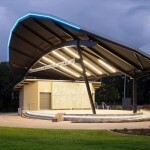 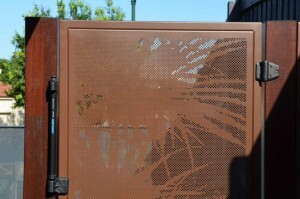 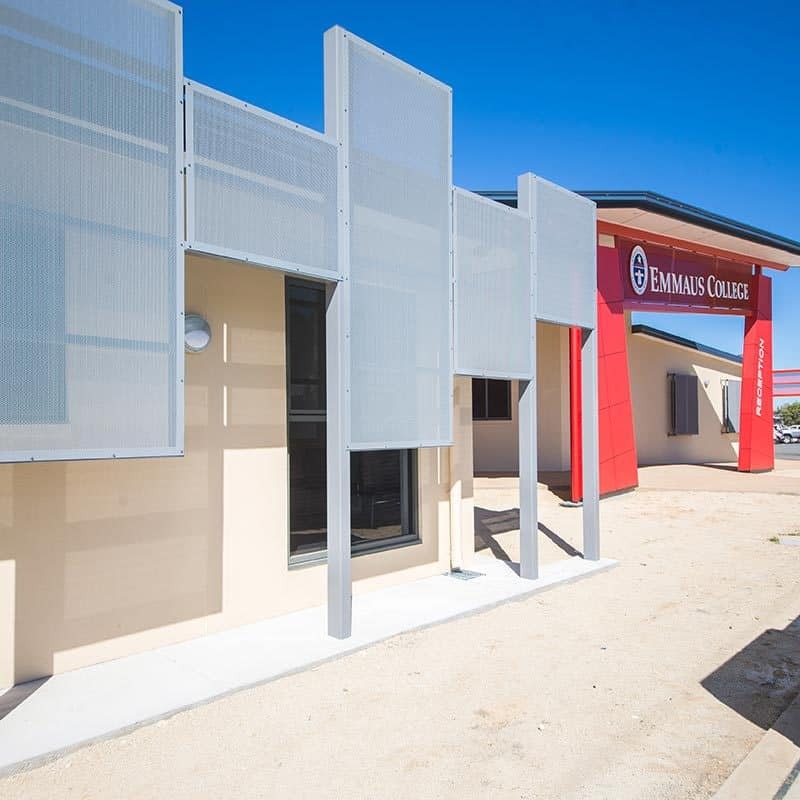 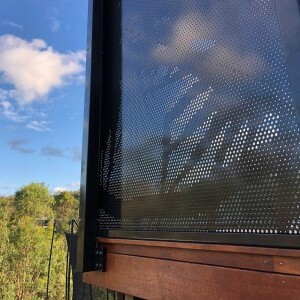 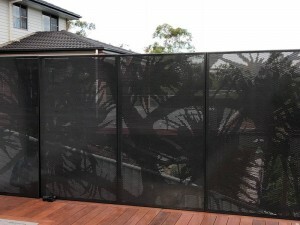 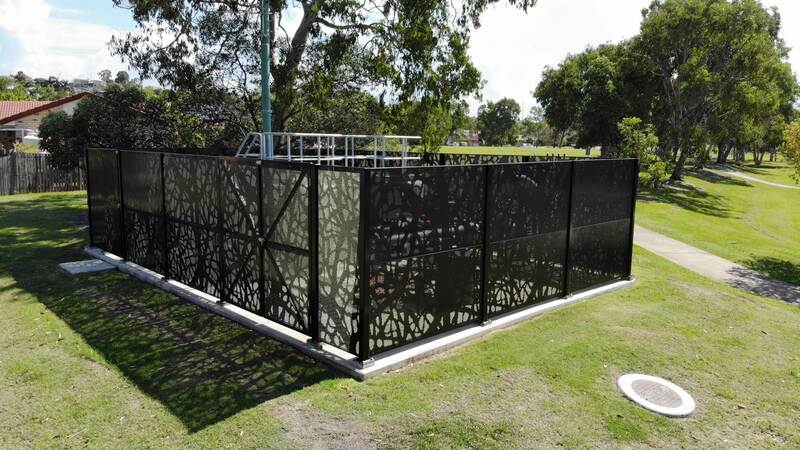 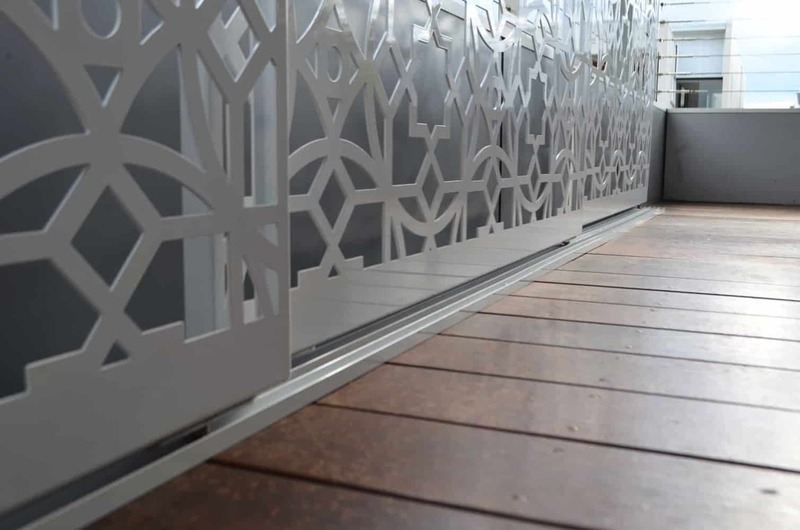 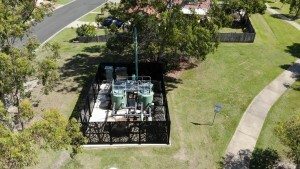 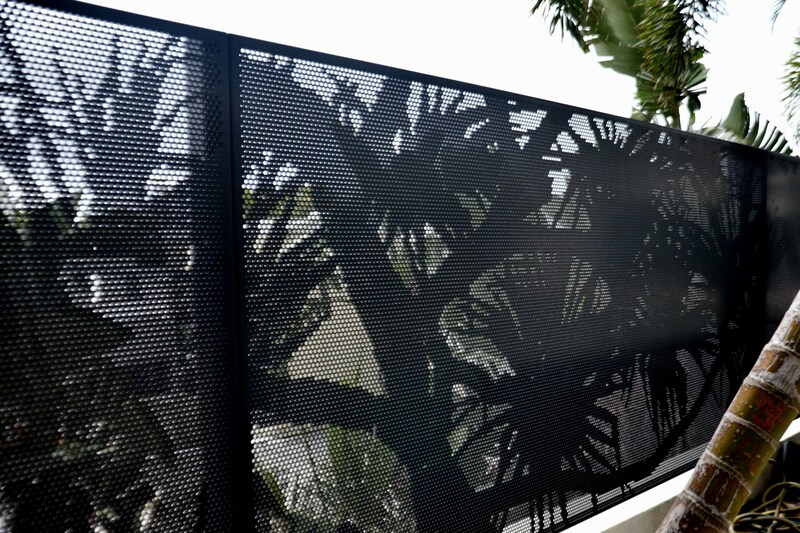 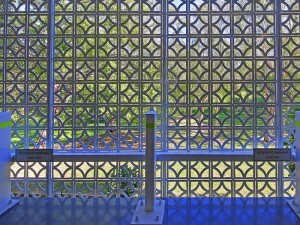 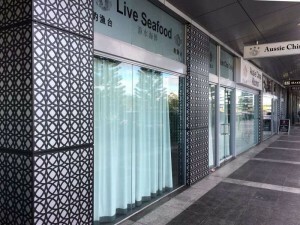 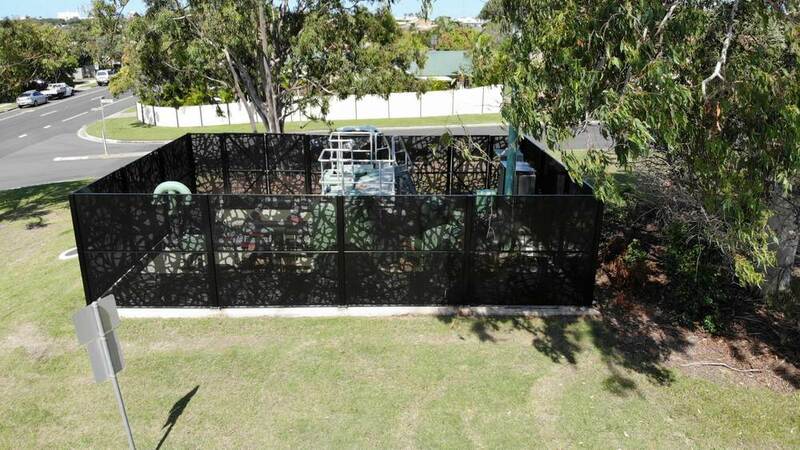 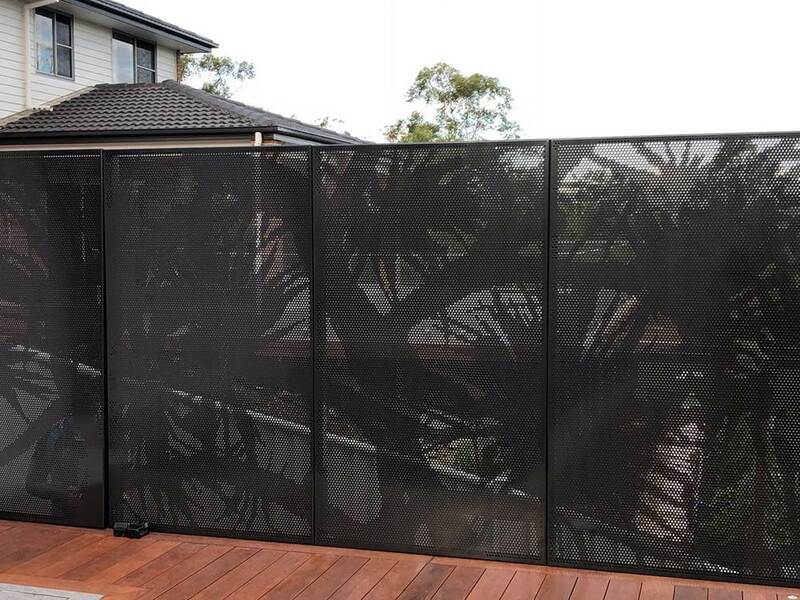 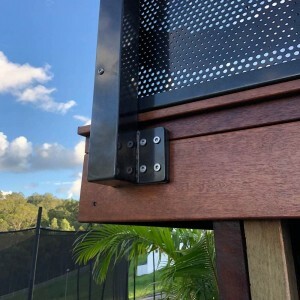 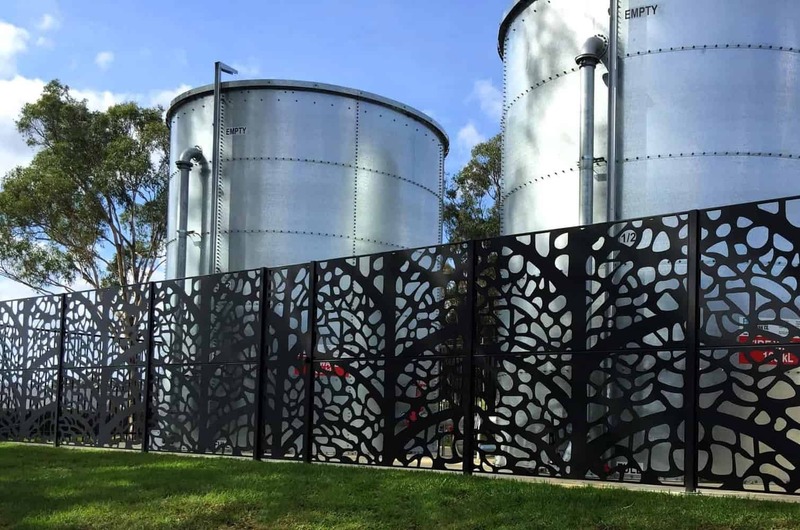 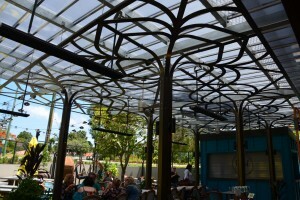 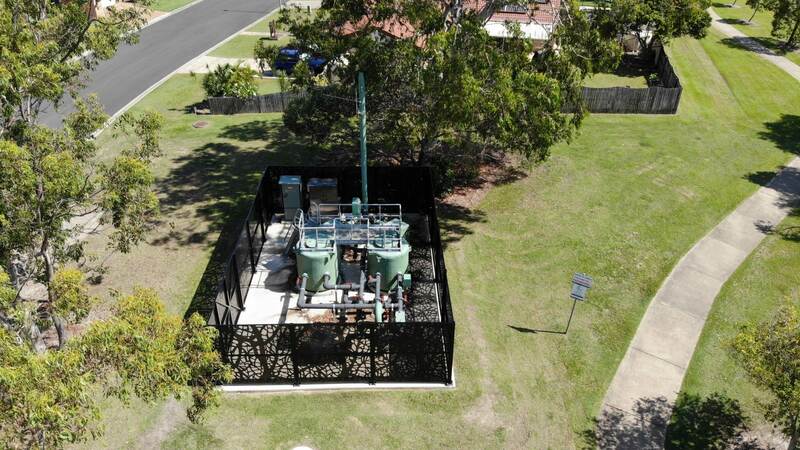 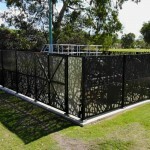 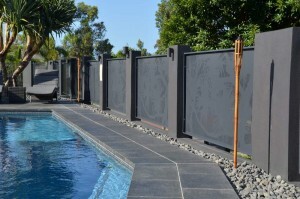 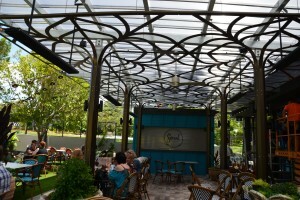 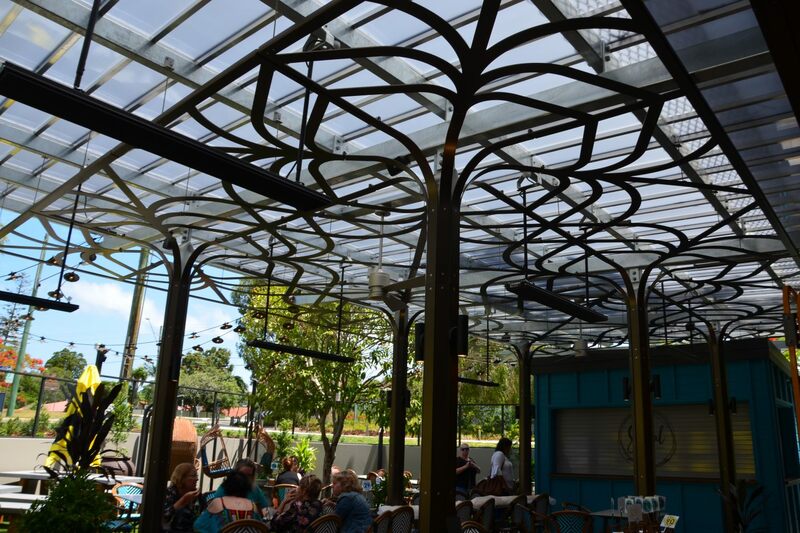 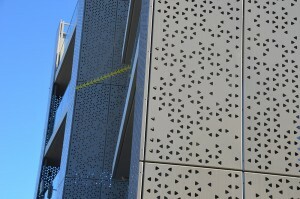 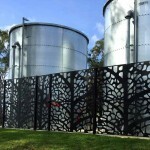 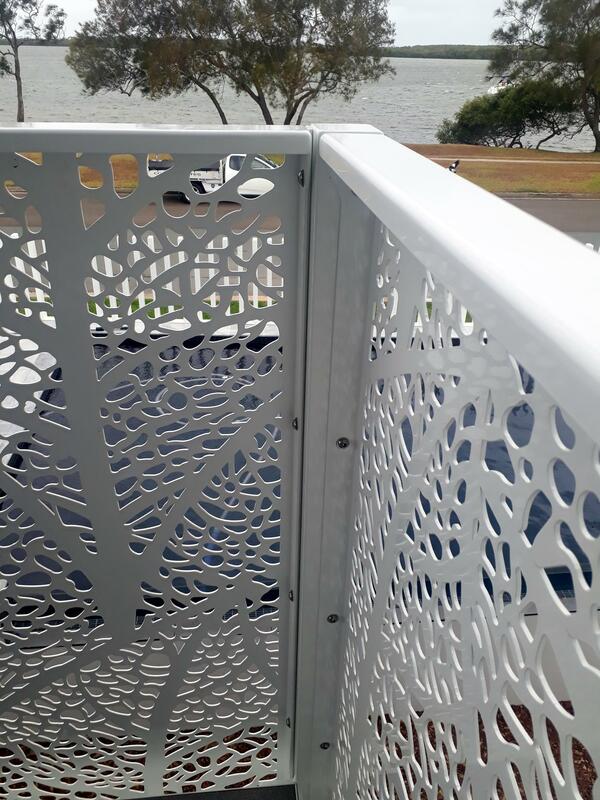 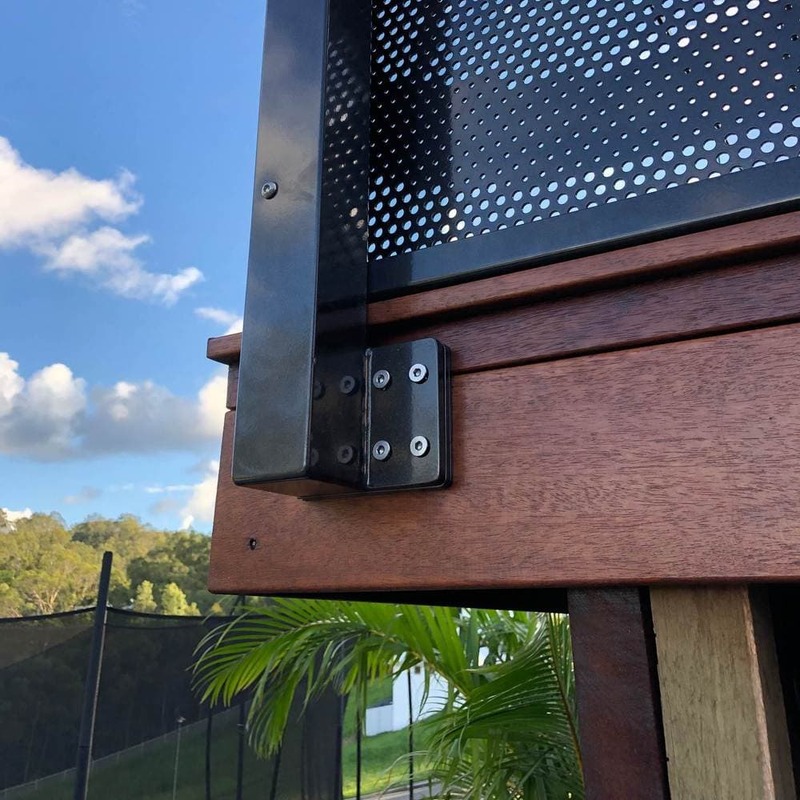 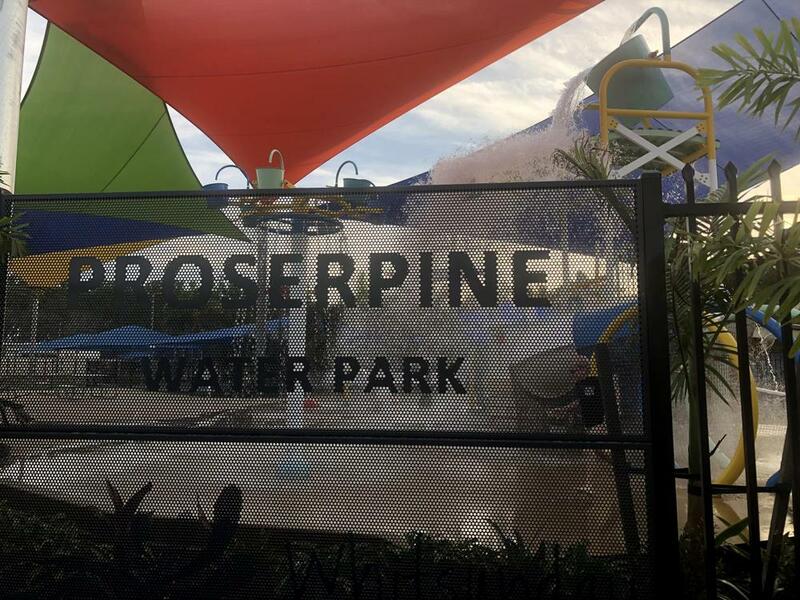 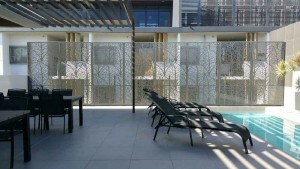 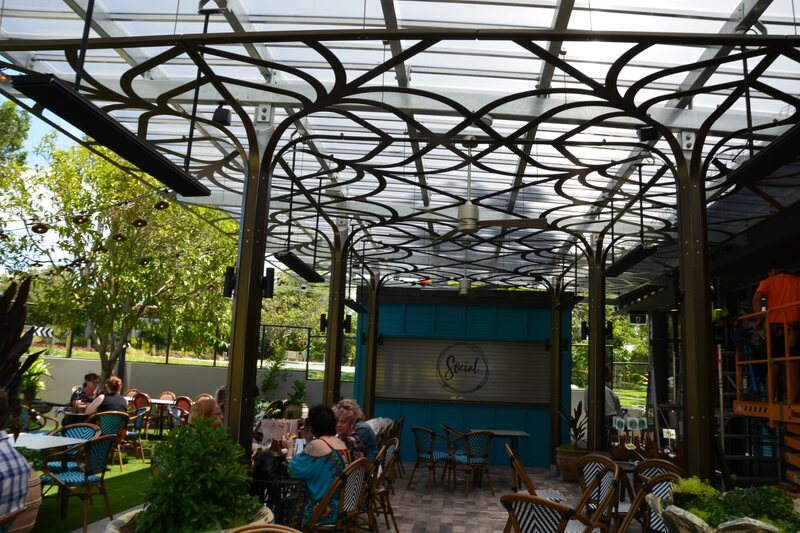 Special custom made perforated screens were designed and manufactured by DSD for EMF and the New Robina Kitchens. 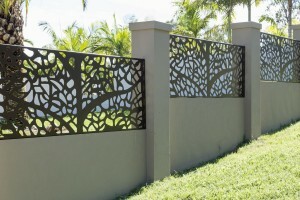 This custom design has been highlighted even more with colour choice. 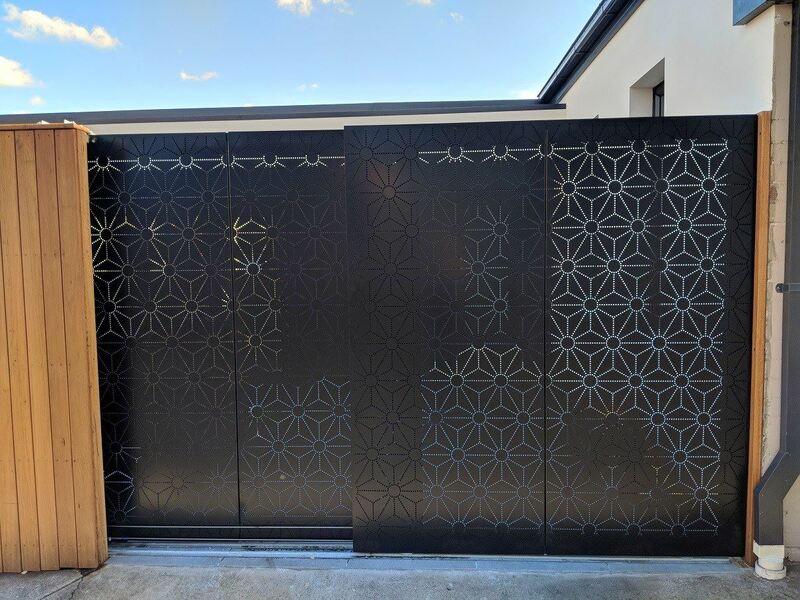 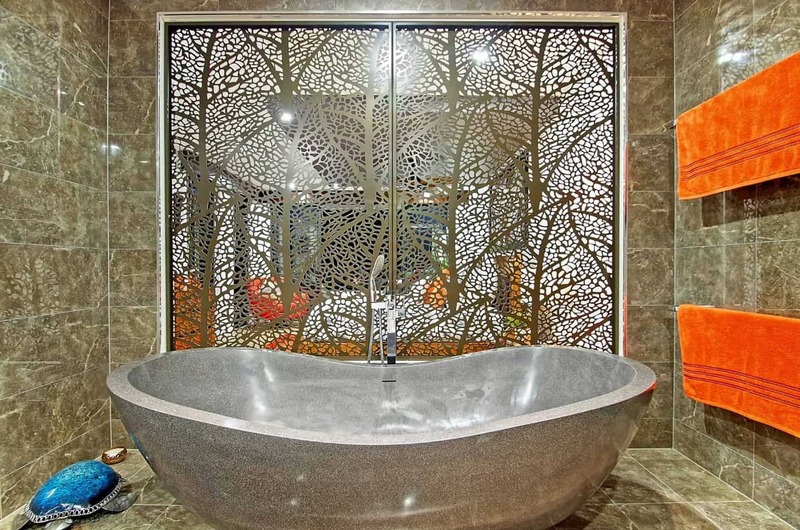 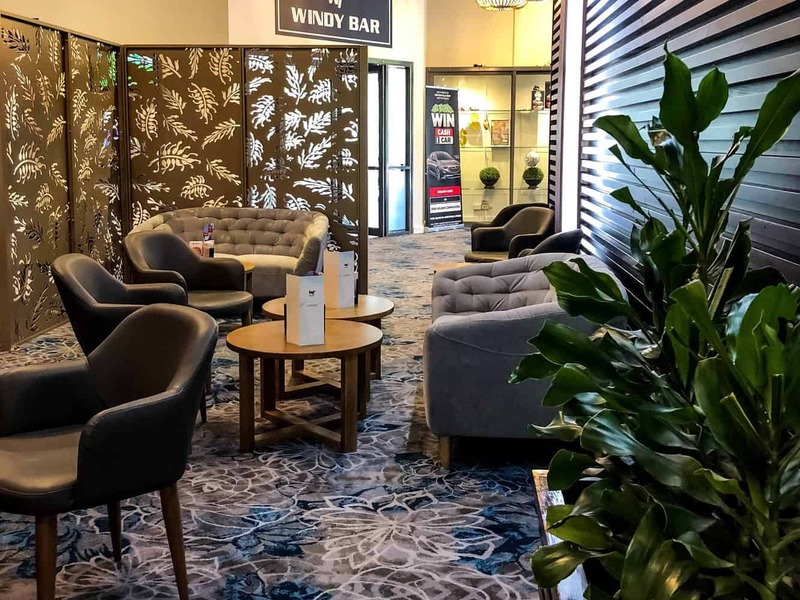 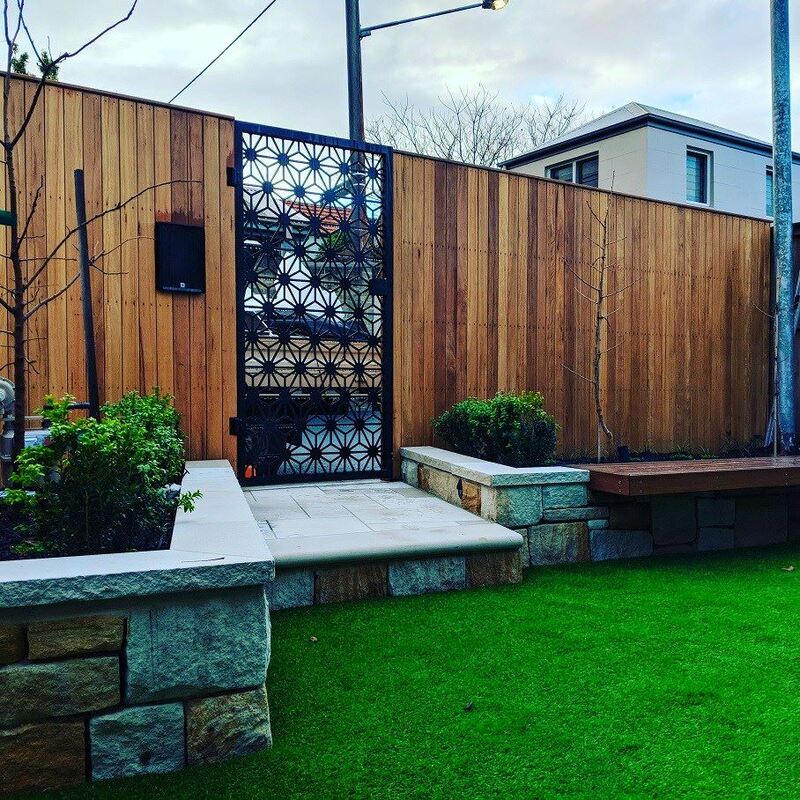 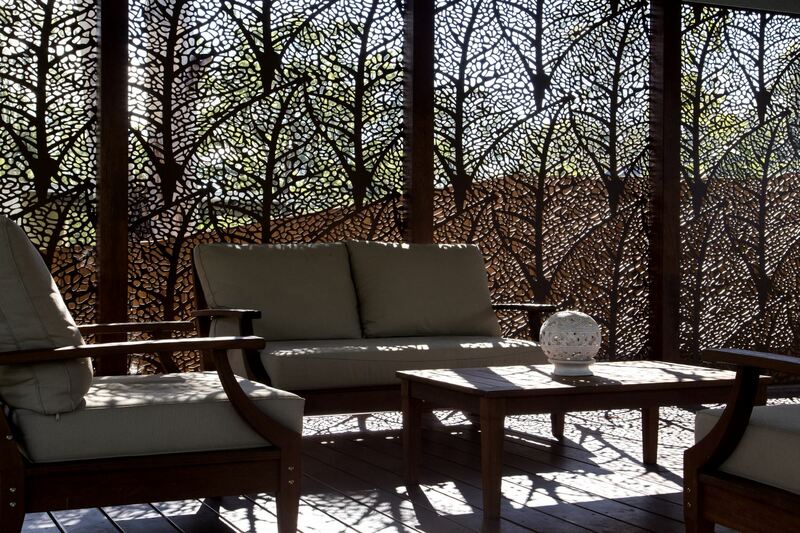 This supply only project using our Autumn Leaves design is a perfect example of how our decorative screens can be used to create beautiful yet functional spaces without compromising on style.